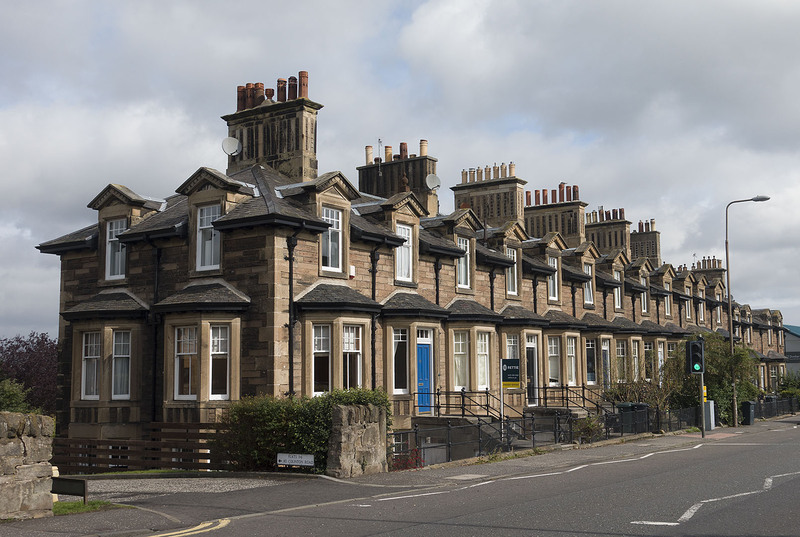 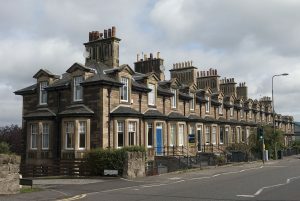 Glenlockhart Road near the junction of Colinton Road and Craiglockhart Avenue. 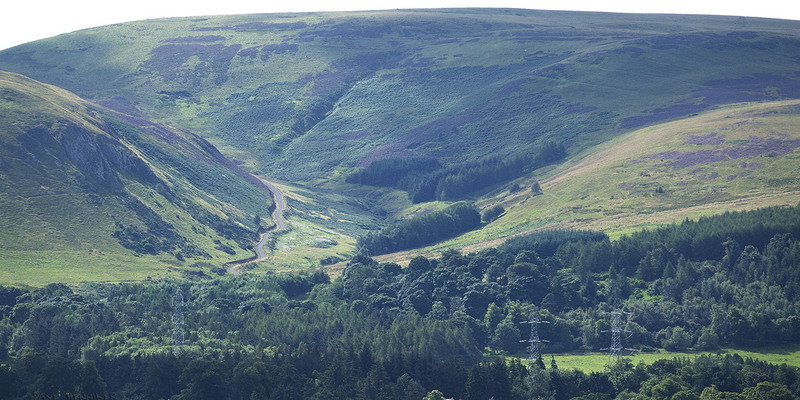 The A702 main road as it climbs south from Morningside to Fairmilehead and the Pentland Hills. 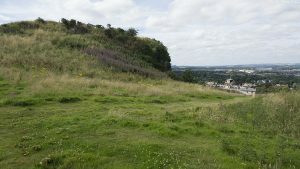 Another view, this time from further uphill just before the junction with Braid Hills Road. 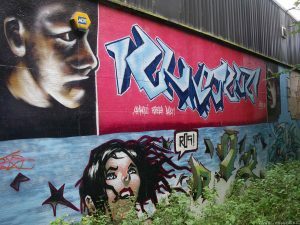 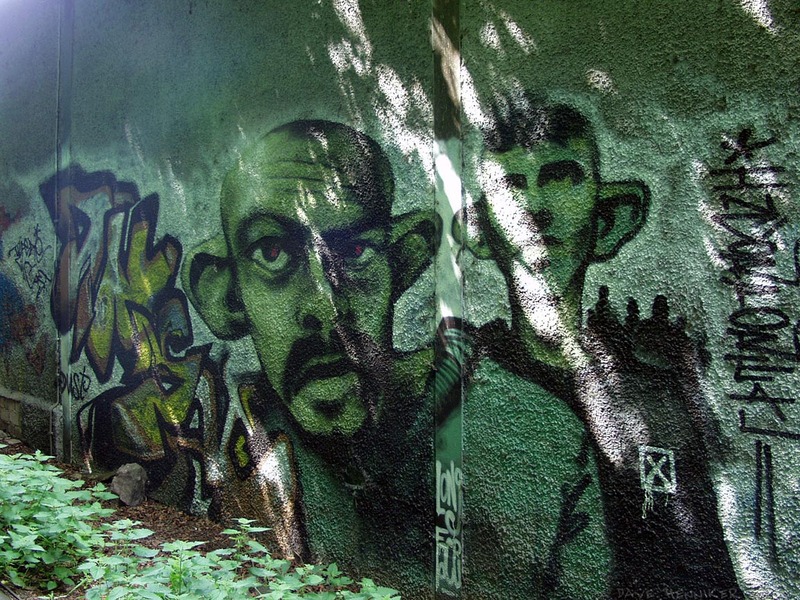 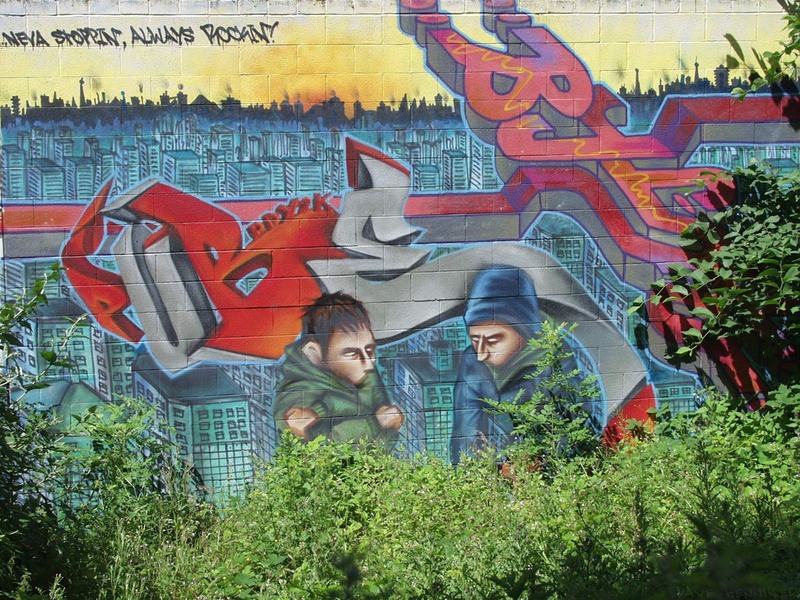 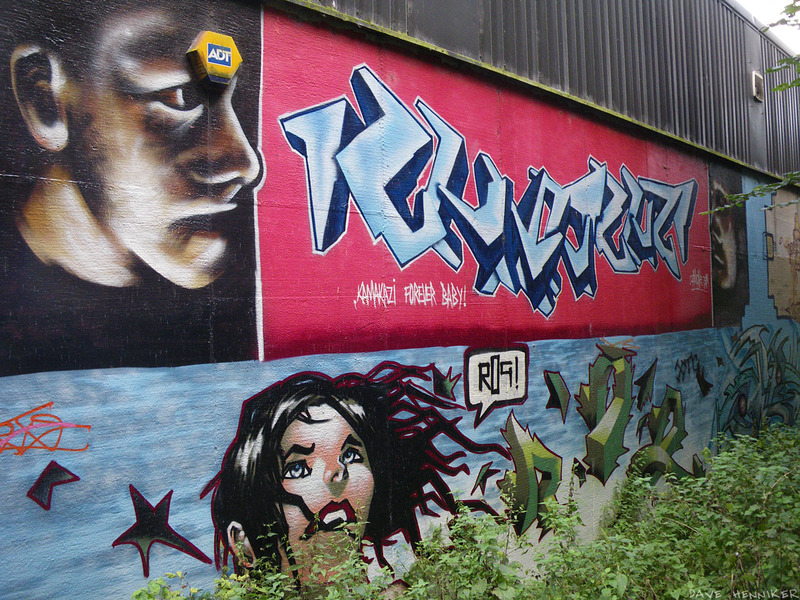 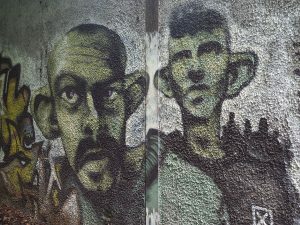 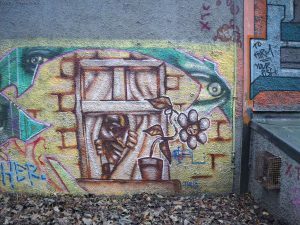 At the back of Craiglockhart Sports Centre bright sunlight illuminates the graffiti. 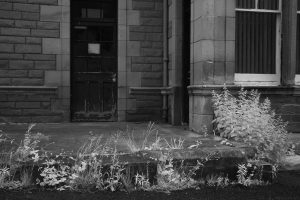 July 2005. This image has a cartoon-like background vaguely reminiscent of Robert Crumb's city scenes. 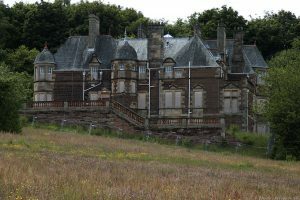 This one photographed September 2008. 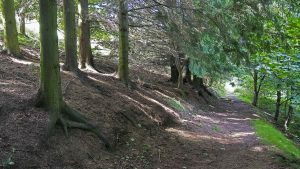 There's a short walk through the woods from Craighouse Road before the path starts to climb the hill. 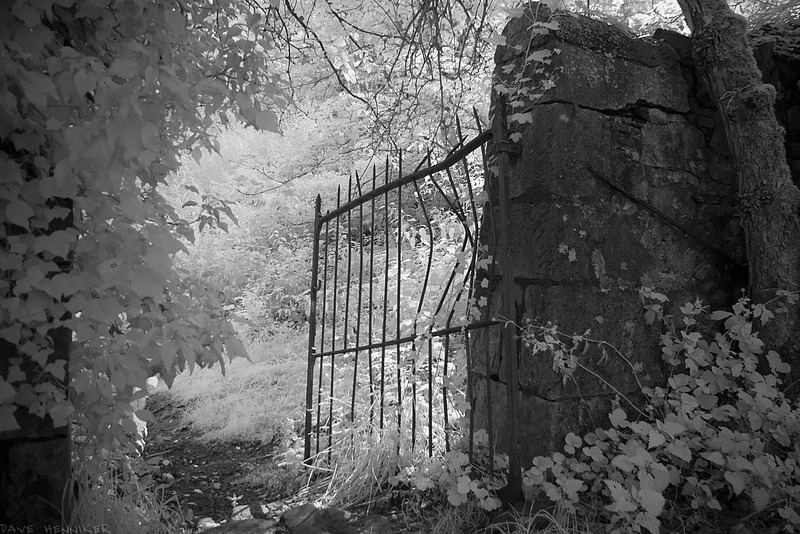 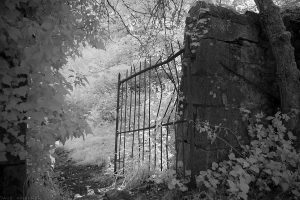 The path passes this old gate, photographed in infrared. 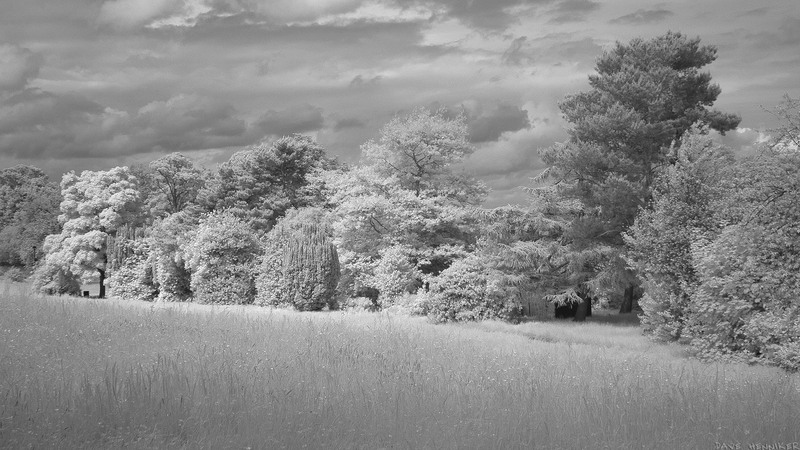 Shot in infrared August 2012. 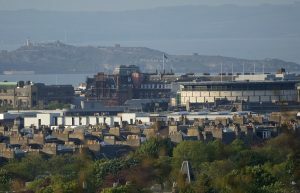 At the centre from left to right: Donaldson's, Haymarket chimney, St Mary's cathedral. 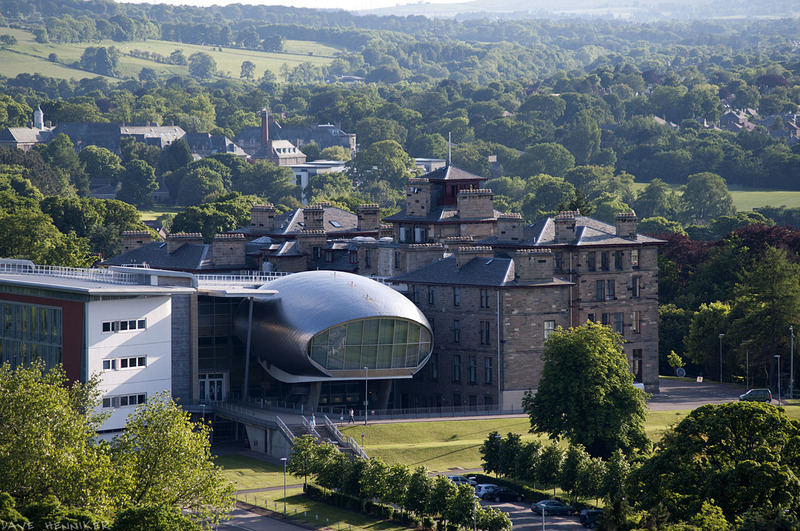 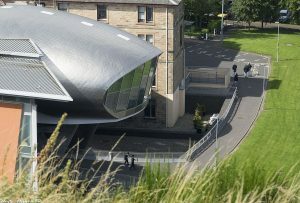 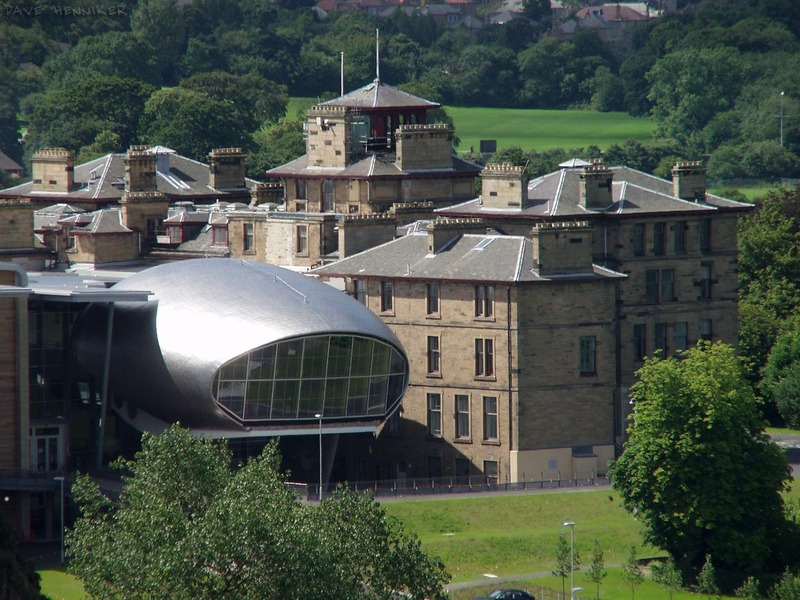 Looks like a space ship has landed at Craiglockhart Campus. 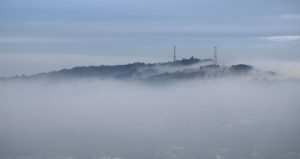 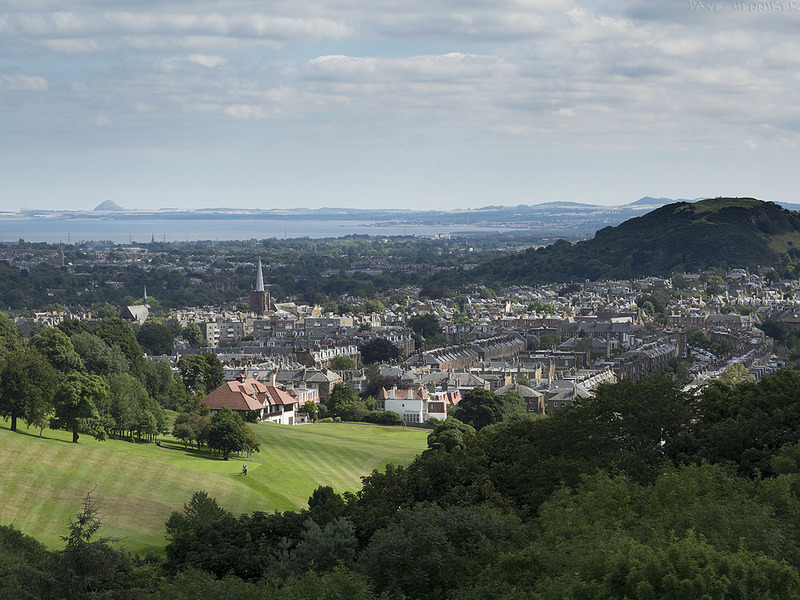 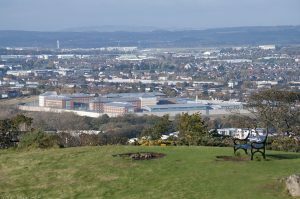 Photograph taken from the top of Easter Craiglockhart Hill. 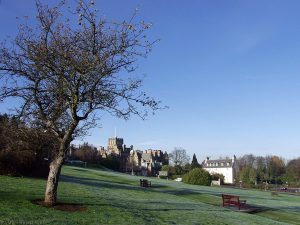 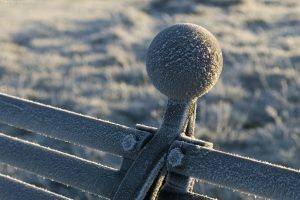 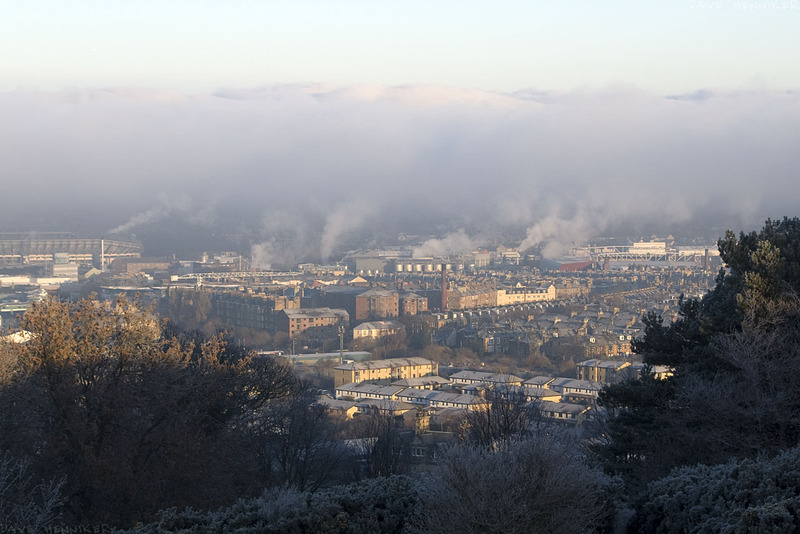 A frosty December morning at the top of Easter Craiglockhart Hill. 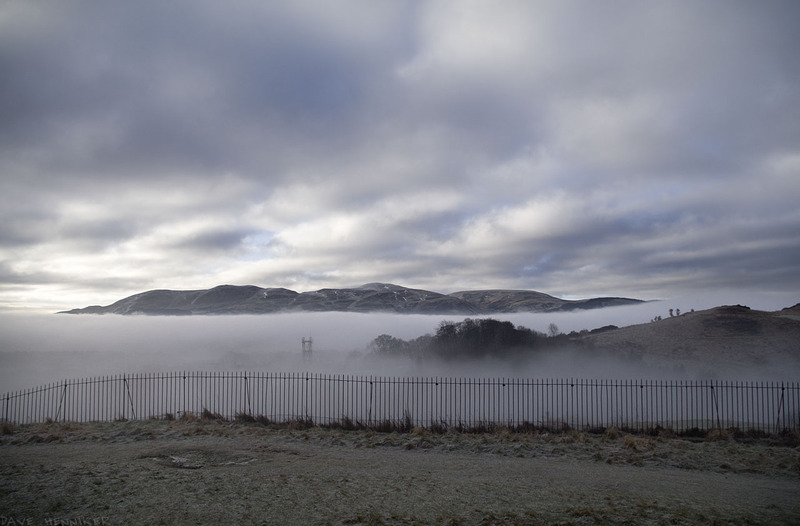 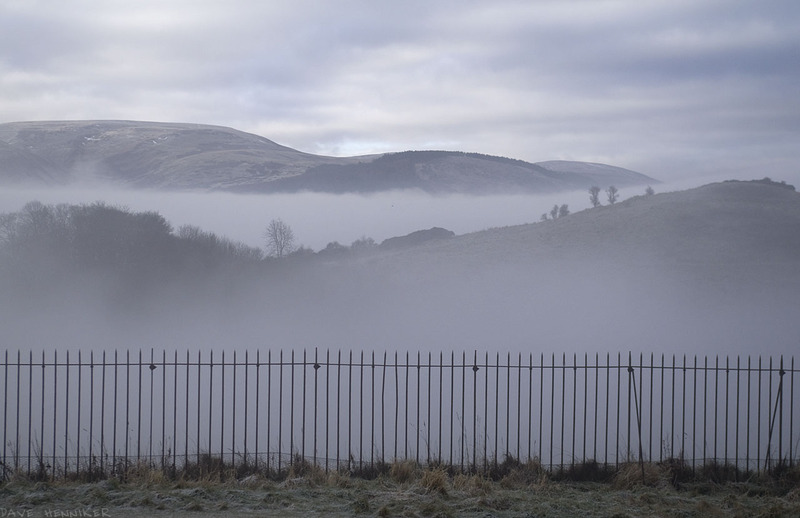 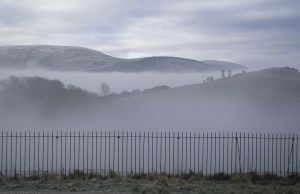 The Pentland Hills are in the distance beyond the mist lingering along the Edinburgh bypass road. The metal seat at the top of the hill is visible in Google Earth. 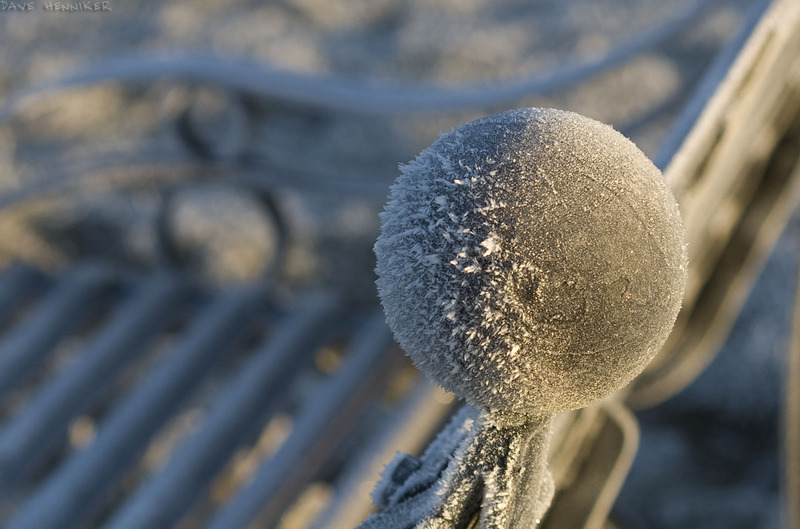 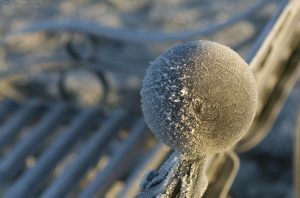 Here's a close-up showing some frost-decorated detail. This second shot shows how the frost crystals are larger in the shade. Looking over the frosty bushes and trees towards Murrayfield Rugby Stadium. 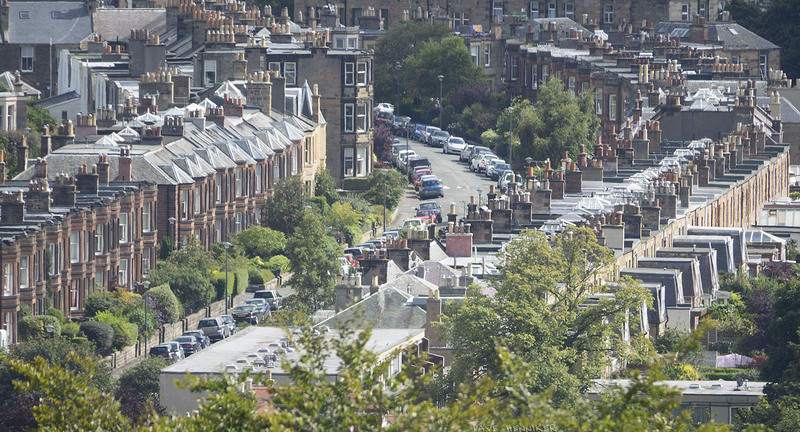 The sun is shining here and indeed down below on Gorgie. 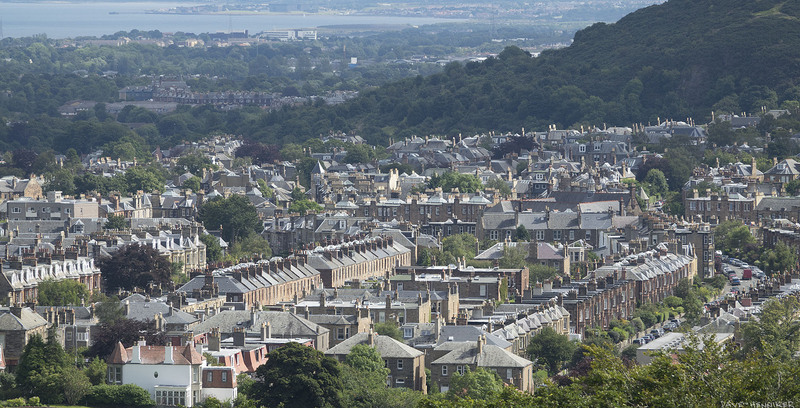 A different view with Polwarth Parish Church catching the sunshine in the mid-distance on the right. 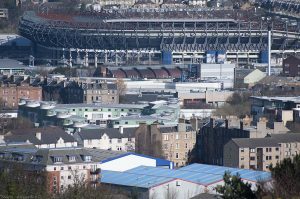 Looking north with Murrayfield stadium on the left and Tyncastle Stadium (Heart of Midlothian FC) on the right. The chimney at the centre belongs to the Caledonian brewery at Slateford. 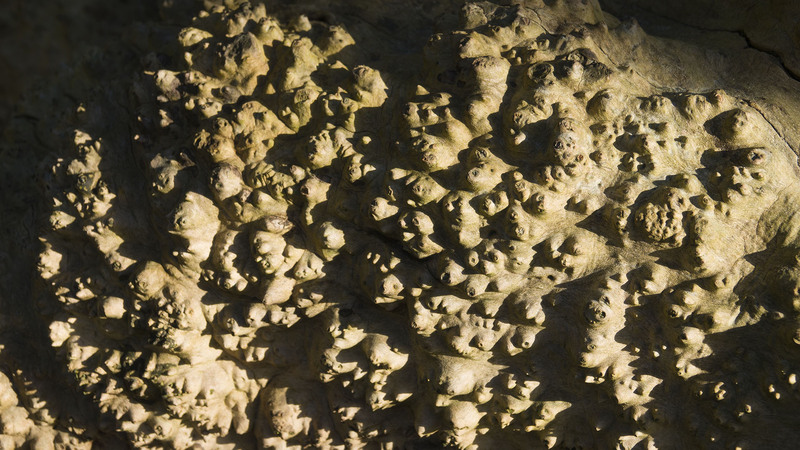 There's more detail in this zoomed-in picture. 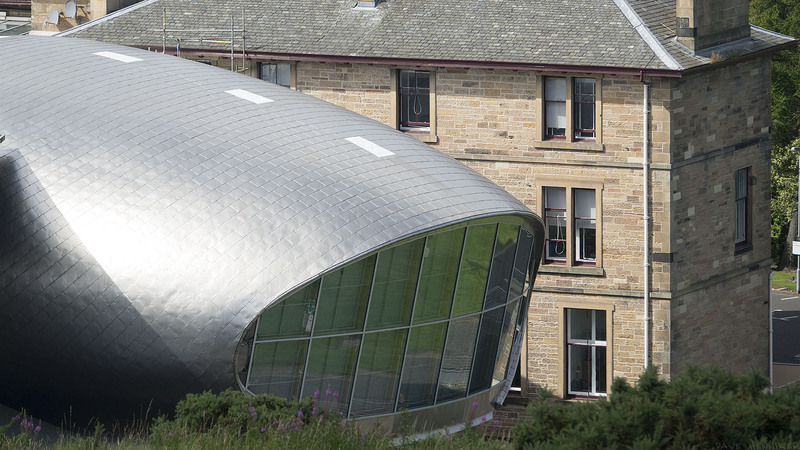 The shiny cylinders are at the north side of Wheatfield Place. 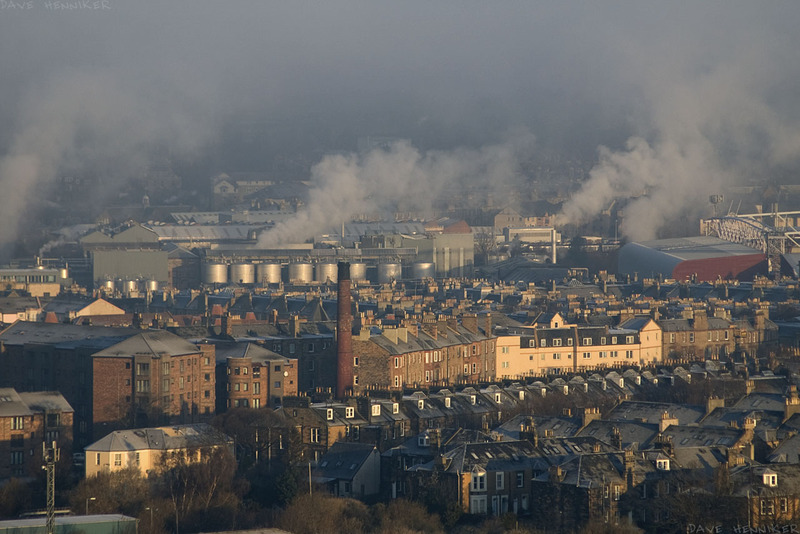 Somewhere near here, heroin is legally manufactured. 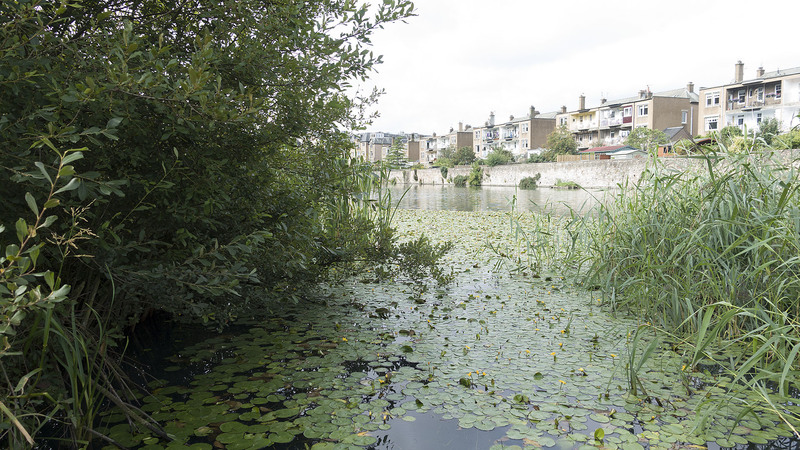 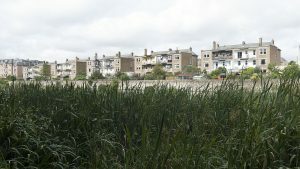 Not long ago, Meggetland was a green space at the north side of the Union canal. In this picture it appears as a brown space, soon to be covered in tarmac and houses. 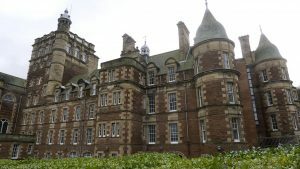 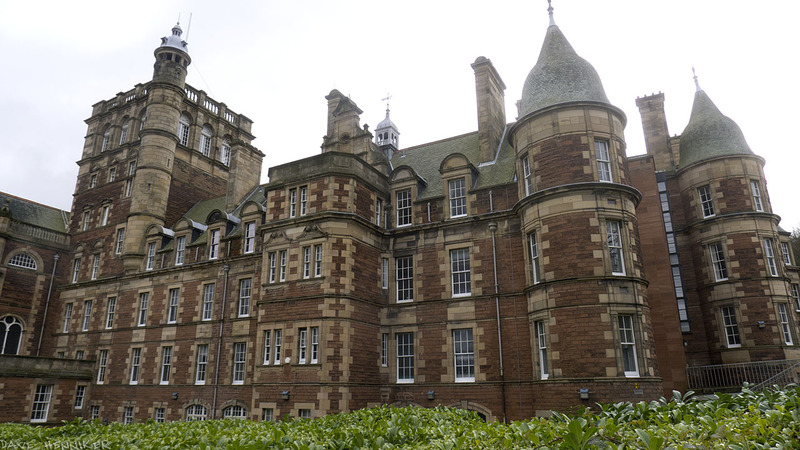 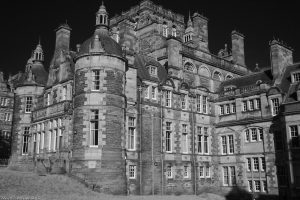 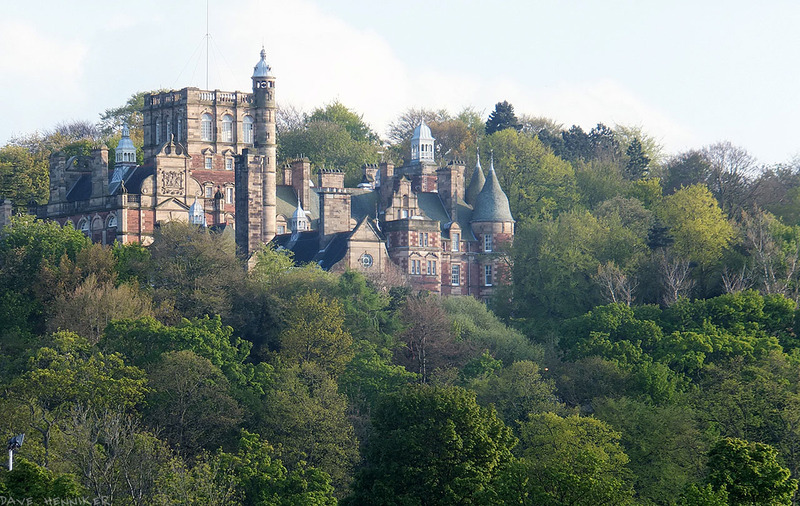 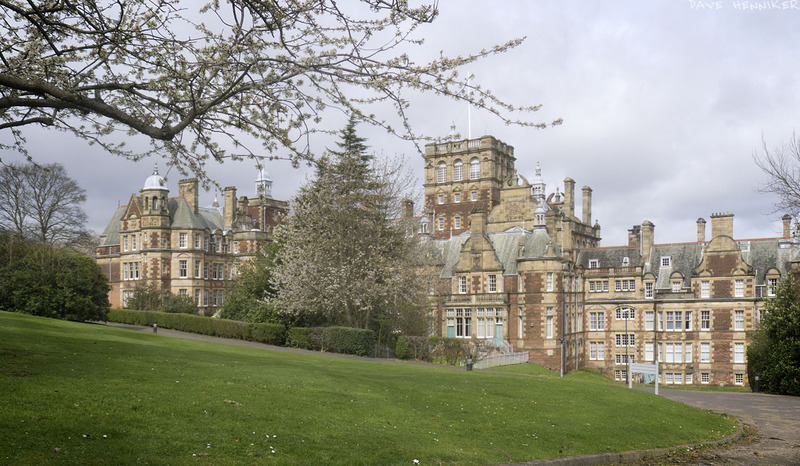 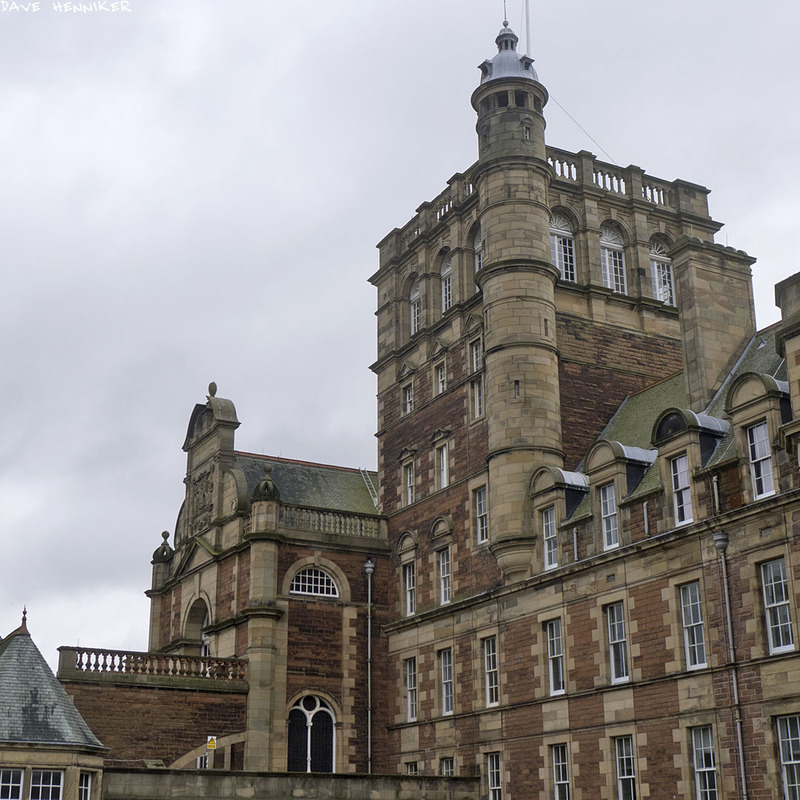 Now a university campus, this former psychiatric hospital has several fine buildings with magnificent views over the city. 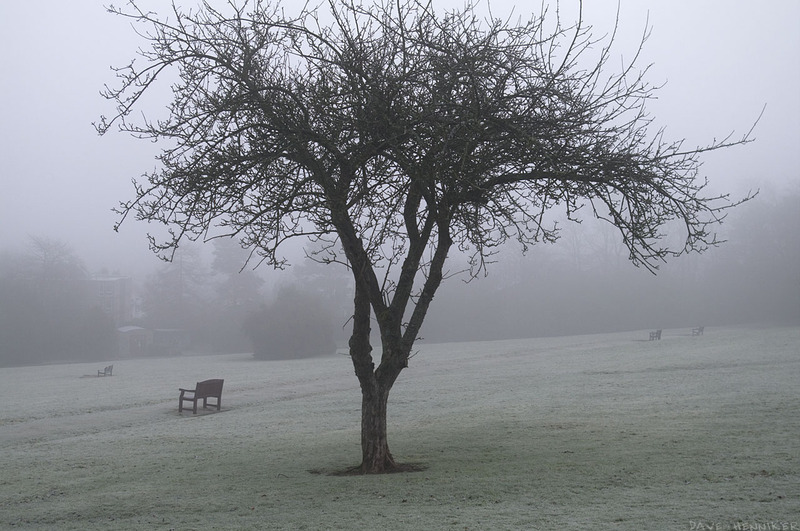 A foggy February morning adds a little atmosphere. 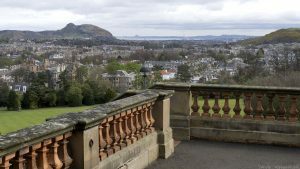 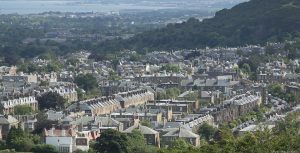 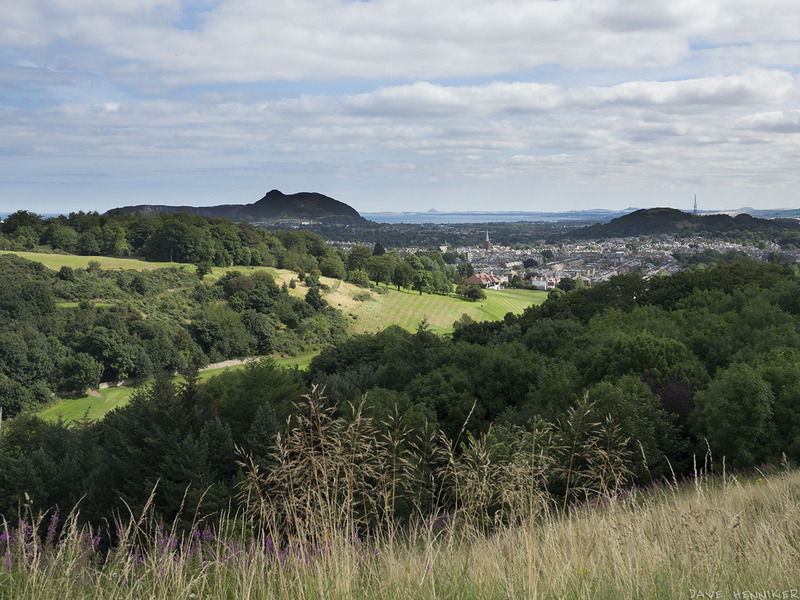 Continue walking up hill through the grounds and you'll reach the top of Easter Craiglockhart Hill affording this view of Wester Craiglockhart Hill with the Pentland Hills in the background. 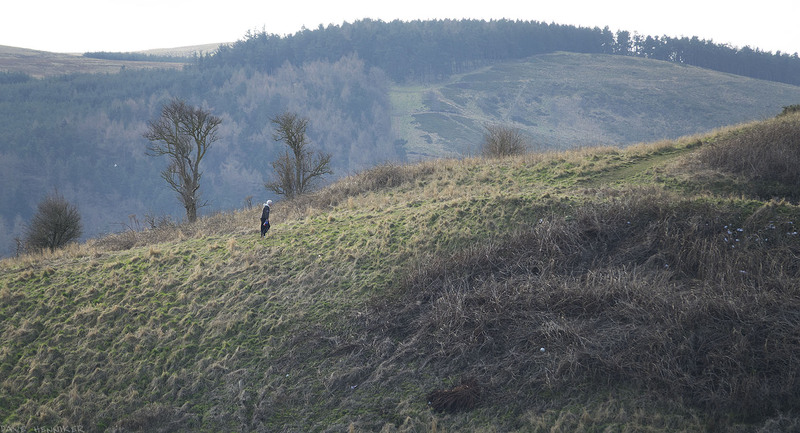 A wider view of the scene above. 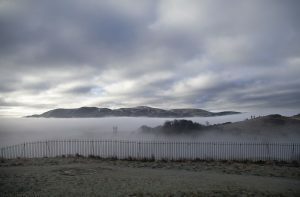 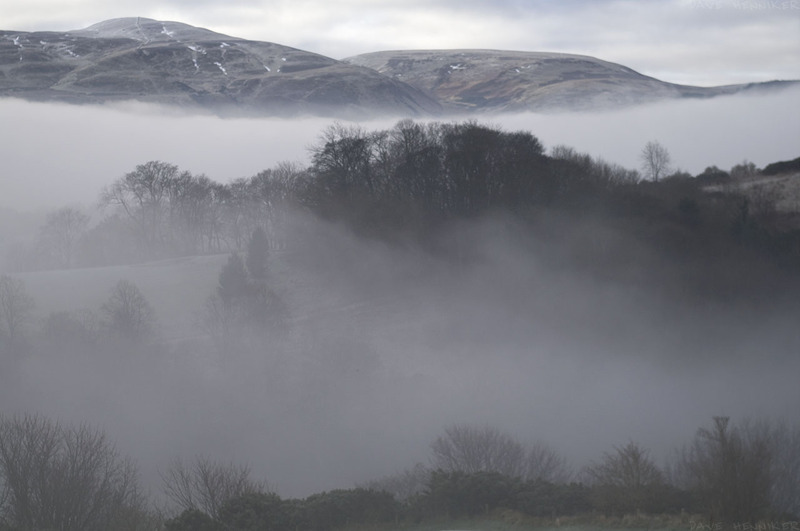 Beyond Wester Craiglockhart Hill to the south, the Pentlands rise out of the mist, still with a little snow here and there. 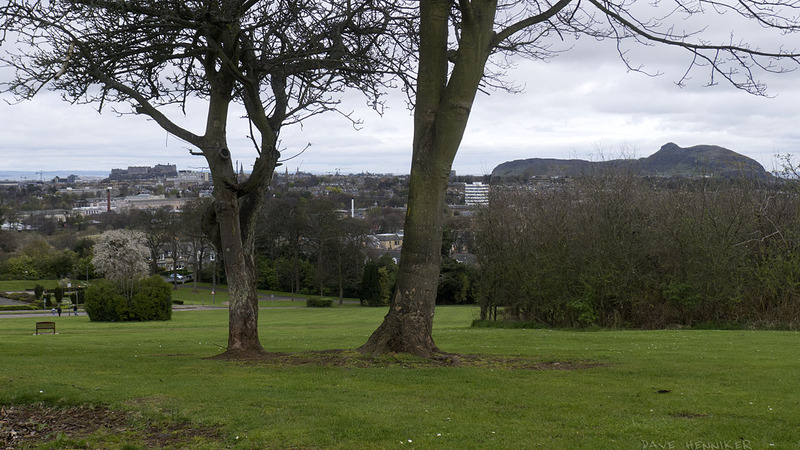 A tighter shot, zoomed in on Wester Craiglockhart Hill. 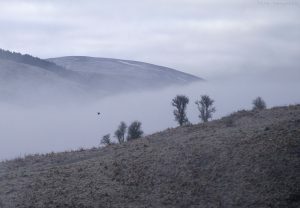 Allermuir hill is the higher Pentlands hill, separated from Capelaw to its right by Howden Glen. 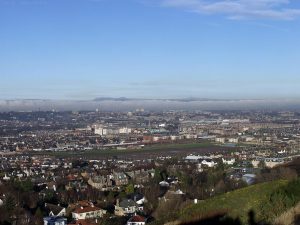 Beyond the manicured Merchants of Edinburgh golf course the fog conceals Firrhill and Oxgangs districts. 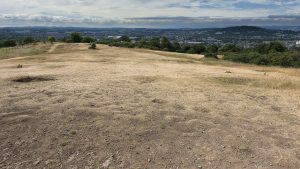 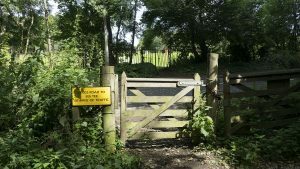 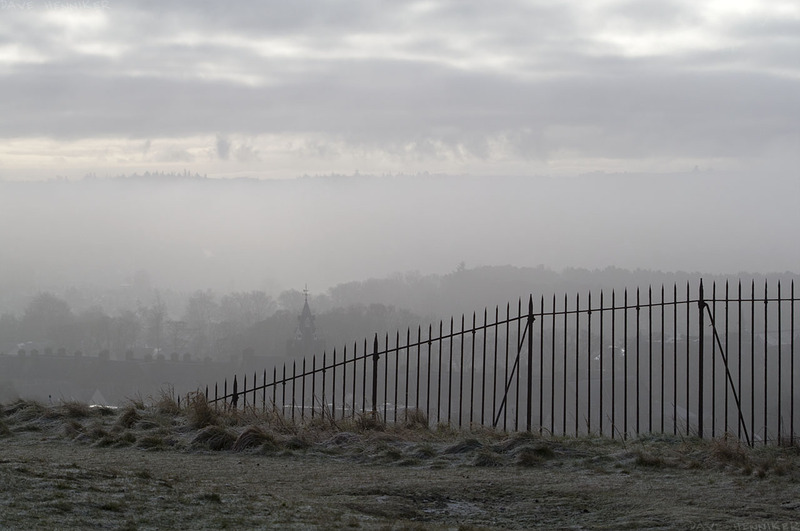 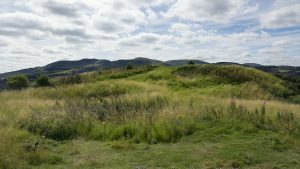 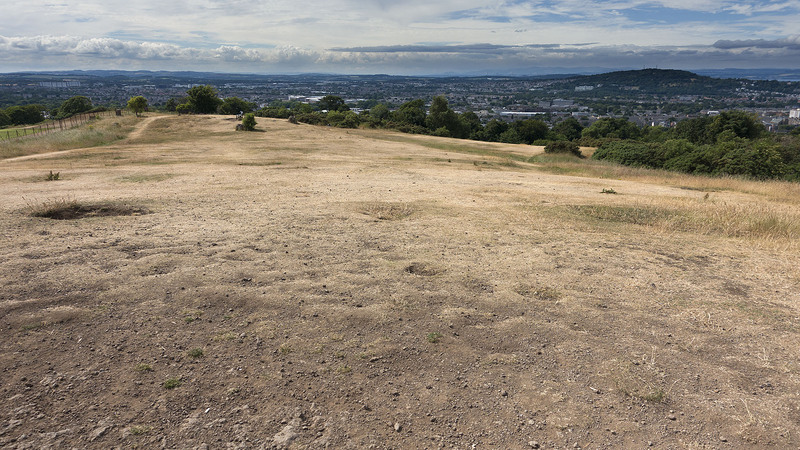 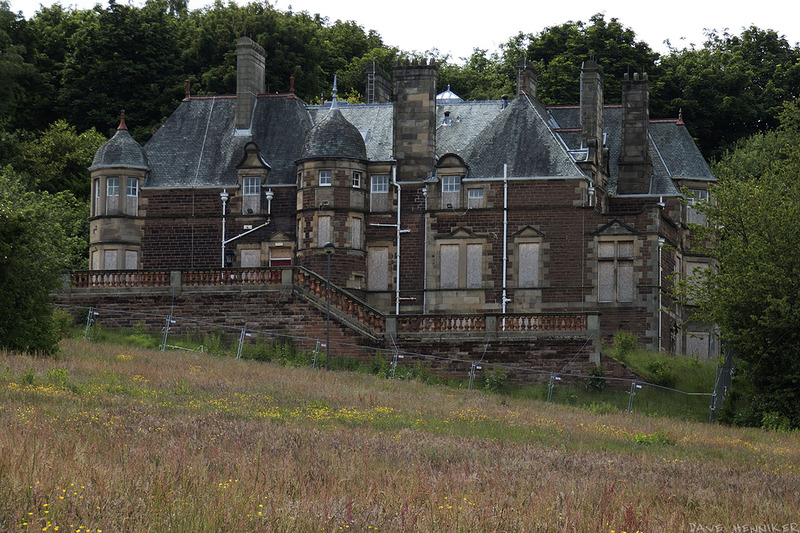 The golf course virtually cuts off public access to Wester Craiglockhart Hill. 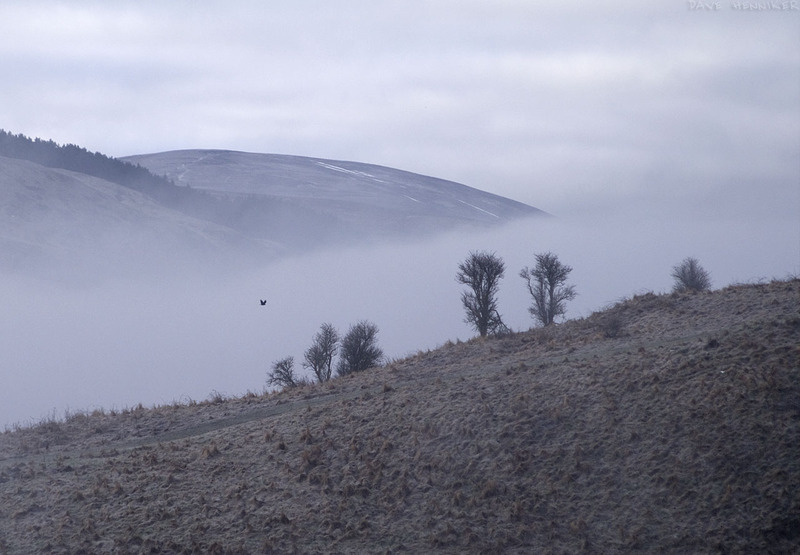 A bird flies across the scene in this long-lens view towards the woods on White Hill near Bonaly at the edge of the Pentlands. The fence at the golf course's northern bounday dips down hill towards Craiglea Place. 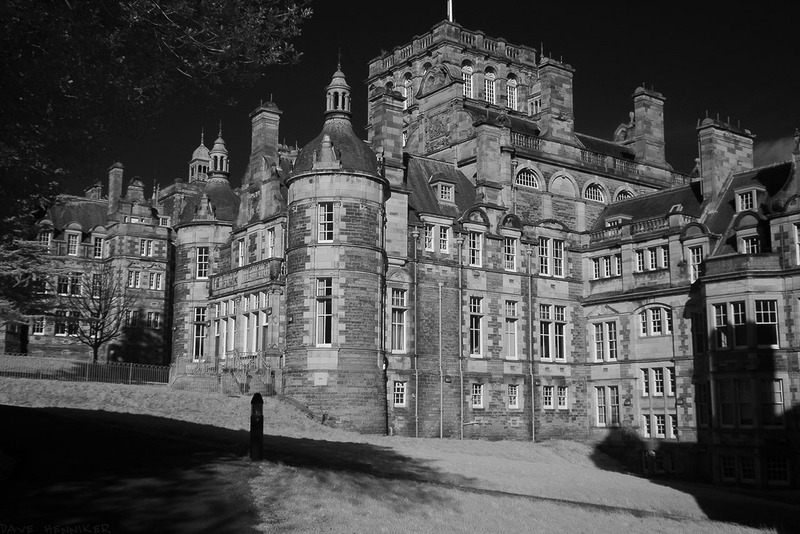 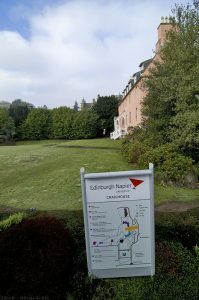 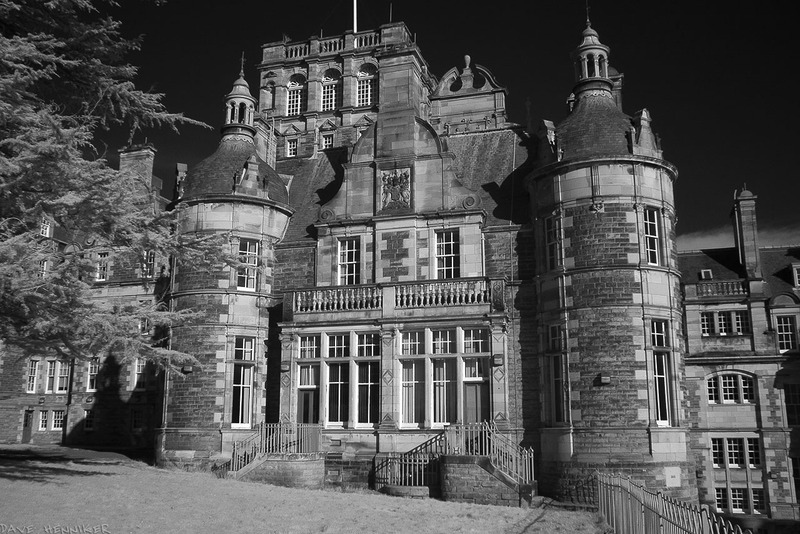 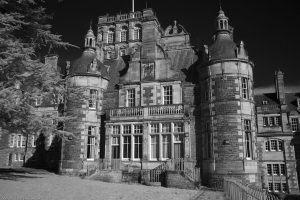 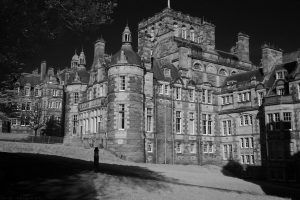 A later photograph of Napier University Craiglockhart Campus. 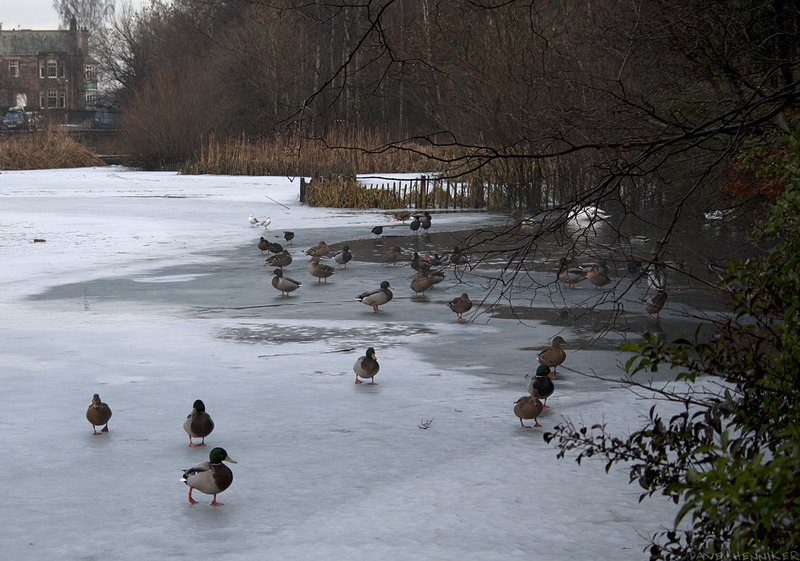 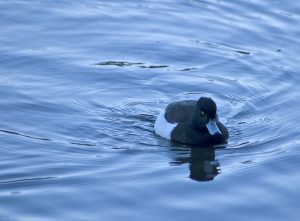 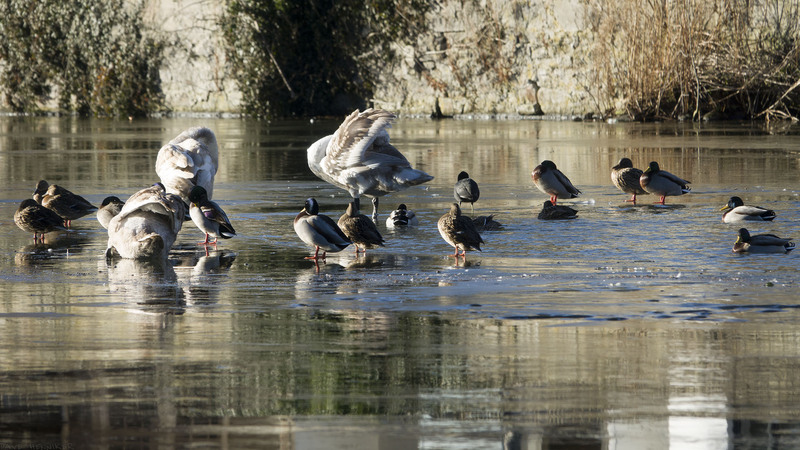 Three pictures of tufted ducks, less frequent visitors than the more common mallards at Craiglockhart Pond. Only the rear end is visible here as the duck dives down for some pond weed. 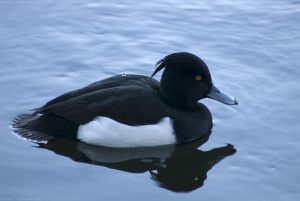 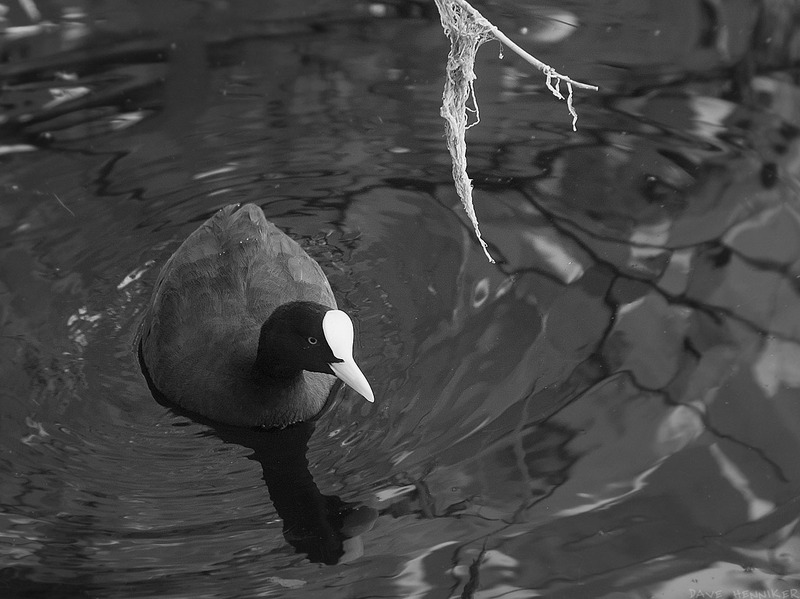 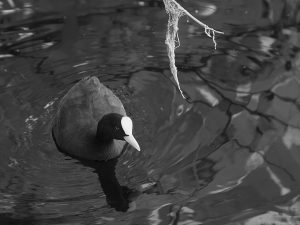 In this profile shot, the duck's tuft is more visible. 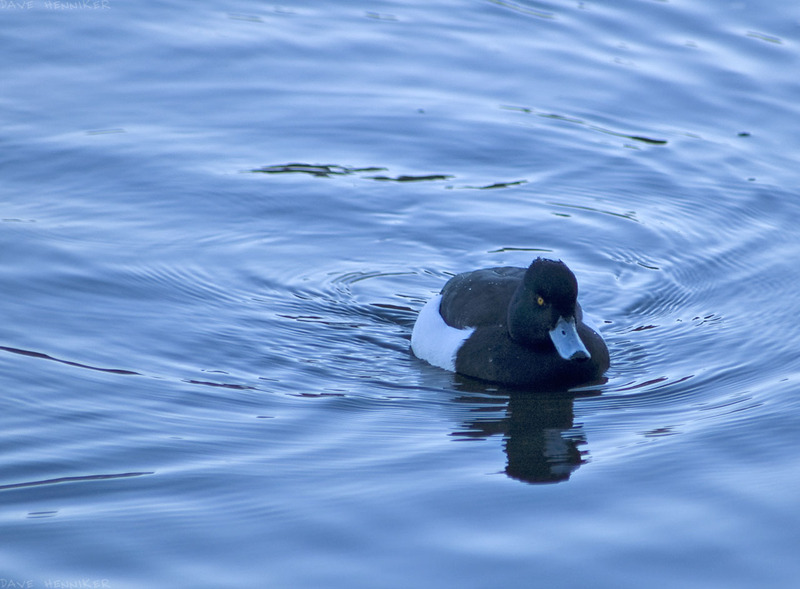 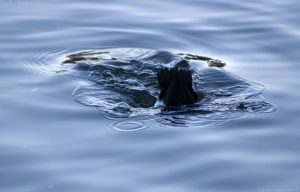 Notice how the tail feathers sit on the water's surface without breaking the surface tension. 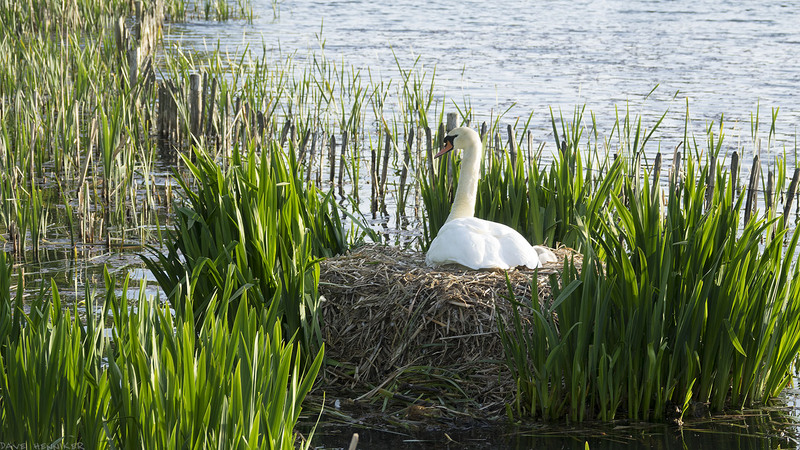 Most of this swan family are sleeping. 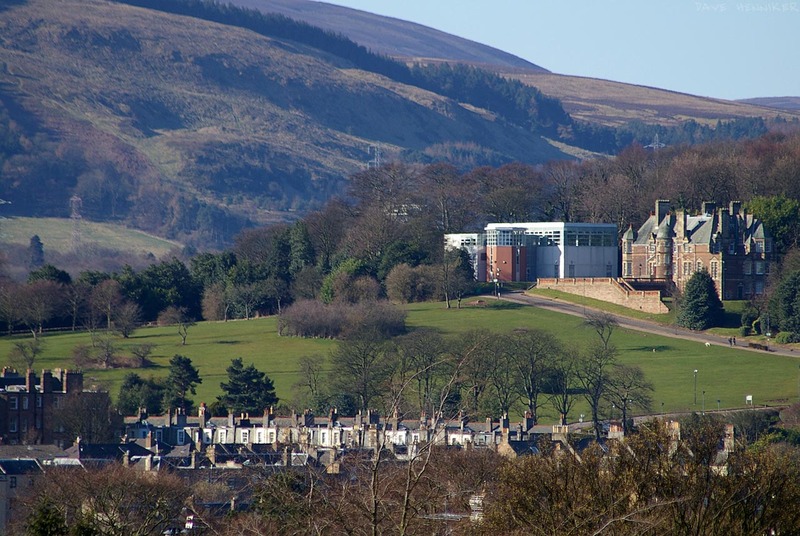 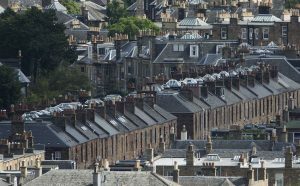 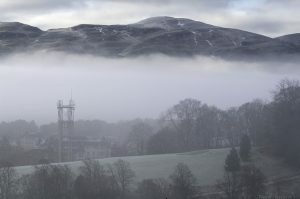 Photographed from my roof through a x10 zoom lens is this picture of Napier University's Craighouse Campus. 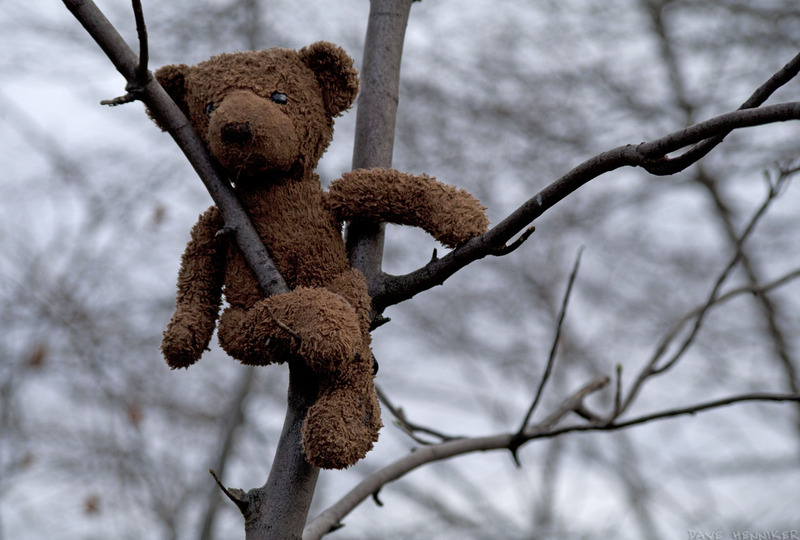 Looking sad is this lost teddy bear. 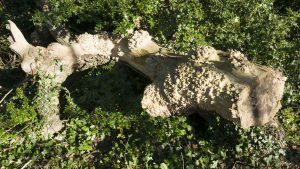 Whoever found it on the path along Craighlockhart Hill's wooded ridge was thoughtful enough to place it in prominent view. 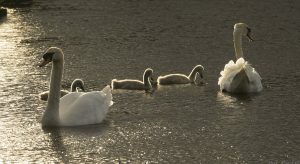 5th March 2011. The end of July 2010 brought Edinburgh sunny intervals and scattered showers which gave interesting changes of light - which I tried to capture just after 8pm. The middle distance is rainswept but further away it's clear enough to see the distant mountains. 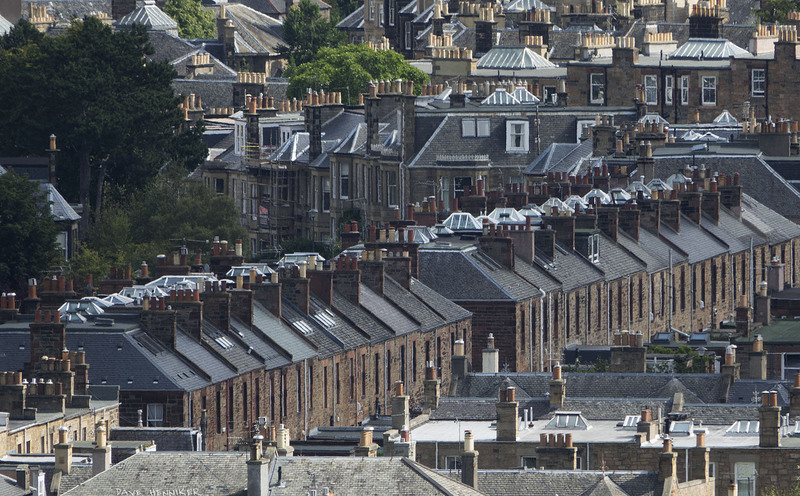 In the foreground suburban homes are switching their lights on. 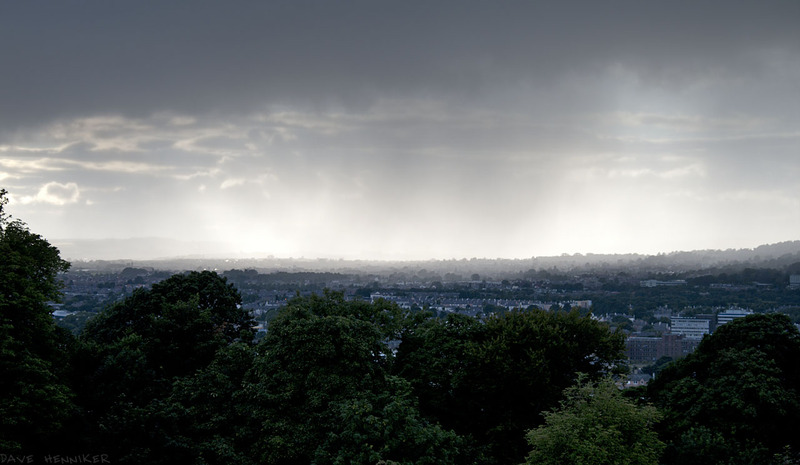 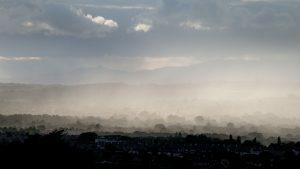 Rain and low sun combine to give a subtle effect in this view of Corstorphine Hill. The green patch on the left is part of Carrick Knowe golf course. 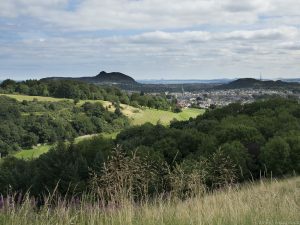 Wester Craiglockhart Hill is in the middle distance and beyond lies White Hill in the Pentlands which overlooks the Bonaly area. 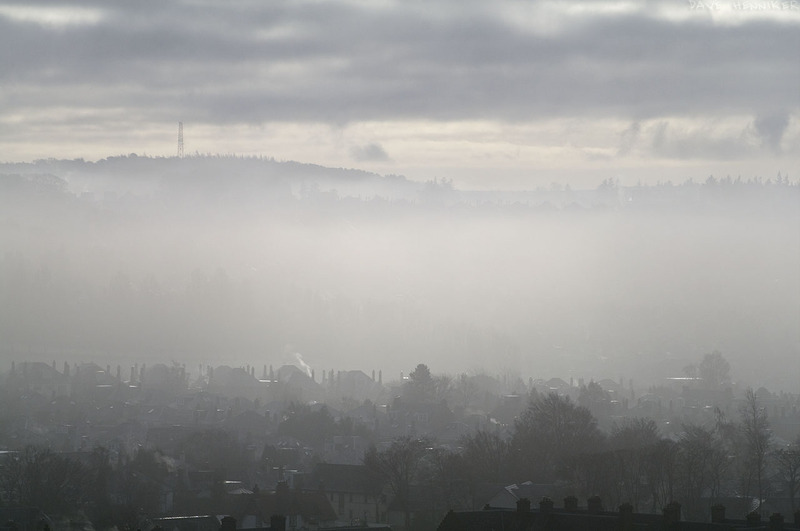 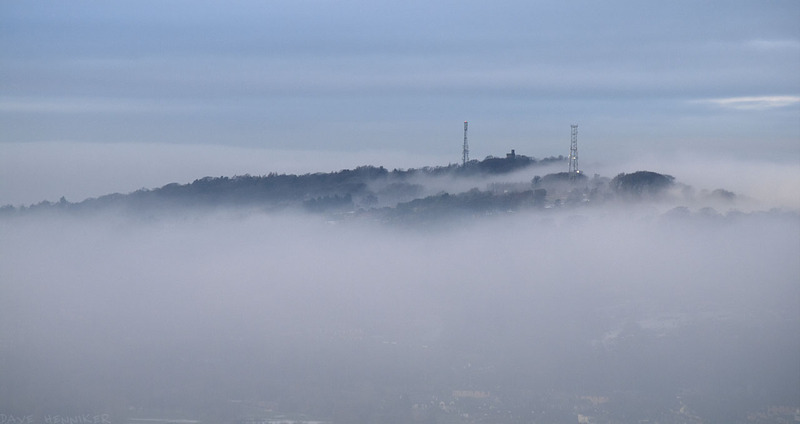 The top of Corstorphine Hill appeared and disappeared whilst we watched. 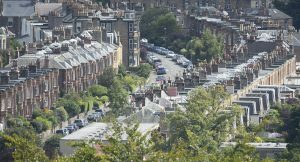 Myreside Road changes into Craighouse Road as it climbs the steep hill. 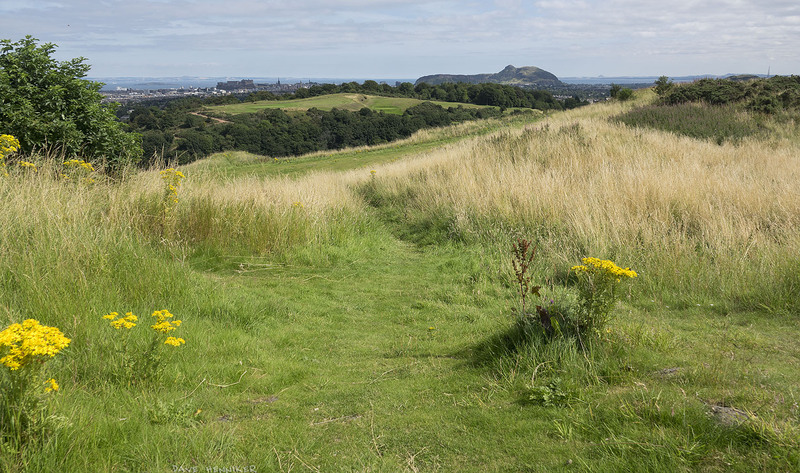 Off to the right is the entrance to Craiglockhart Hill Conservation Area. 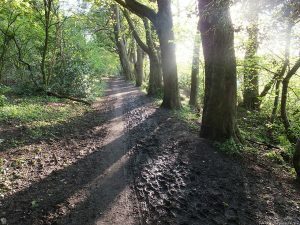 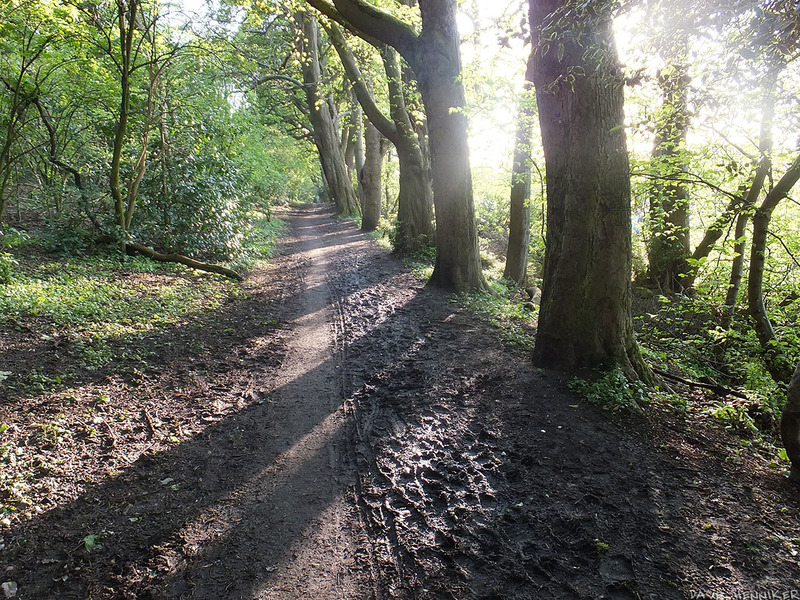 After rainy weather in May 2012 the footpath through the trees was rather muddy at first. 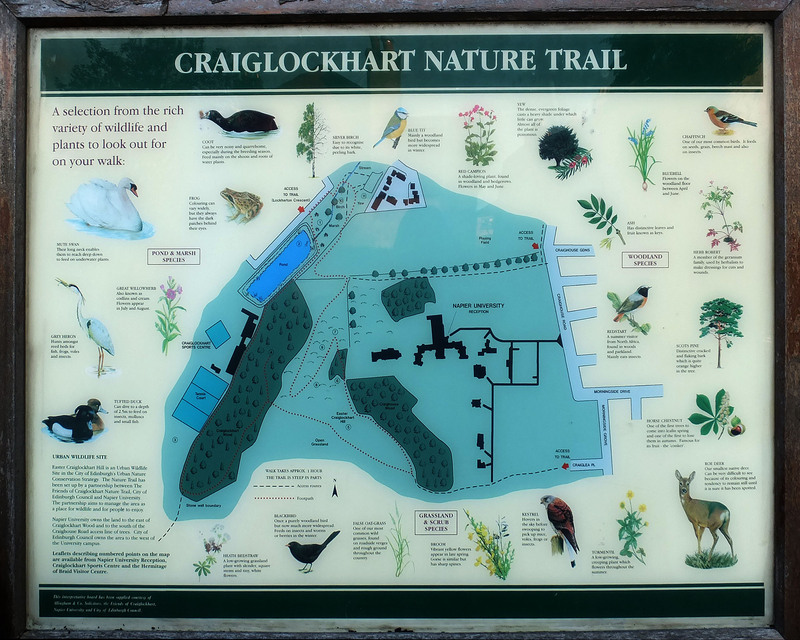 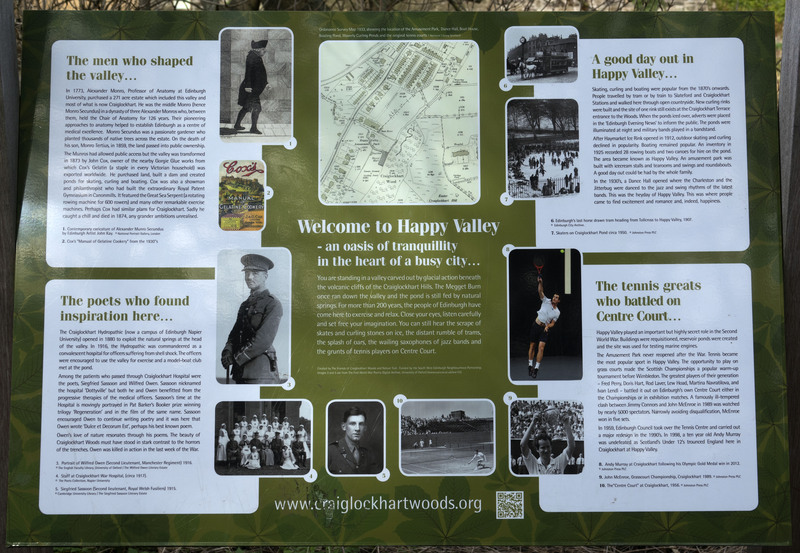 I've left this image of the Nature Trail map poster quite large so that the text can be read if you zoom to actual size in your browser outside the gallery. Looking south east along the line that passes under the Union Canal and Colinton Road. 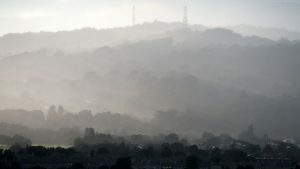 Beyond the glowing avenue of trees are two radio masts on Braid Hill. 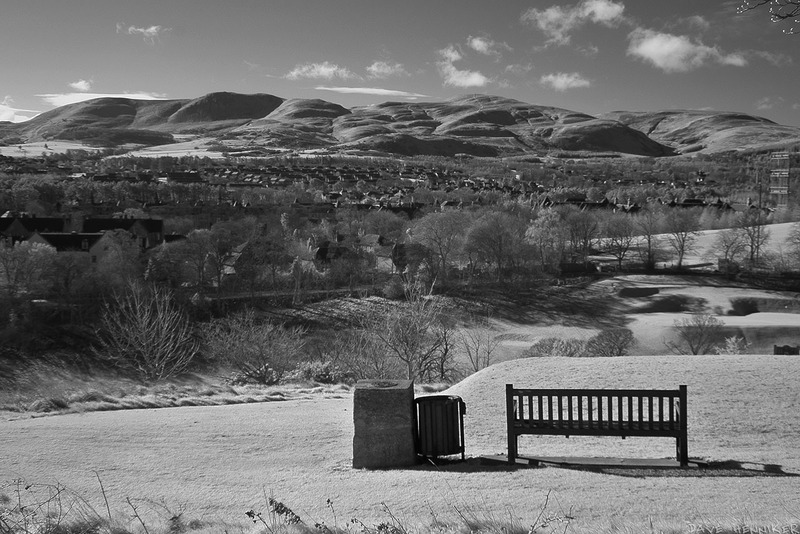 At the north end of the park facing south towards the Pentland Hills. The Braid Burn is on the left of the footpath. 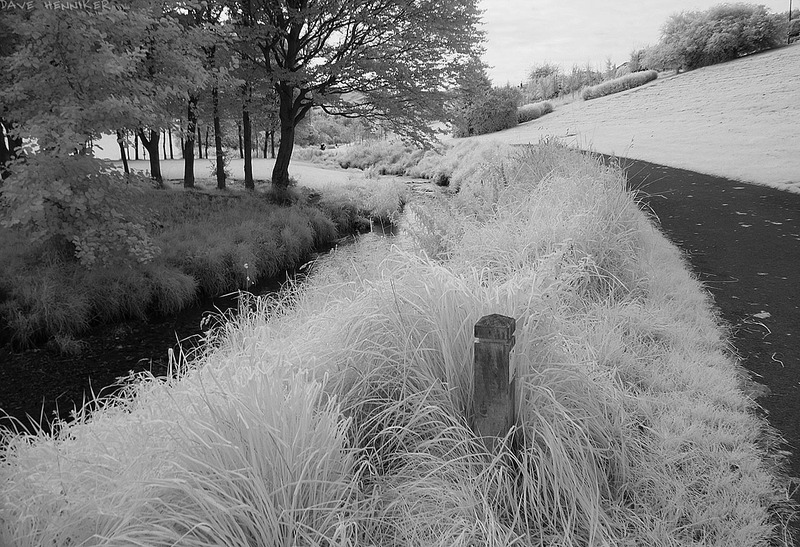 Four infrared views of Braidburn Valley Park taken in August 2012. 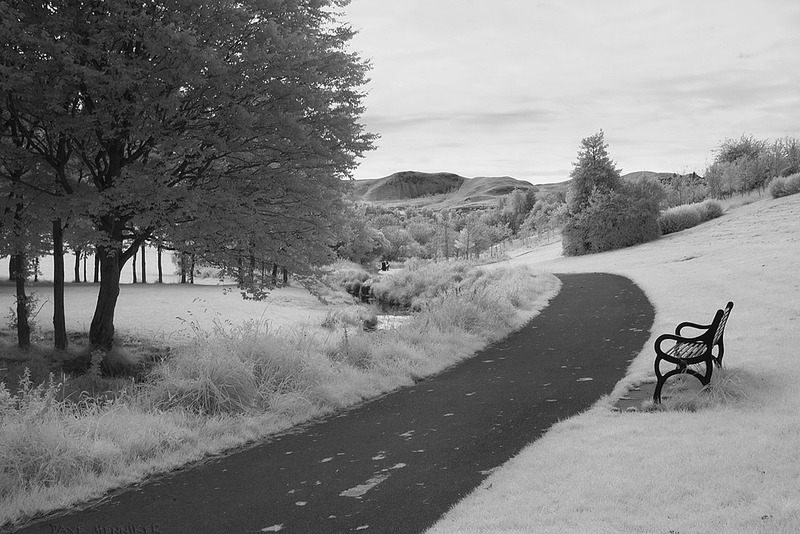 Beside the path a metal bench provides a seat with views to the Pentlands. 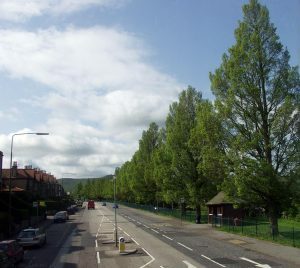 Comiston Road is the main A702 road running beside the park. 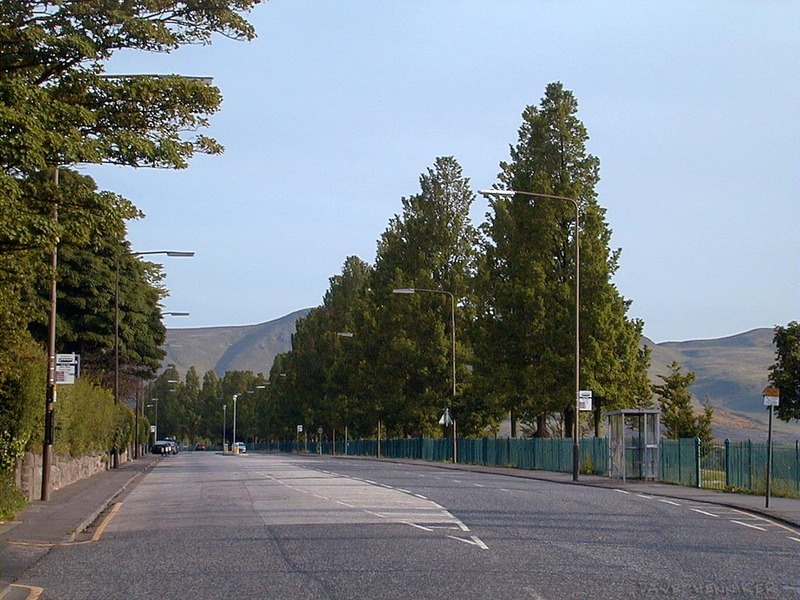 The Braid Hills Hotel sits between this road and Braid Road which runs parallel. 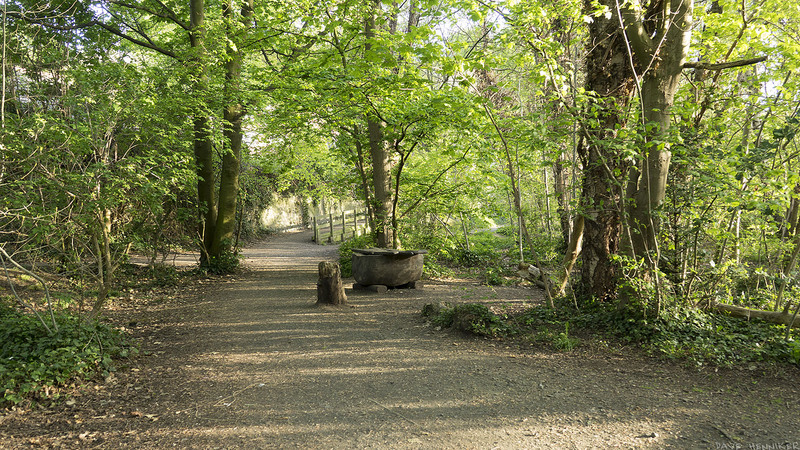 A footpath leads up from the park to Comiston Road near Riselaw Road. 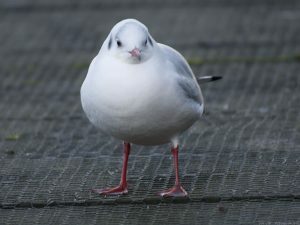 At Craiglockhart Pond we met swans, cygnets, ducks, coots, moorhens and this seagull. 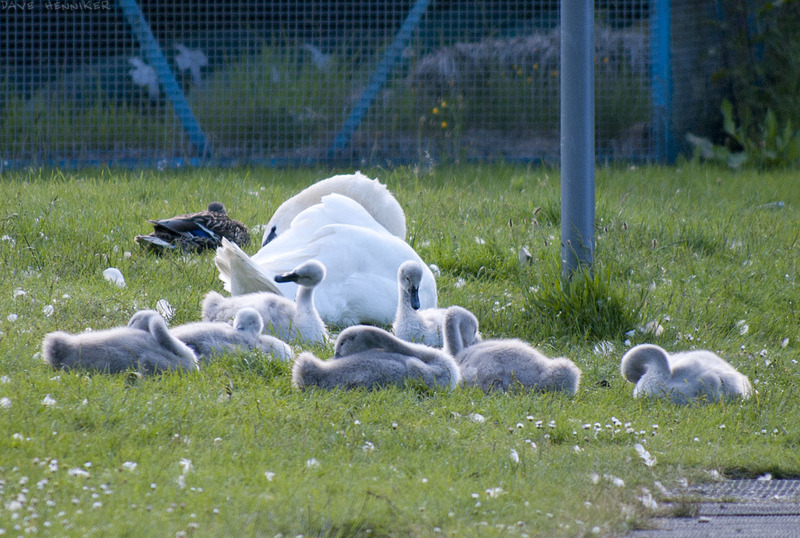 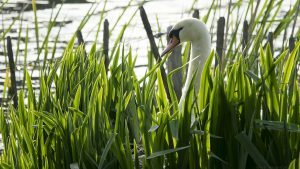 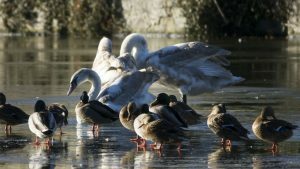 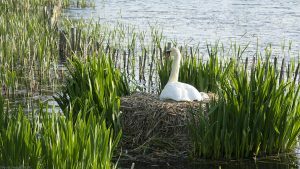 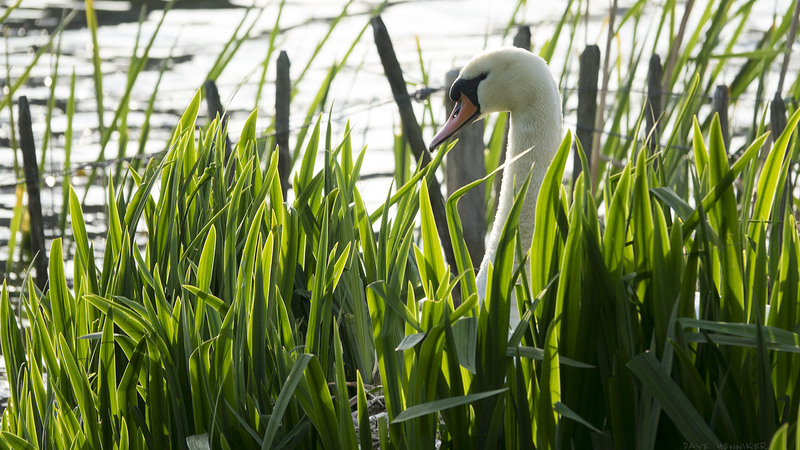 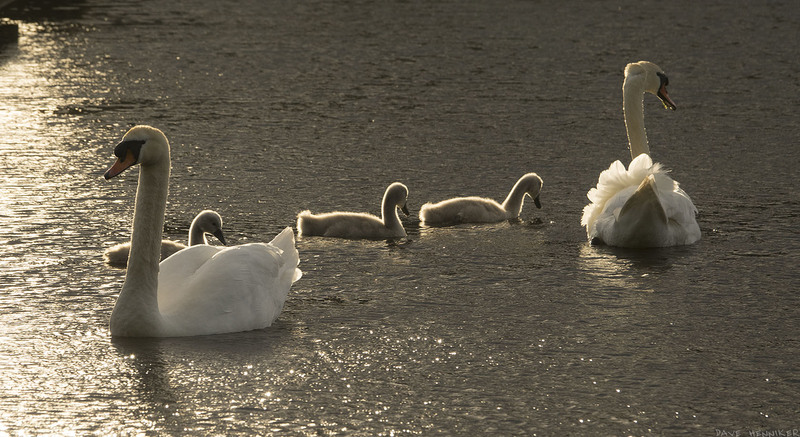 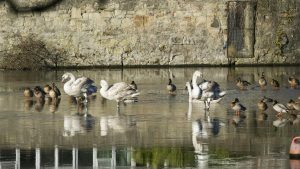 The swans and cygnets came to see us and the other birds followed. 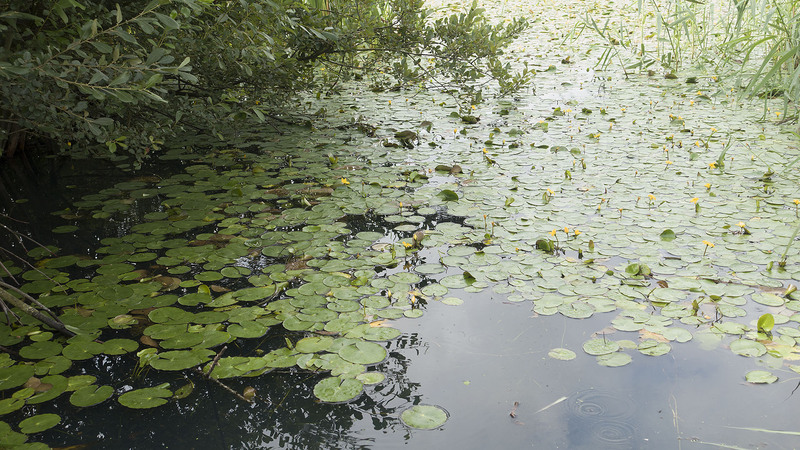 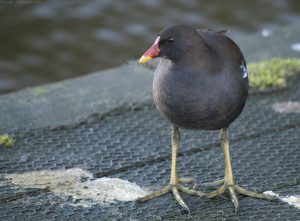 The moorhen's big feet let it walk across partially submerged vegetation without sinking. 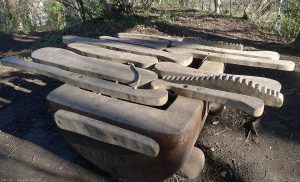 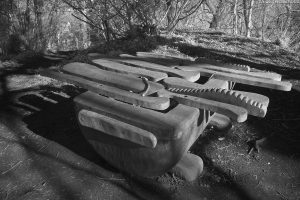 An interesting piece of woodwork art amongst the trees on the ridge overlooking Happy Valley. 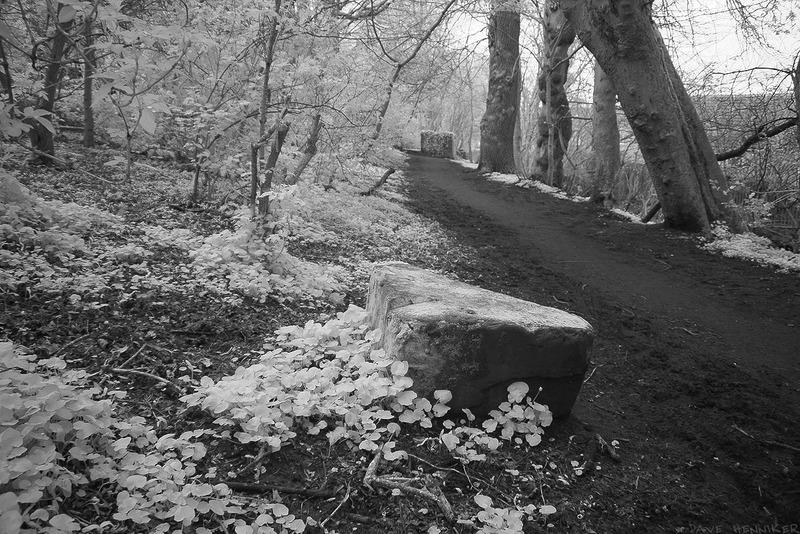 The same thing in conventional colour. There's at least one more in the trees near Lockharton Crescent. 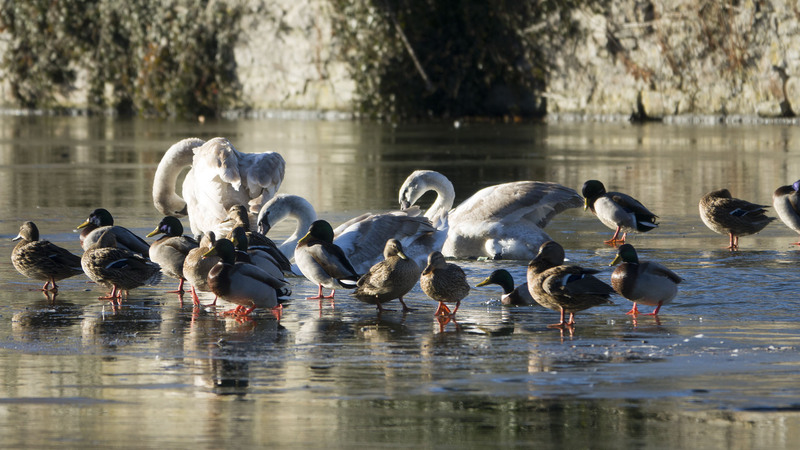 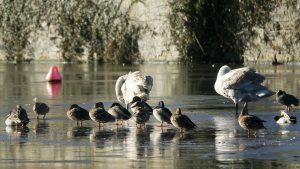 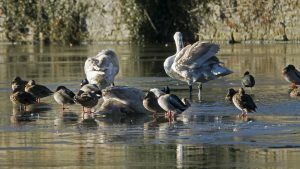 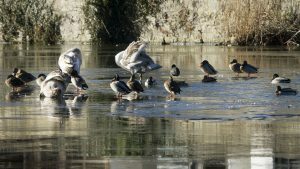 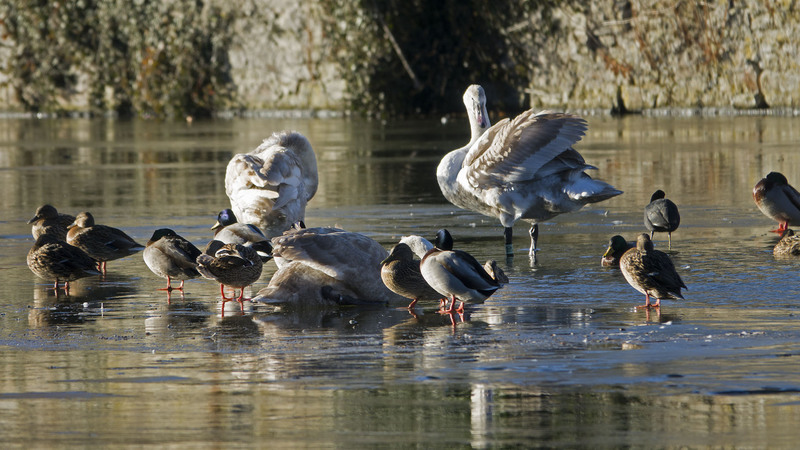 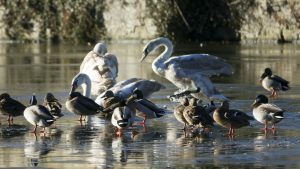 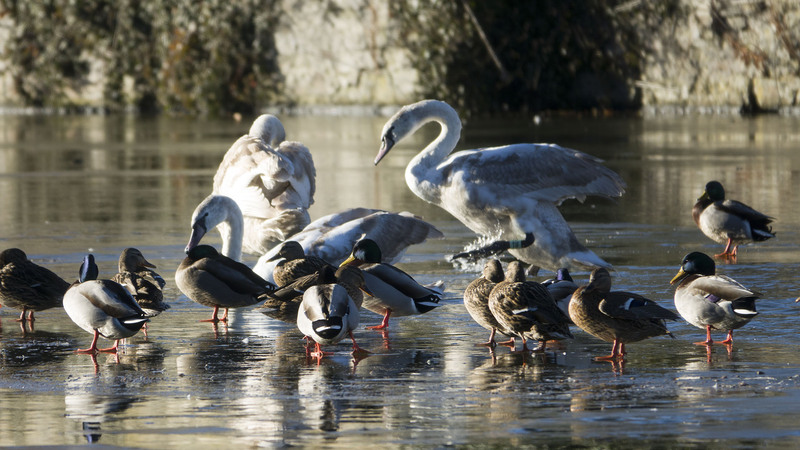 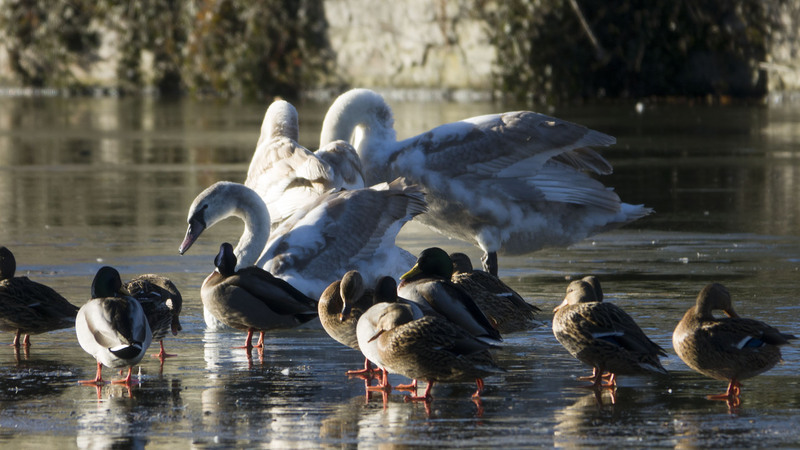 A small patch of water, probably kept clear by a pair of swans, but no doubt appreciated by the ducks too. 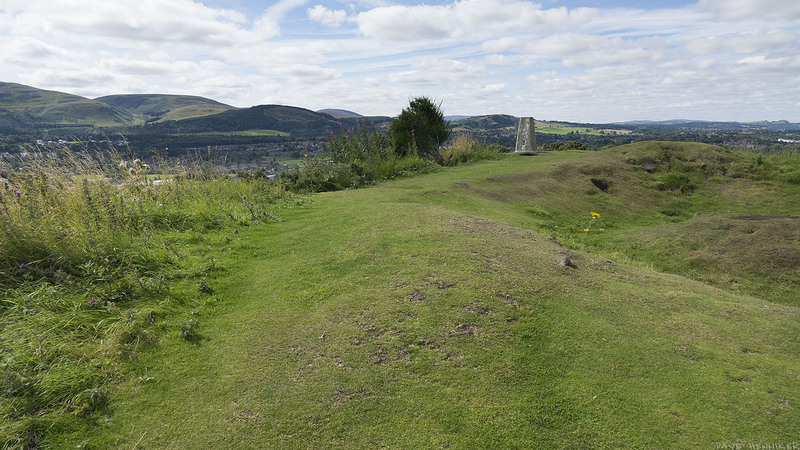 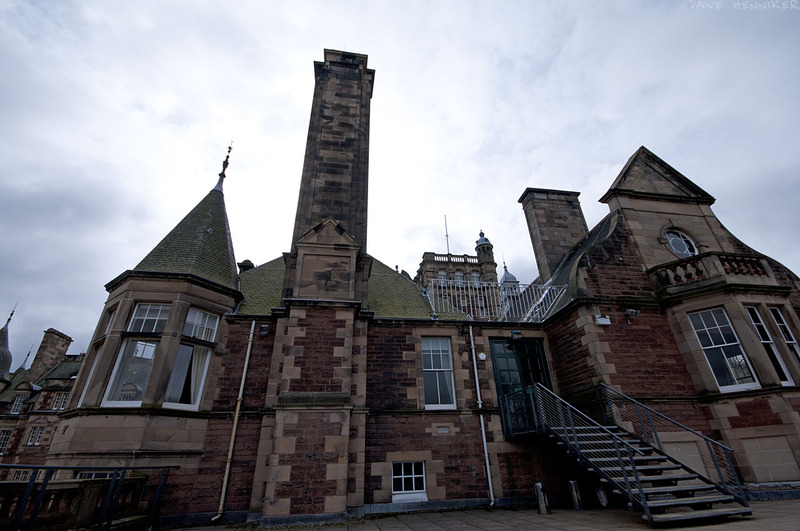 The entire prison can be seen from this vantage point near the top of Craighlockhart Hill. 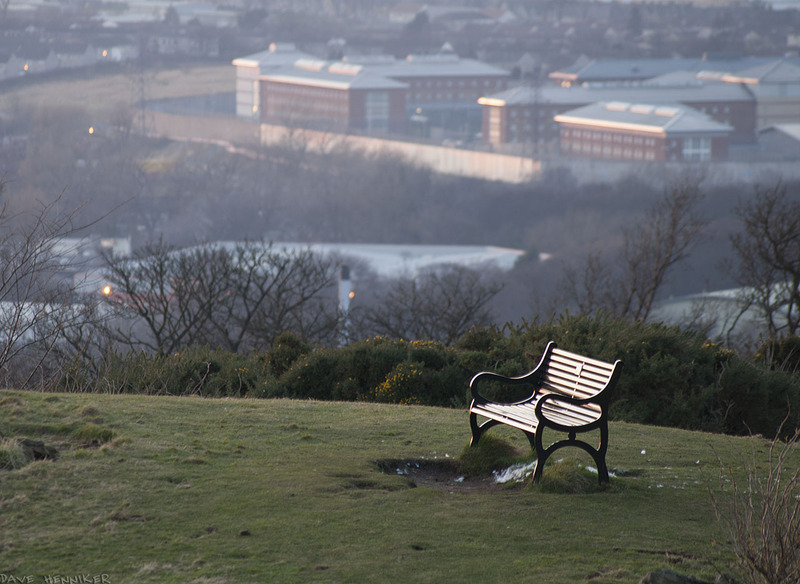 Glinting in the evening sunshine are this bench and the buildings and barriers of Edinburgh's jail. 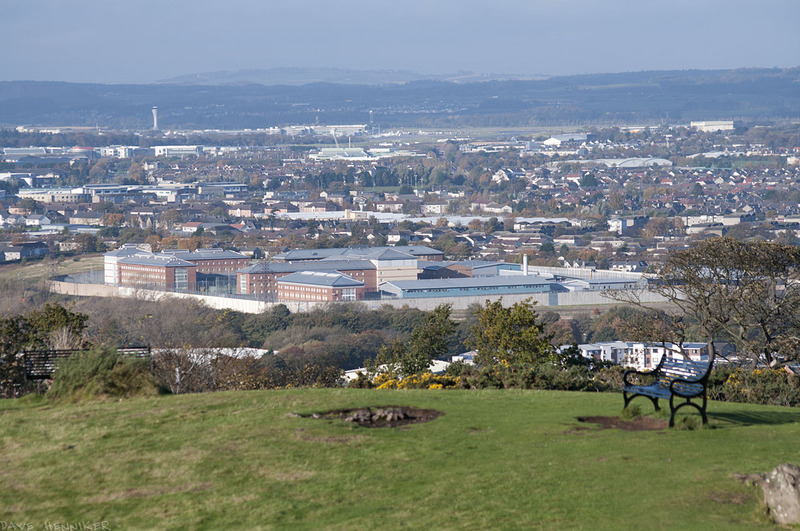 I was only ever in Saughton Prison once - to repair a TV in the prison hospital. 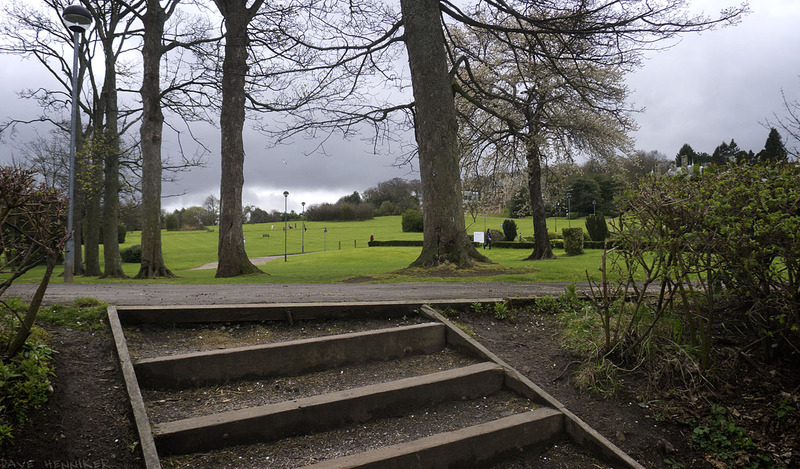 Access to this hill is difficult because of the golf course. 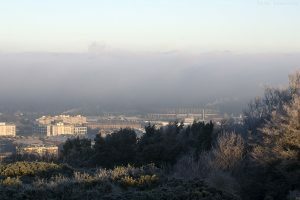 Beyond Wester Craiglockhart Hill is White Hill which overlooks the Bonaly area. 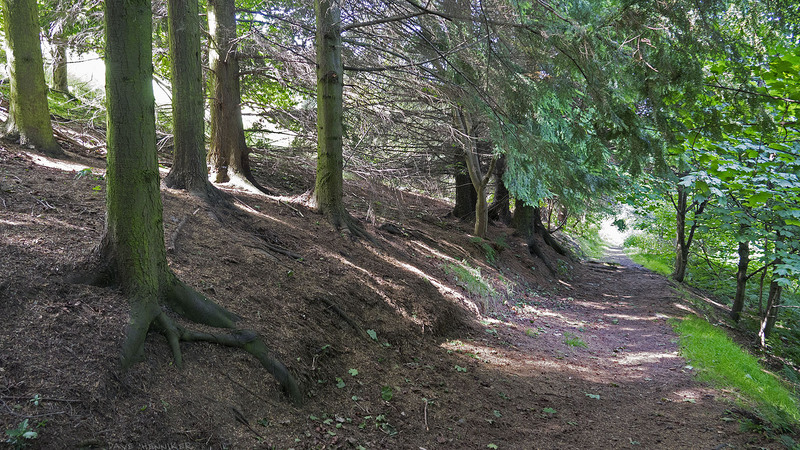 We have seen roe deer in the woods there. 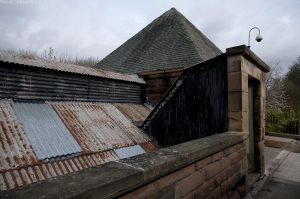 Matalan is blue roof at Slateford Road. 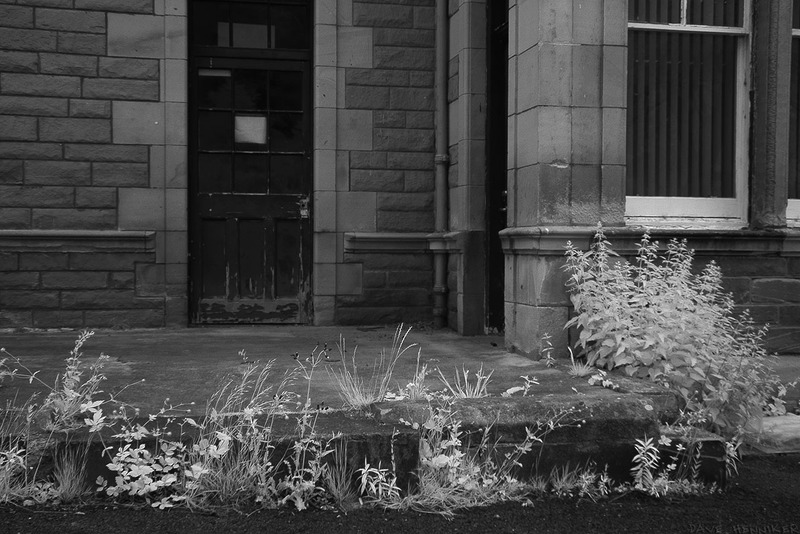 Jewson at adjacent blue-sided building. 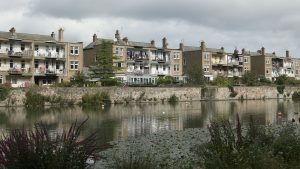 Slateford Green is the green building left of Centre. 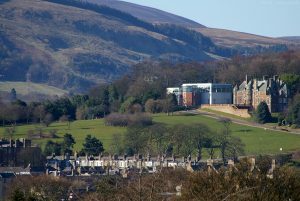 Sainsbury's is between Gorgie Road and Westfield Road. 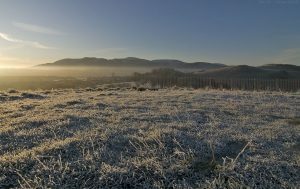 A similar view but expanded a little. 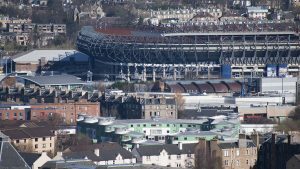 Murrayfield Ice Rink is left of the stadium. The building with the reddish curved roof behind Sainsbury's is North British Distillery Company Limited. The campus at Craighouse is no more, but you can still walk around the grounds. Garlic decorates the edges of the steps descending to the path between Glenlockhart Road and Happy Valley at the rear of the sports centre. 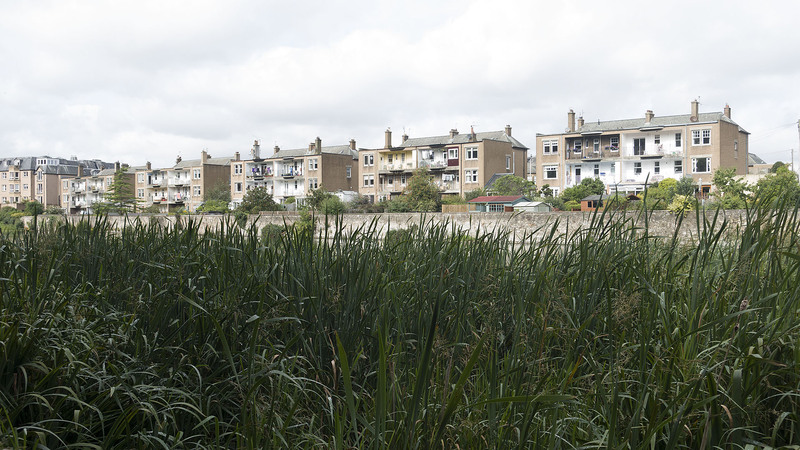 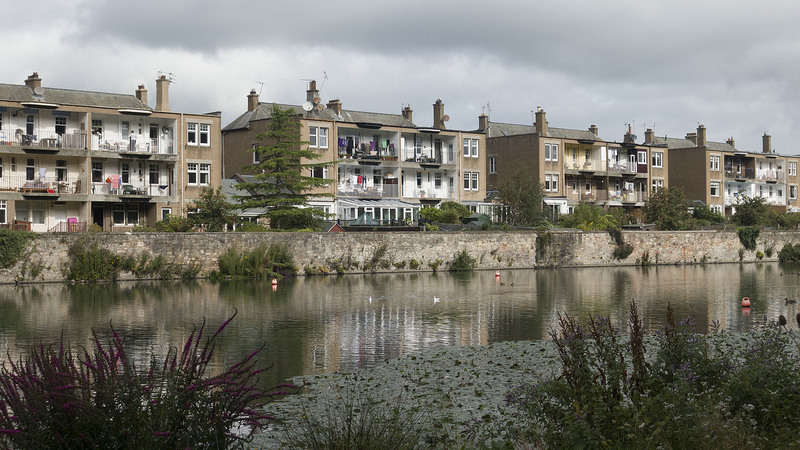 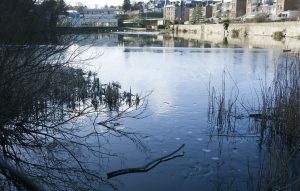 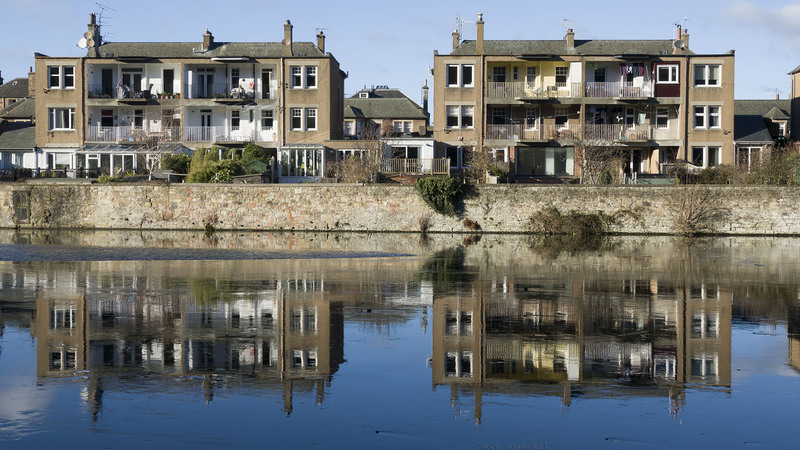 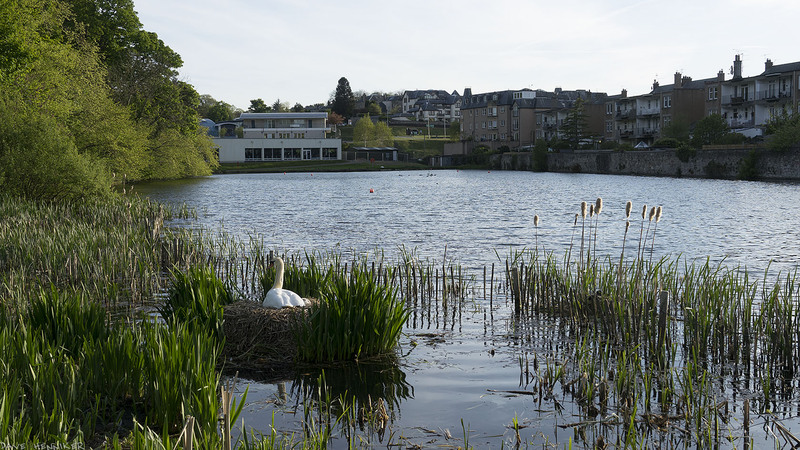 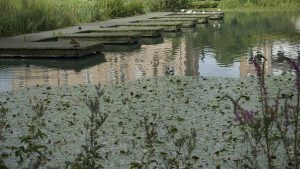 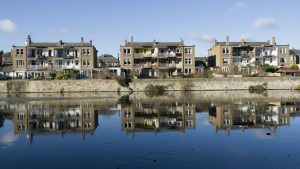 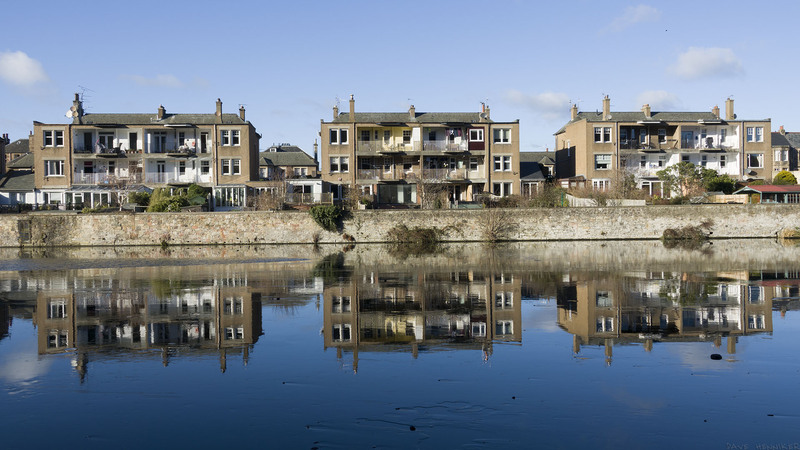 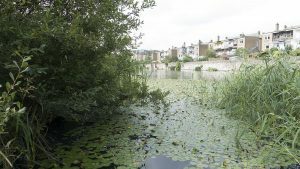 A view across Craiglockhart Pond. 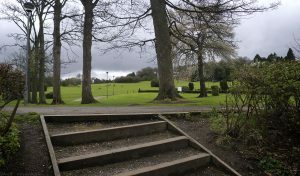 The view from a little nearer the number 23 bus terminus in the grounds. This is a view from the top deck of the bus. From higher up the slope, possibly in the centre of the planned development. 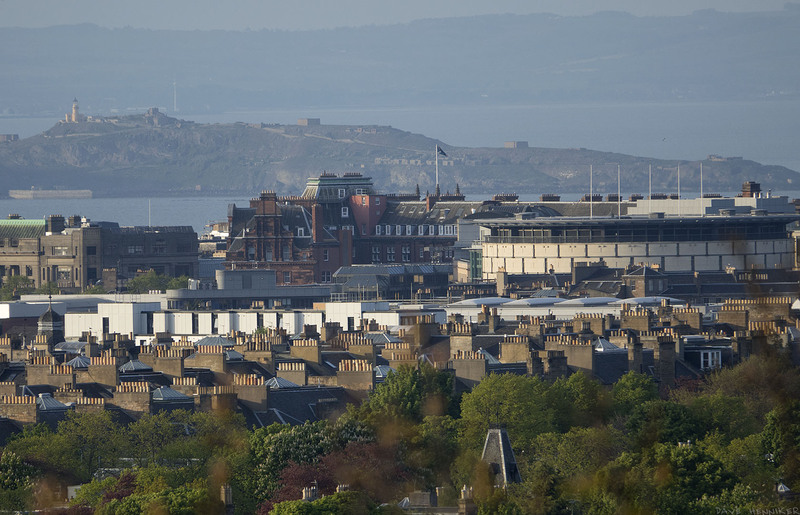 From here we can (for the time being) see St Mary's Cathedral and Edinburgh Castle. 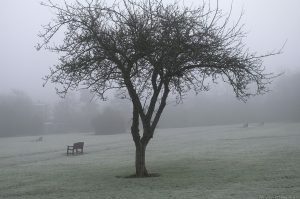 February 2010 and a misty morning. 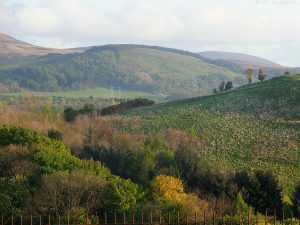 Looking up the hill towards South Craig. I'm horrified to imagine an endless succession of lorries, bulldozers and cranes digging this up. 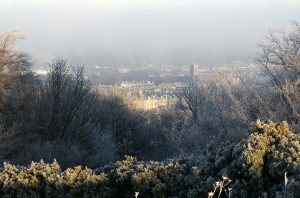 Another earlier picture, this time from December 2004. 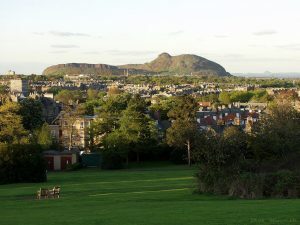 Another view that would be lost is Salisbury Crags and Arthur's Seat on the right of this picture. Assuming the bulldozers don't arrive too soon, I'll go back on a sunnier day. 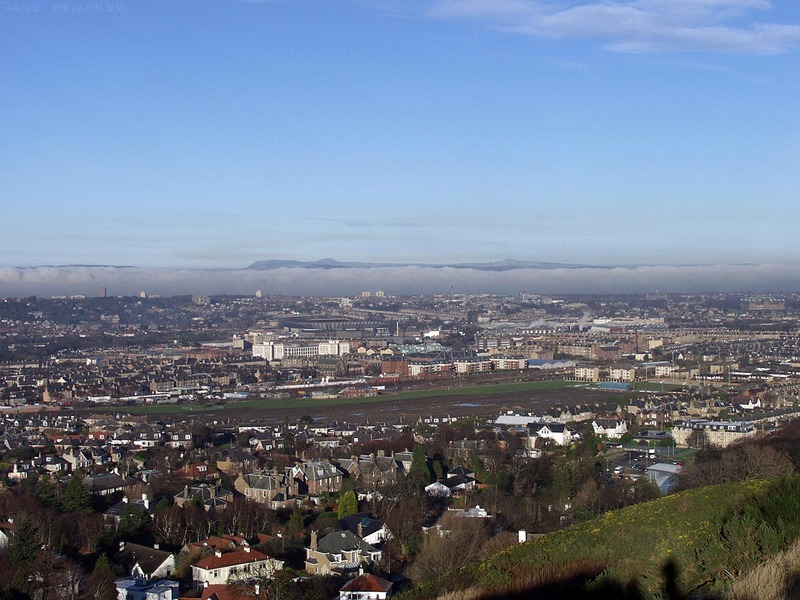 An earlier picture from 2002 showing the view to Arthur's Seat when it was more sunny. 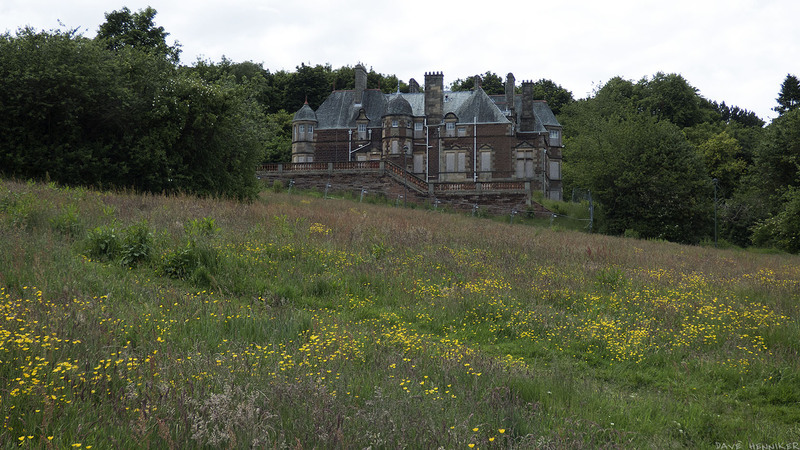 This vantage point would be lost in the midst of bulldozers and buildings. 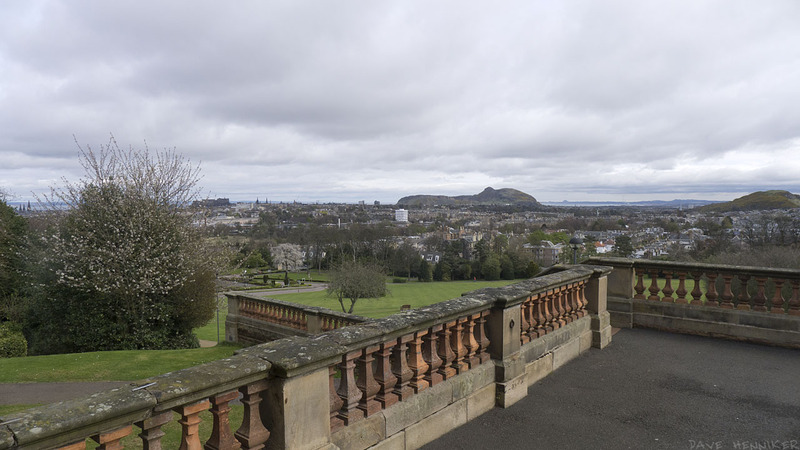 The green area visible through and beyond South Craig's veranda is where they want to build. 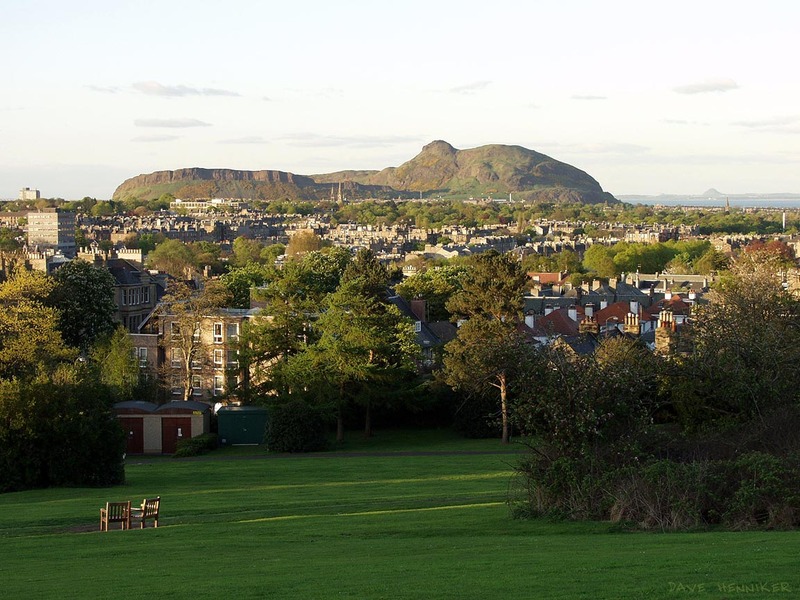 To the right of the castle and Arthur's seat: views to North Berwick Law and Blackford Hill. A similar view from the veranda at South Craig but zoomed in a little. The Bass Rock is visible to the left of the triangular shape of North Berwick Law. 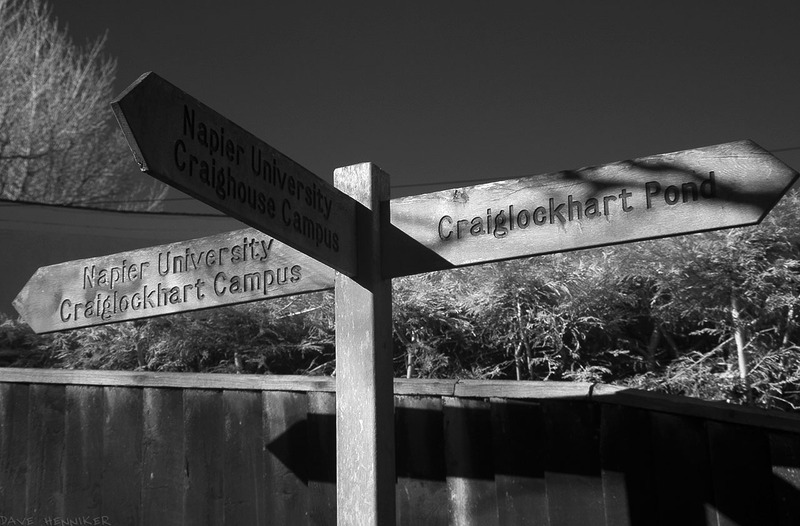 South Craig. 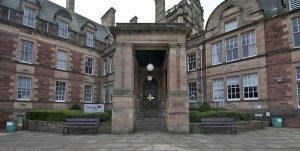 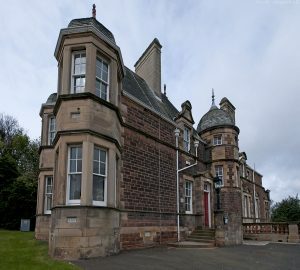 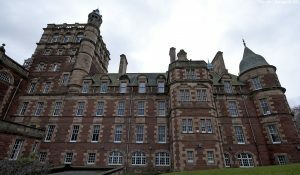 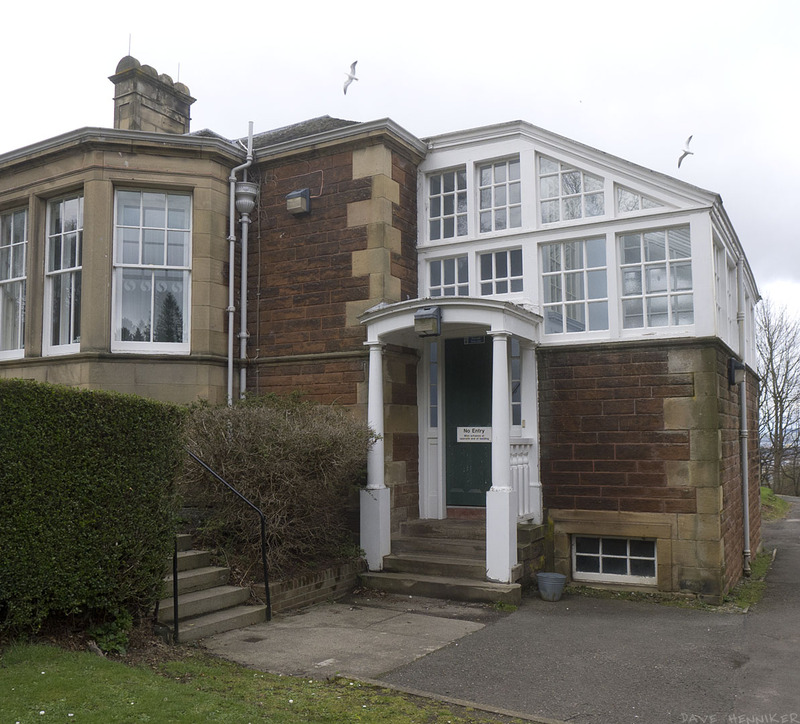 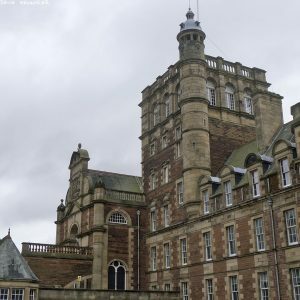 I used to visit this building and others in Craighouse in my capacity as a TV Service Engineer when it was one of the psychiatric wards. 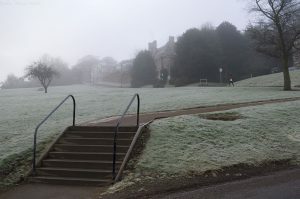 Steps leading up to South Craig. 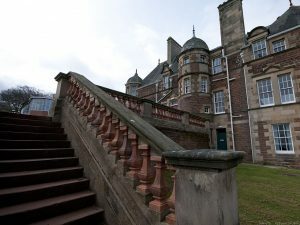 The main building as seen coming from South Craig. 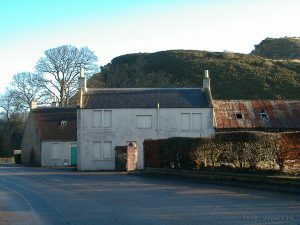 Google Maps refer to it as the Moffat Centre though that's likely to change. 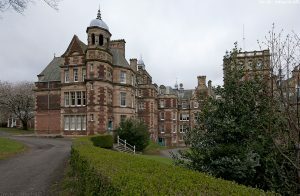 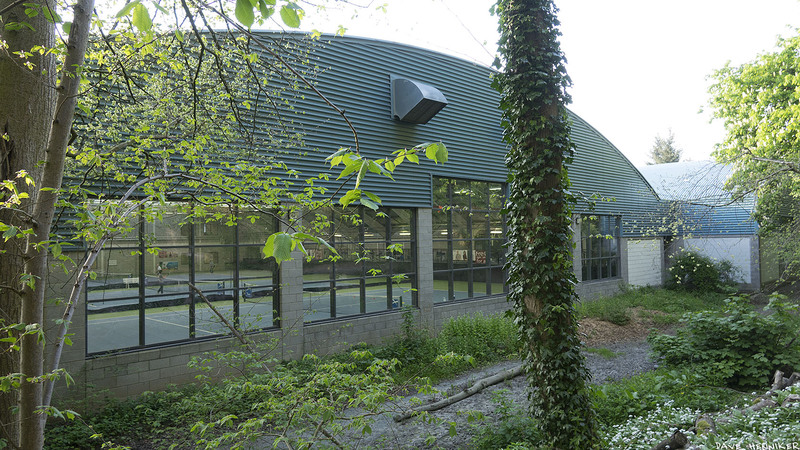 This is the south side of the main building. 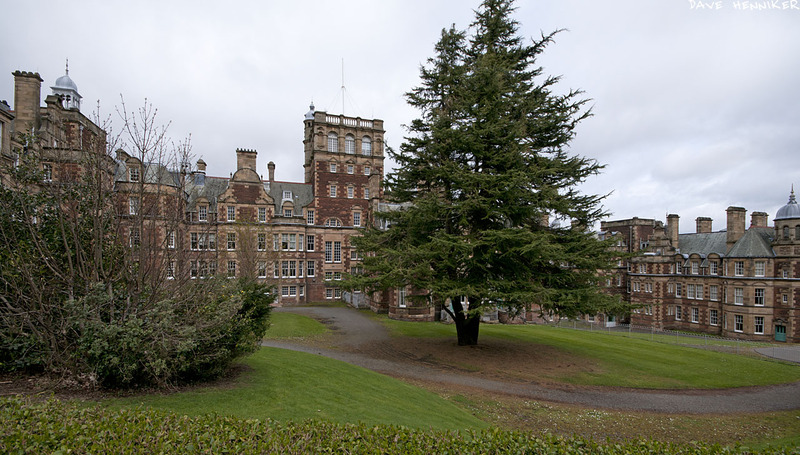 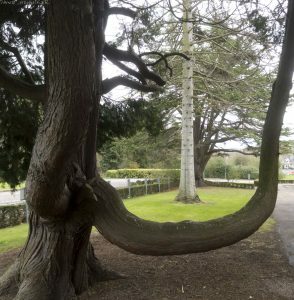 A fine old tree stands in the centre of the area. 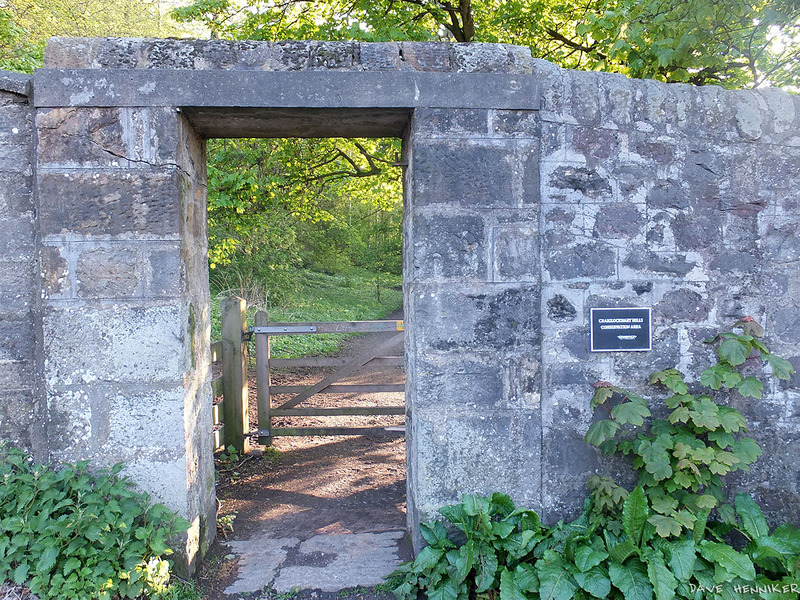 Photographed again in mid-August from steps concealed by the trees on the left of the previous photo. 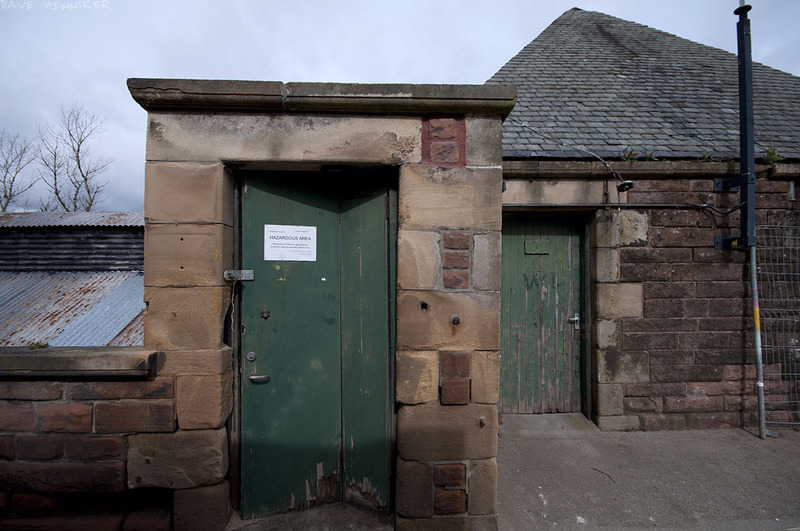 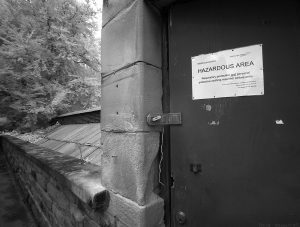 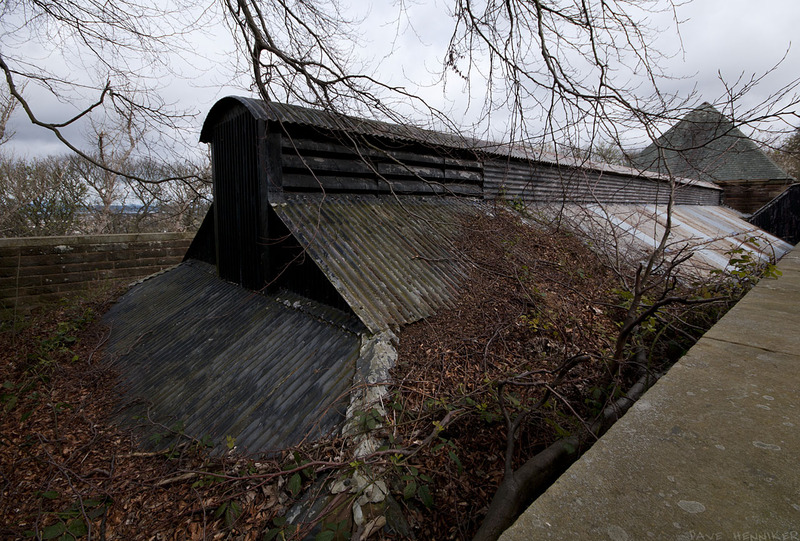 An unusual appendage to this building which may have been originally constructed for a janitor or groundsman. The north side as seen from the narrow winding roadway up the hill. 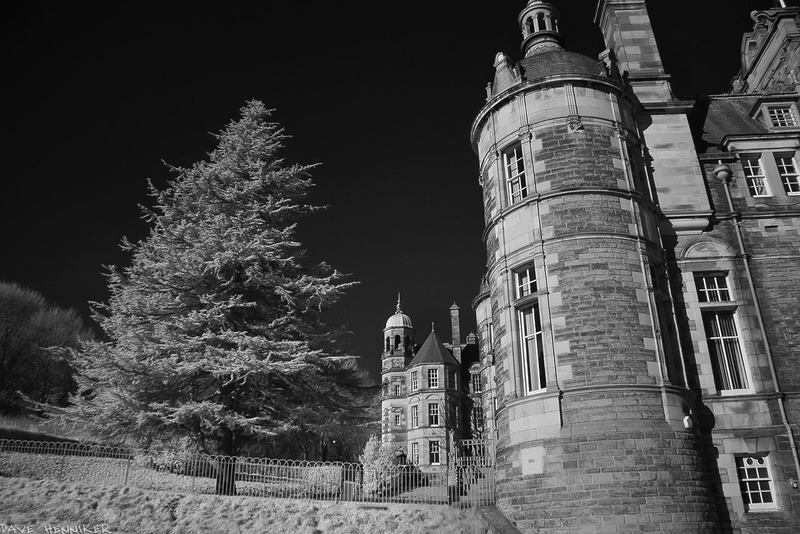 I panned the Lumix LX5 camera left and zoomed in a little for this square shot of the tower. 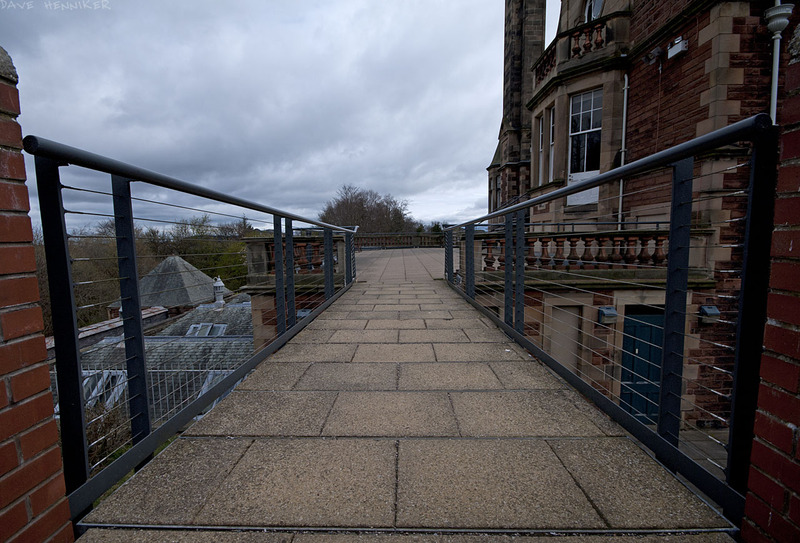 A wide angle view using the Pentax K7 DSLR. 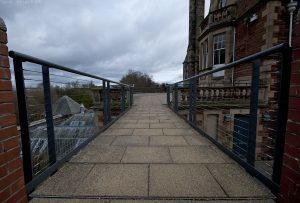 A more recent addition is this footbridge leading to an entrance one floor up. 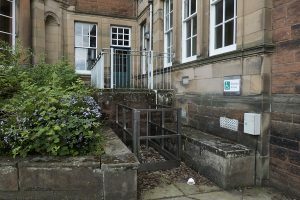 The metal steps lead up to the entrance. 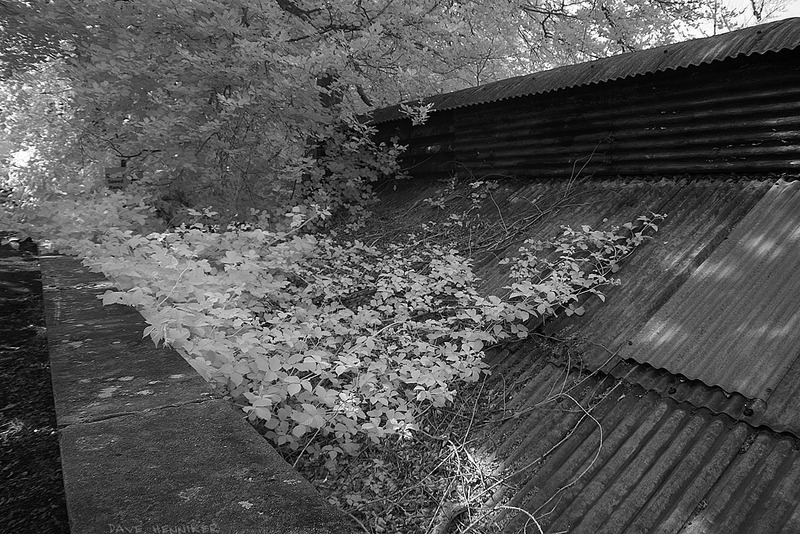 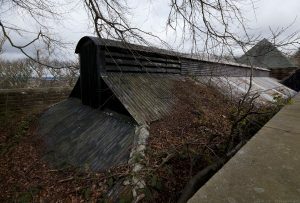 Down below beside the roadway this corrugated iron roof is being slowly compromised by the forces of nature. New growth may erupt from the fallen leaf litter and twigs. A later visit with an infrared equipped camera shows a thorny twig hanging over the wall. 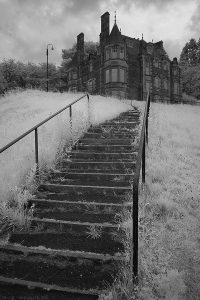 Formerly workshops of some kind that were built at the top of a steep slope; their construction needed an entrance with steps leading down. 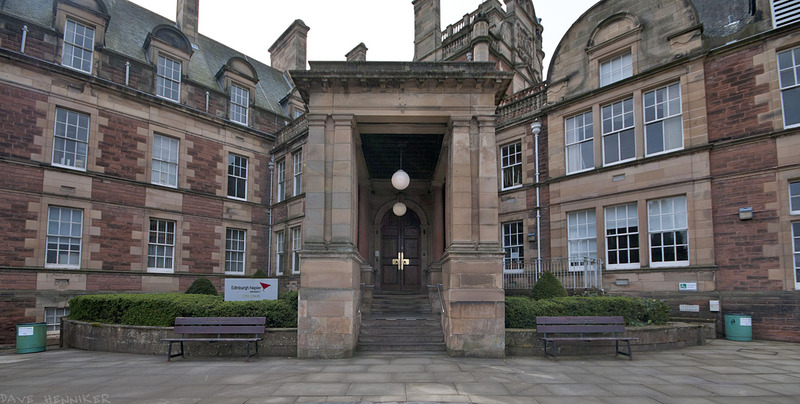 The main entrance to Napier University (as was). 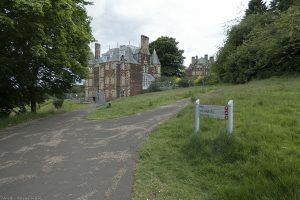 The path leads round the south west corner. 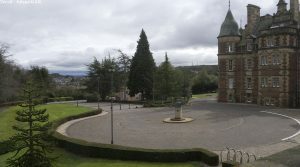 The circular driveway in front of the main entrance. 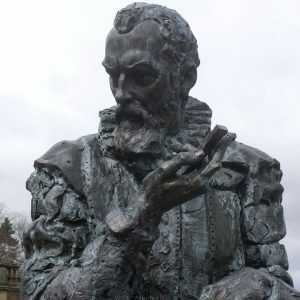 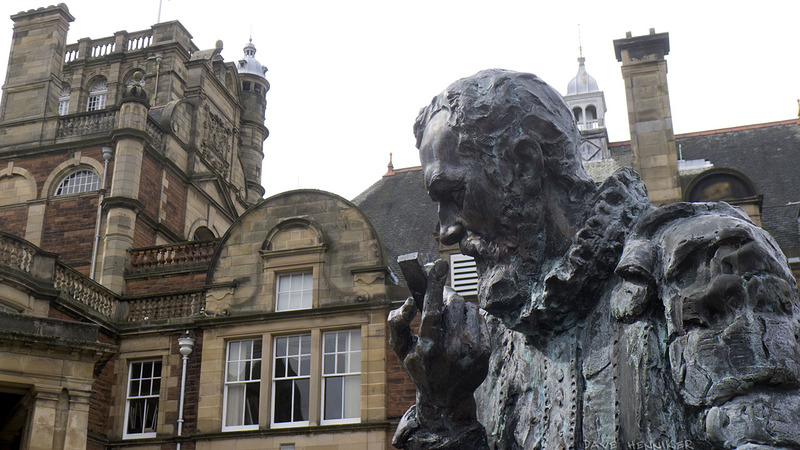 At the centre of the circle was this statue of John Napier of Merchiston. 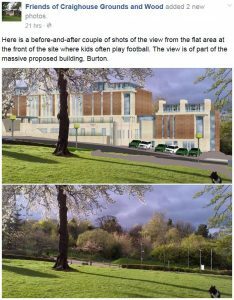 His remaining here would be rather pointless, given that this will be a 'condo'. 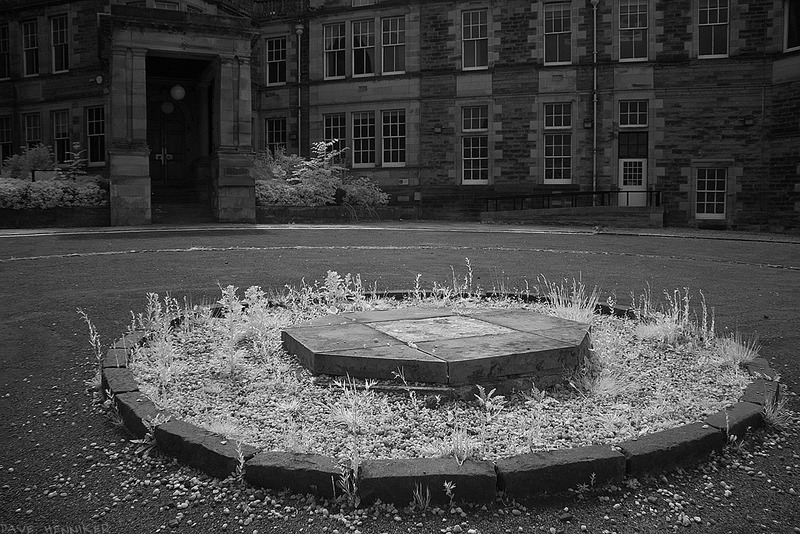 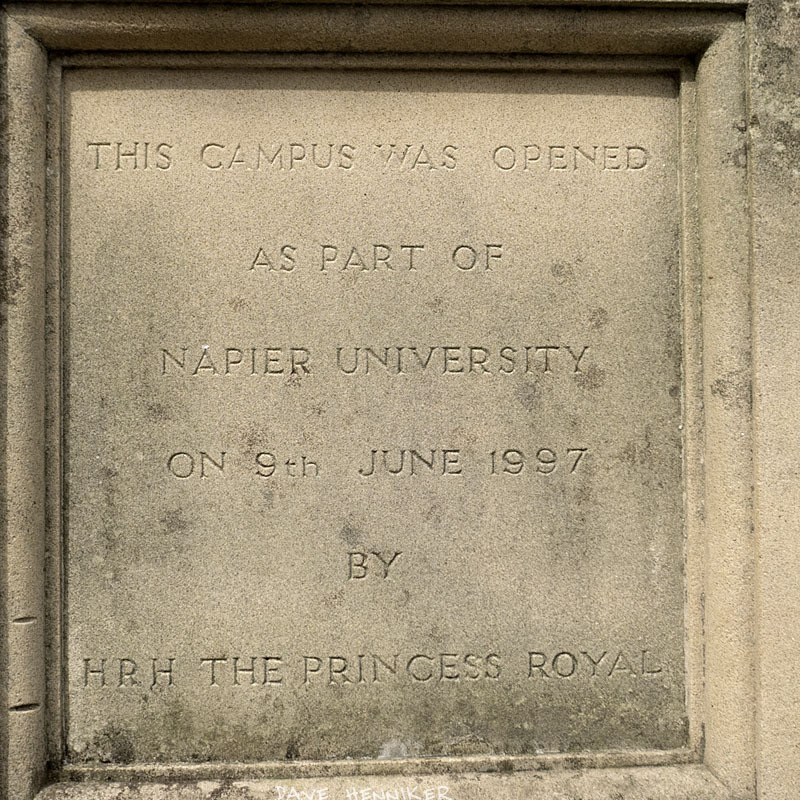 The text on the stone block under Napier's likeness states THIS CAMPUS WAS OPENED AS PART OF NAPIER UNIVERSITY ON 9th JUNE 1997 BY H.R.H. 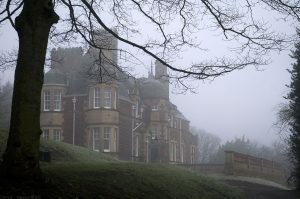 THE PRINCESS ROYAL. 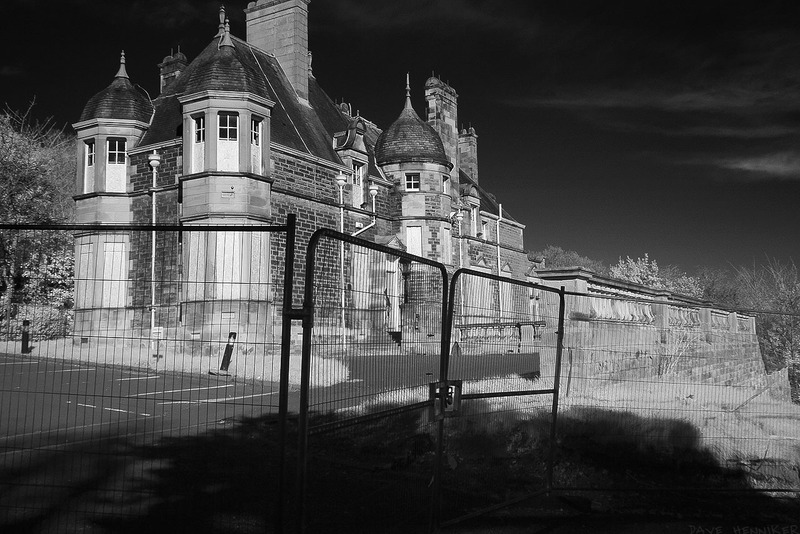 An older and less grand building comes into view as the clockwise stroll comes to end near the bus terminus. 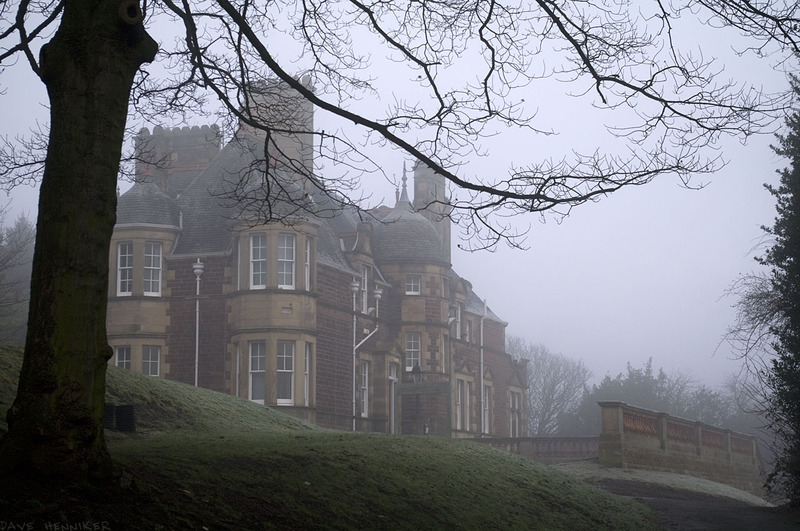 The bridge over Myreside Road frames the Watsonian Club's building and further back, nestling amongst the trees on Craiglockhart Hill, the buildings of Craighouse. 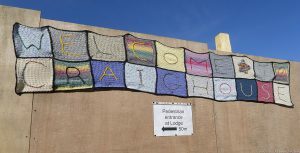 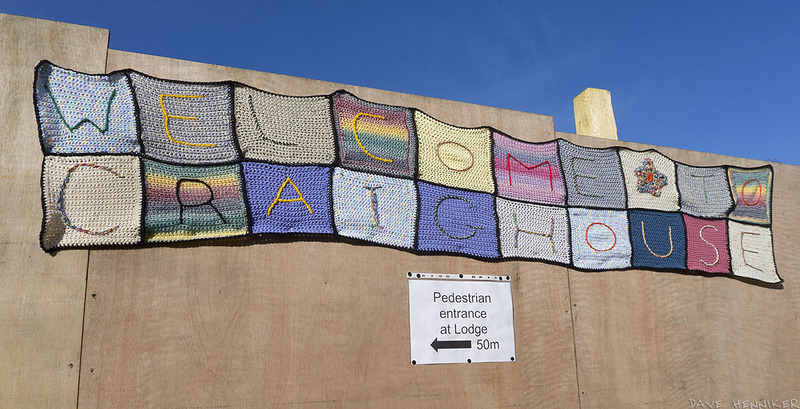 A friendly welcome to Craighouse created and put up in protest against the hostile warnings which preceded it, in the shape of official (and officious) notices. 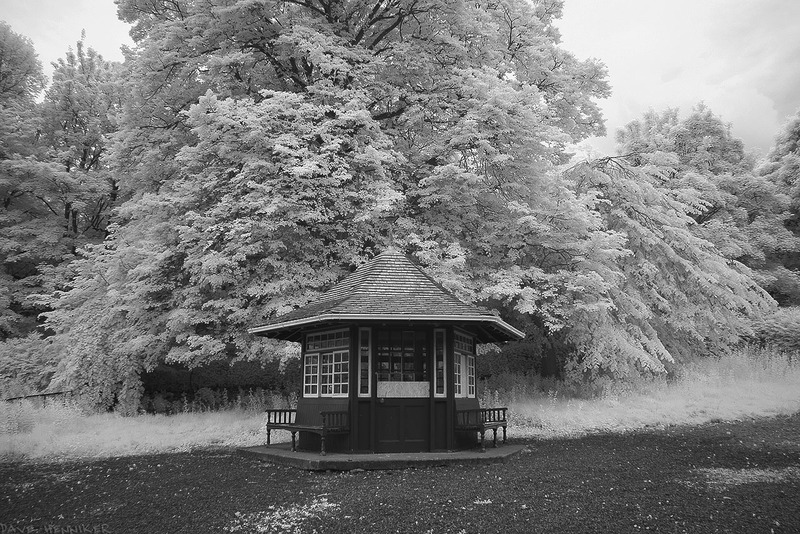 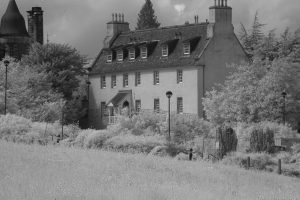 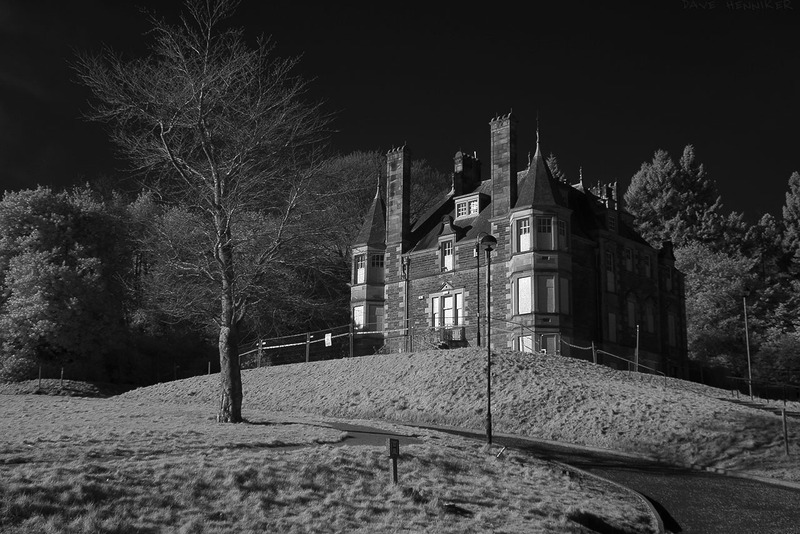 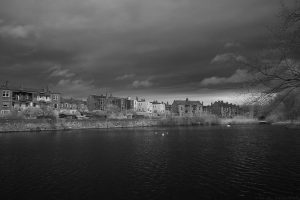 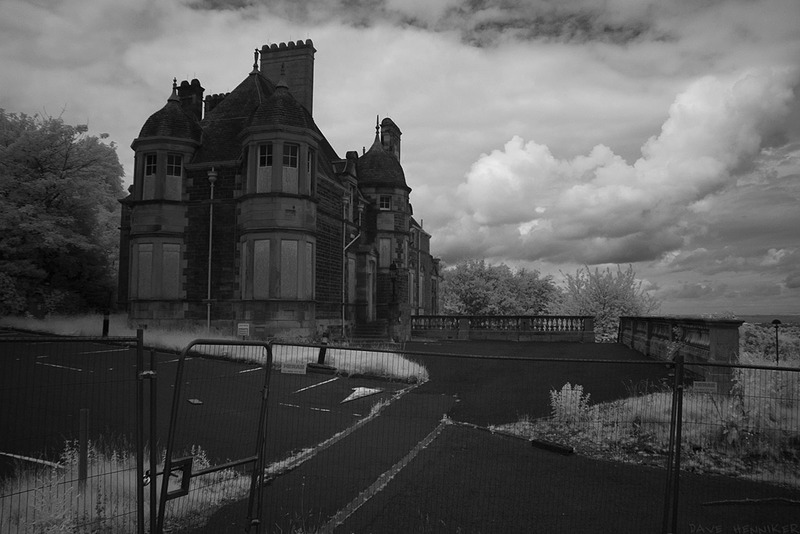 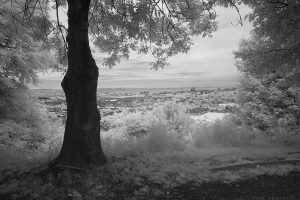 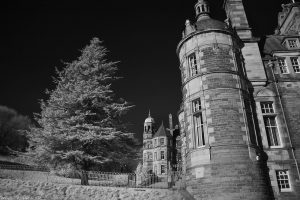 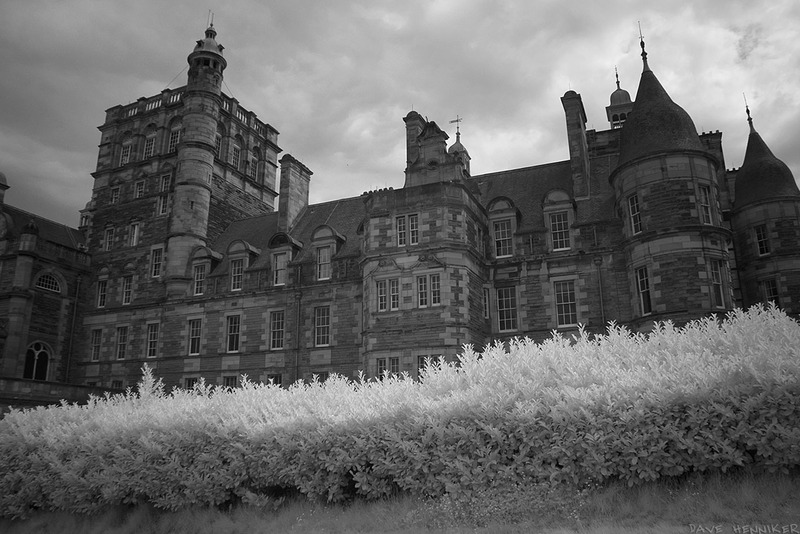 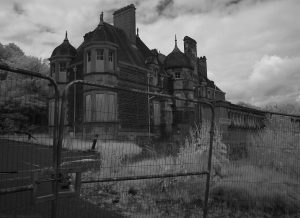 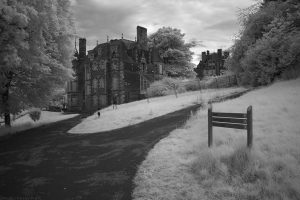 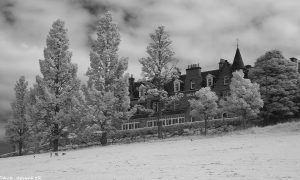 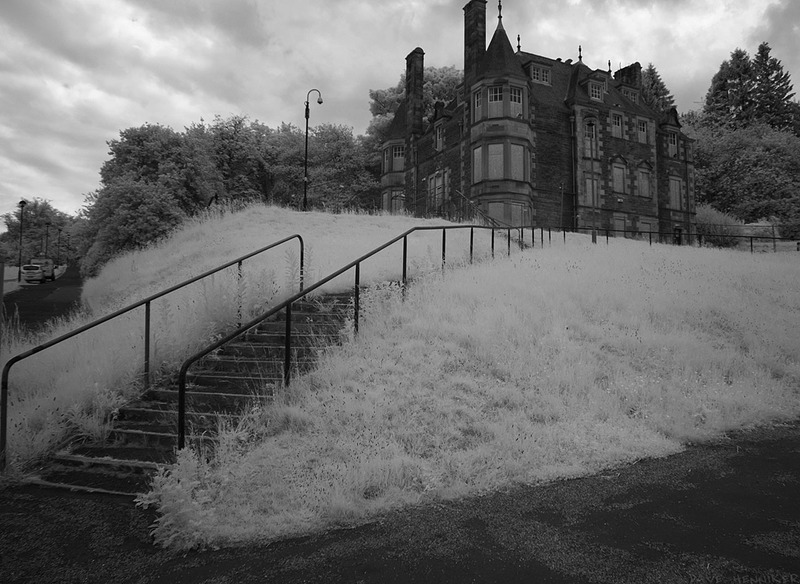 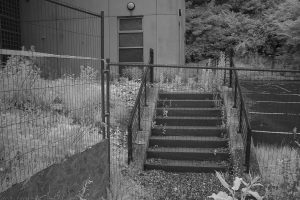 An infrared photo near the entrance to Craighouse. 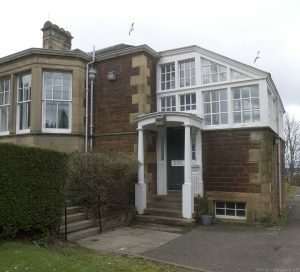 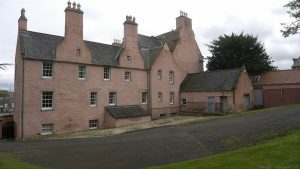 Bevan House is the lower of 2 similar buildings separate from the main building New Craig. 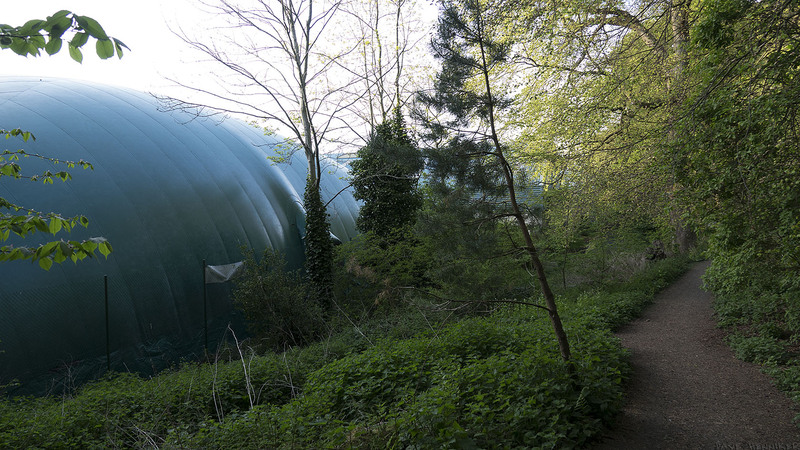 In common with the other buildings it has a high security fence round it and its windows are boarded up. 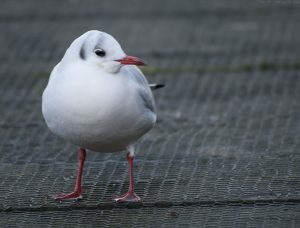 A friendly security guard wished us 'good morning' as we strolled about. The same view of New Craig but zoomed in a little more. 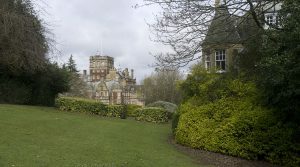 Another view of the building from the other side of the fence. 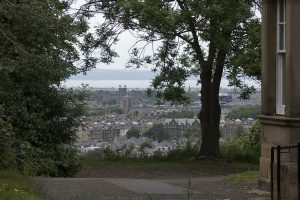 A last look at South Craig before walking through the trees to the path leading up to the top of Craiglockhart Hill. On the way up to the summit of the hill the path skirts the boundary of a golf course. 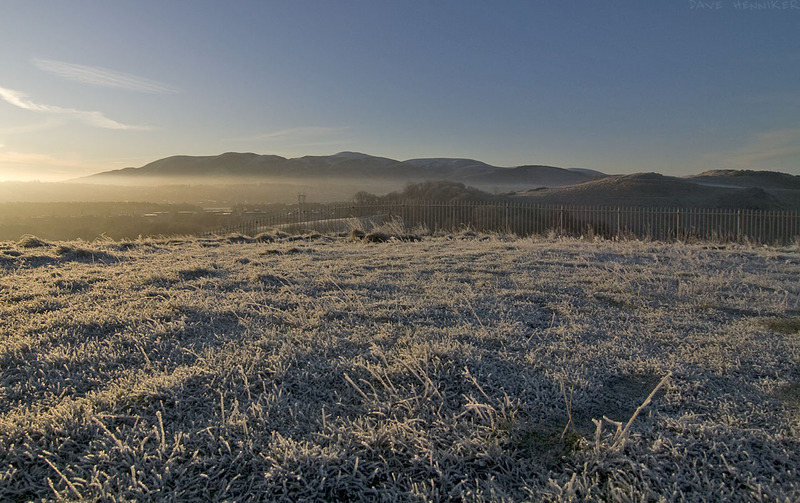 This view looks south over Glenlockhart Road towards the Pentland Hills. 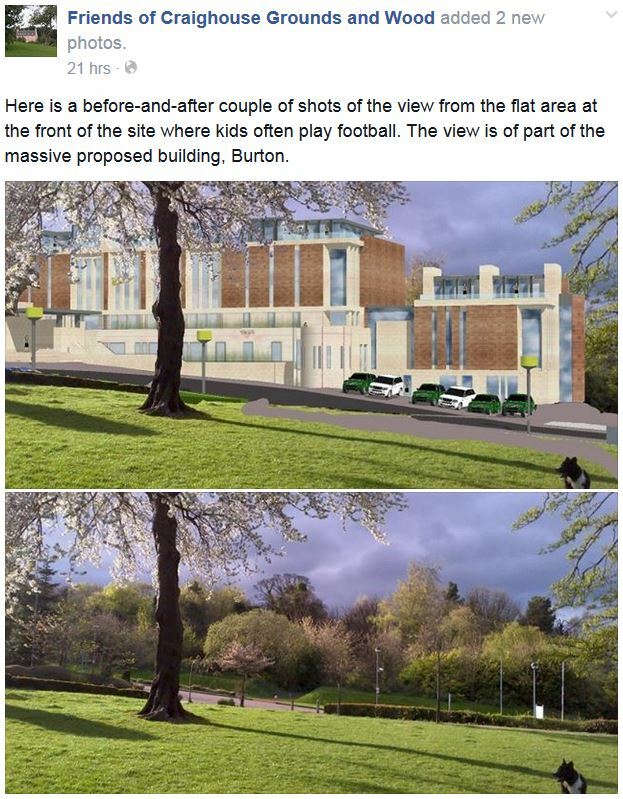 Copied from the Facebook Page: Friends of Craighouse Grounds and Wood to show the ugliness proposed in June 2014. The end of June 2015 and a 23 bus brought me to Craighouse once again. 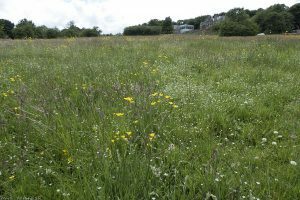 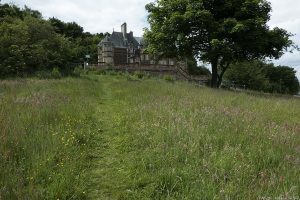 My first impression was that the large, sloping lawn had become a flower meadow. I continued up a path parallel to Craighouse Road and up the left side of the former lawn. 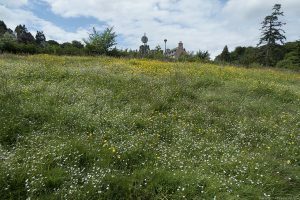 Wild flowers and long grass. 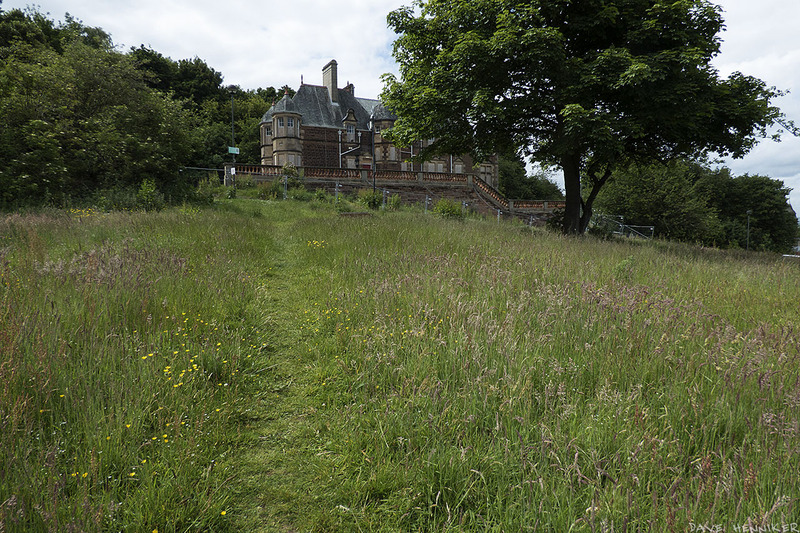 Looking up towards South Craig across the diagonal of the pleasantly unkempt lawn. 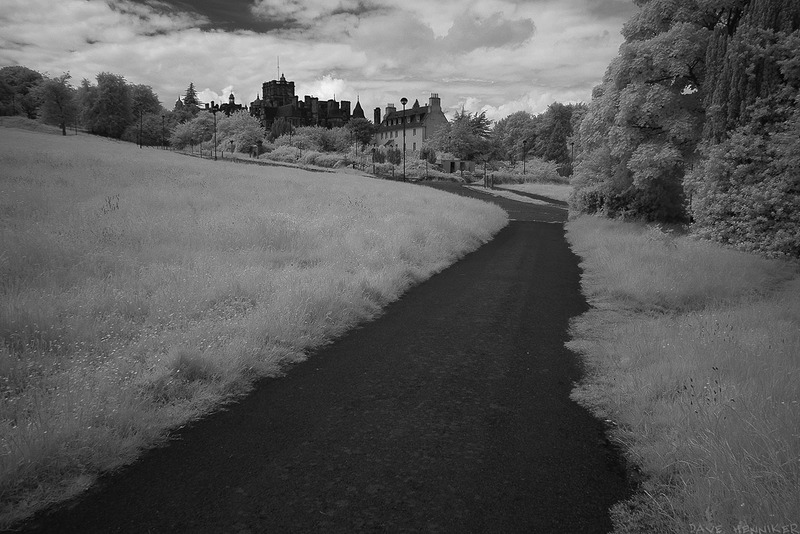 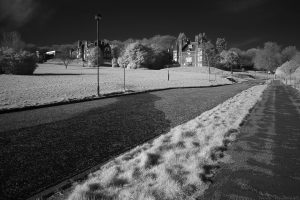 An infrared view along the tarmac path at the foot of the lawn. 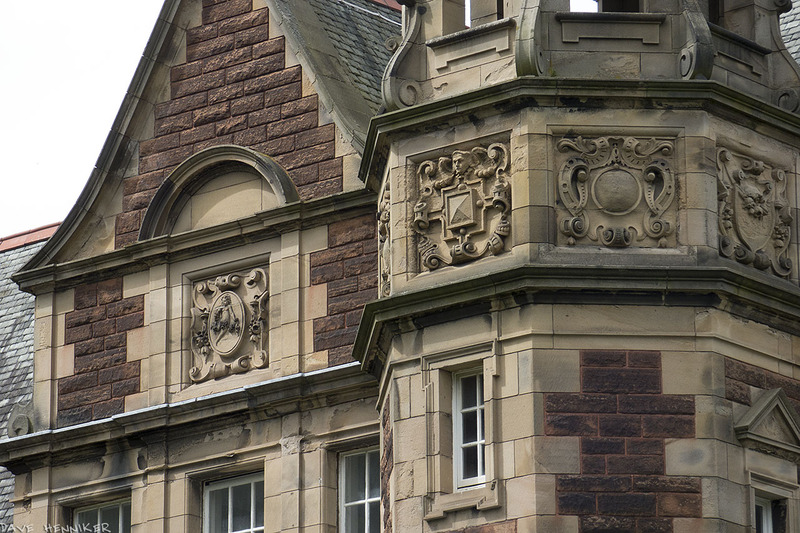 Zoomed in on a building whose name I forget. Security fencing and boarded-up windows. 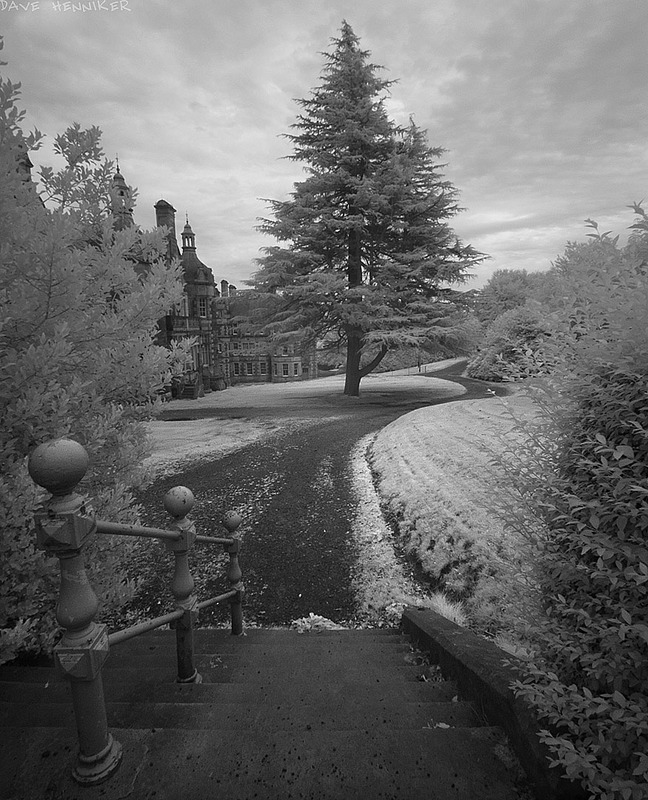 An infrared view of the assorted trees lining the bottom of the lawn. 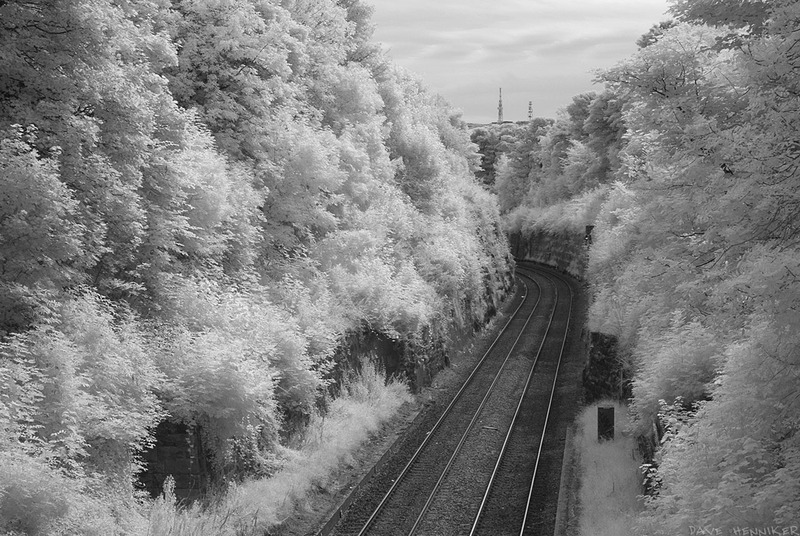 Zoomed in on the left half of the line of trees. 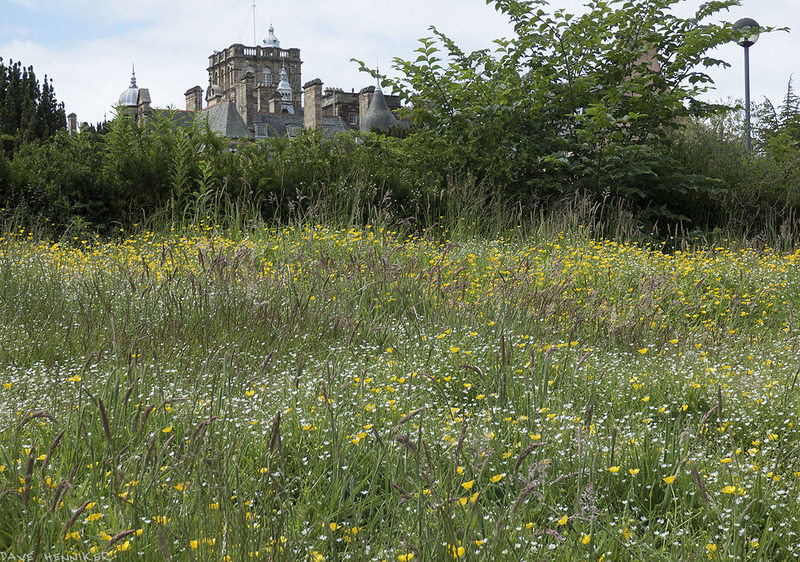 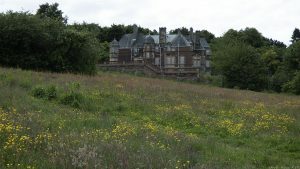 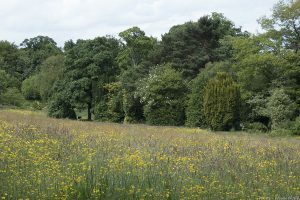 A wider view across the the wild flowers to one of the isolated buildings. 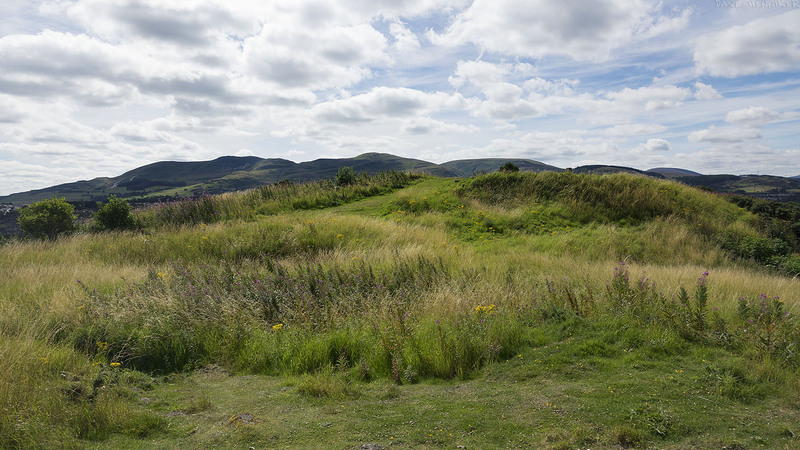 Higher up the field there was a recently worn path to South Craig at the top of the hill. 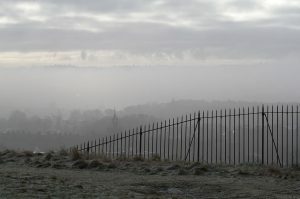 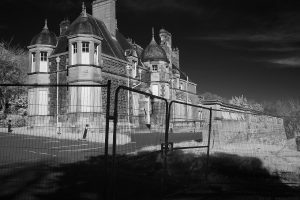 Like a scene from a Hitchcock film - or it would be without the security fencing. A more modern building is just beyond South Craig. 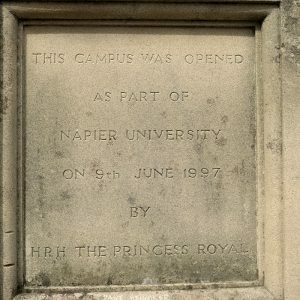 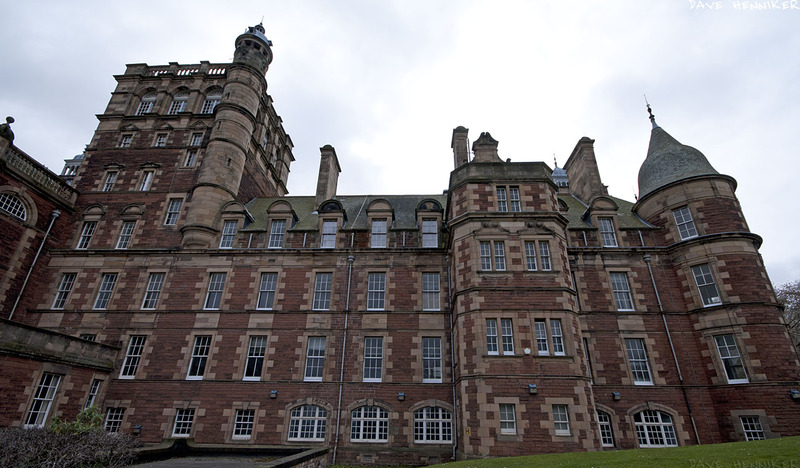 It probably owes its existence to Napier University's occupation. 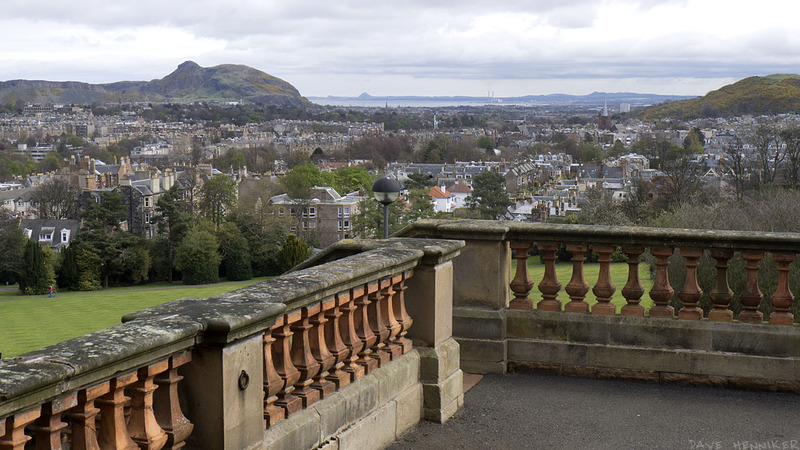 Another, wider view of South Craig and its veranda which gave stunning views. 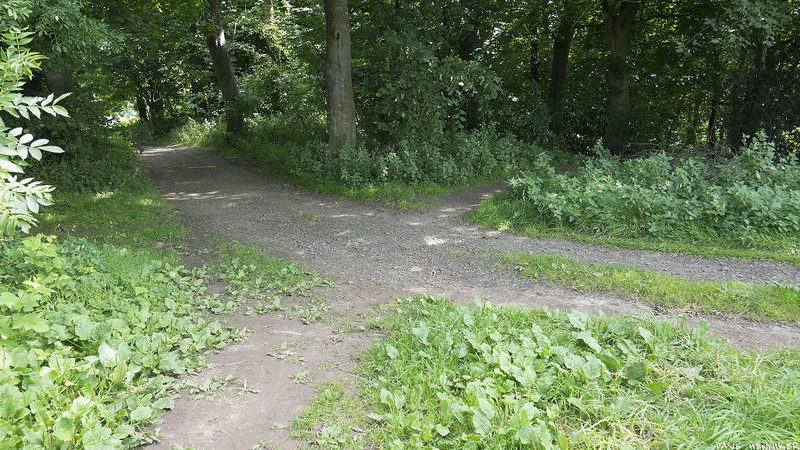 Further down the driveway, a stairway at a corner and a road off to the right. 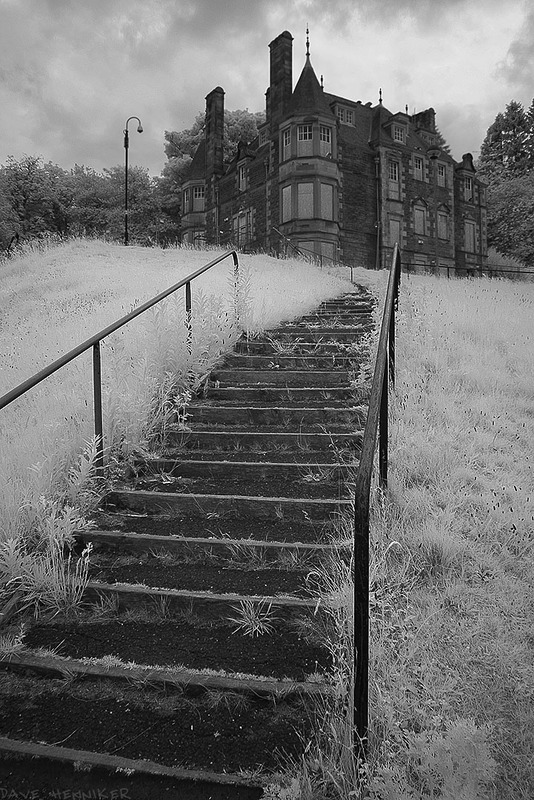 Those who have trod these steps must have a few tales to tell. 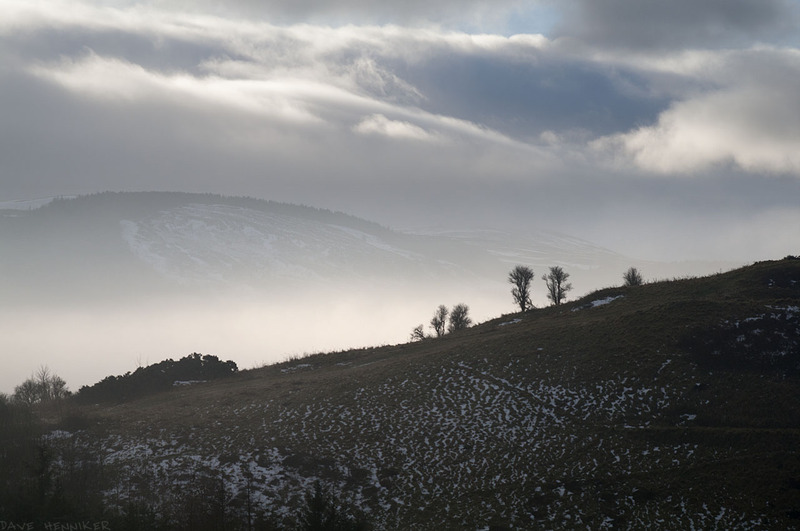 Moving west now and looking back. 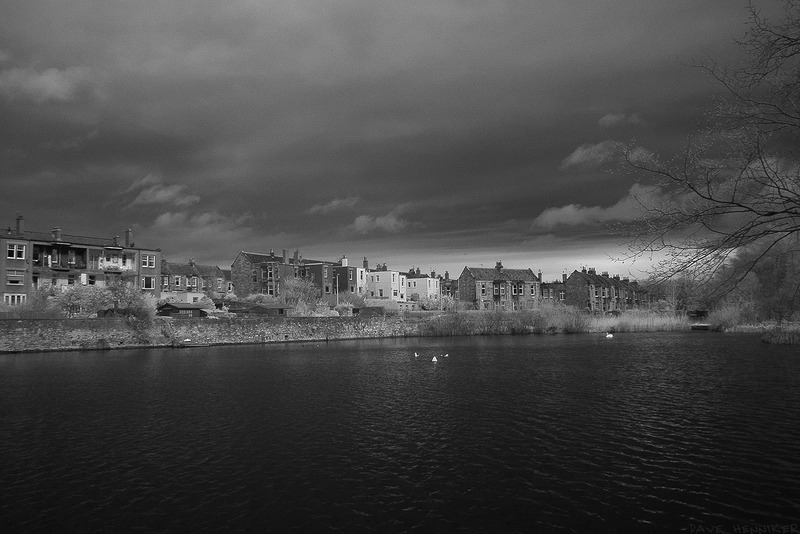 Compare this and the next picture taken in normal colour. 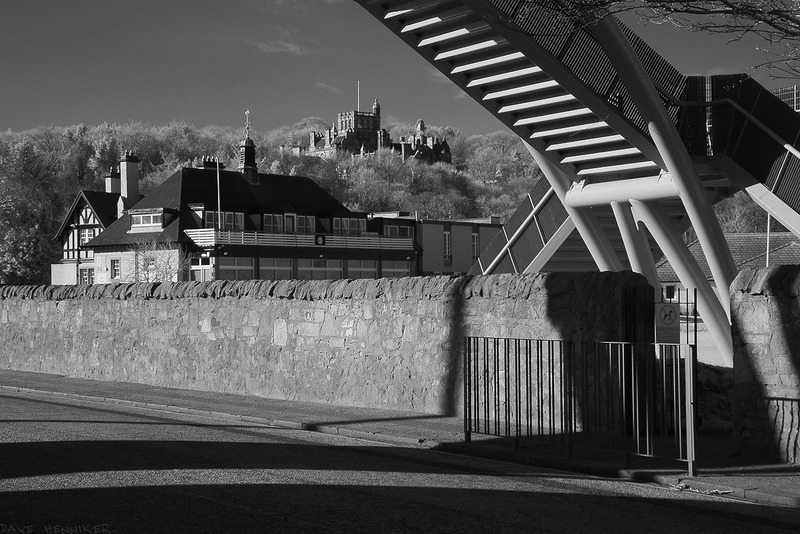 A slightly wider angle for this view of the same subject. 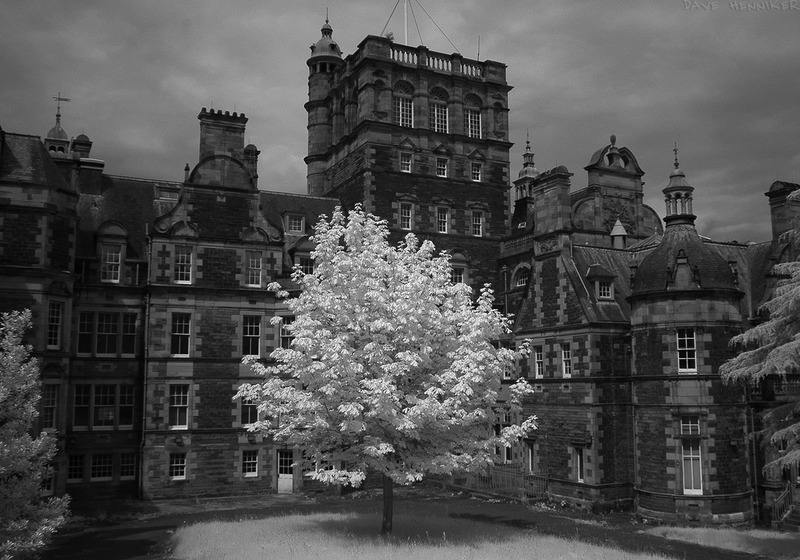 In infrared this tree seems to glow impressively in the quadrangle. 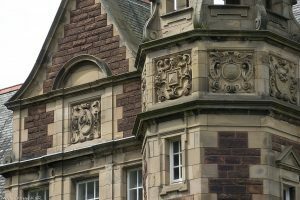 A closer look at some of the carved detail in the stonework. 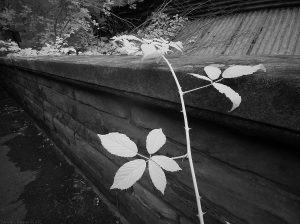 Left to its own devices nature gradually takes over. 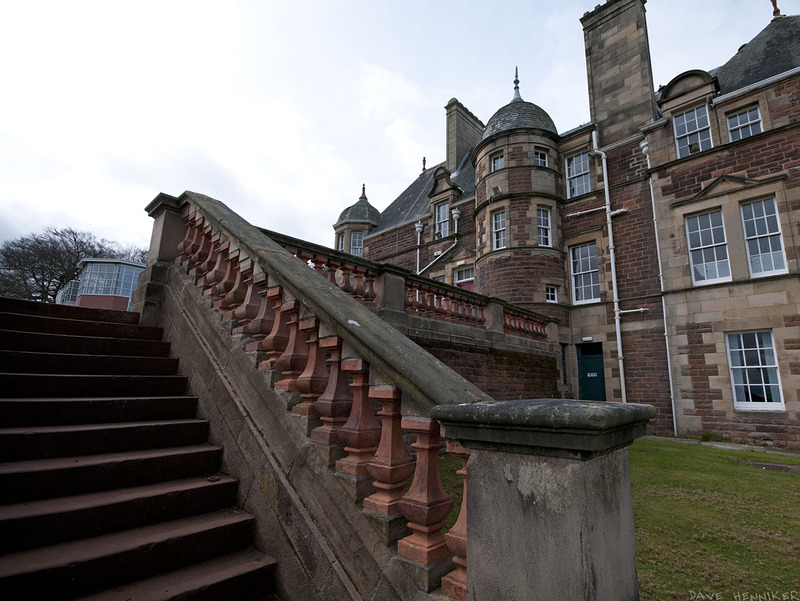 A gazebo at the back of the building. 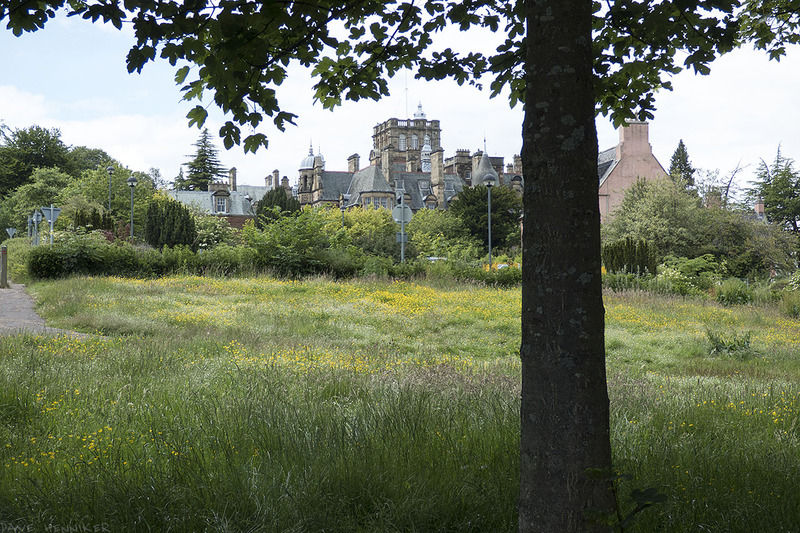 From the top of the hill a view north towards the green turrets of the former Donaldson's building. 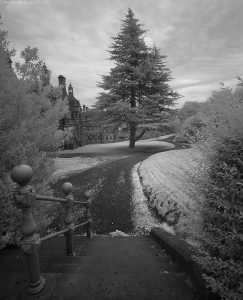 On the main driveway, descending eastwards. Nature encroaches on the corrugated iron roof. 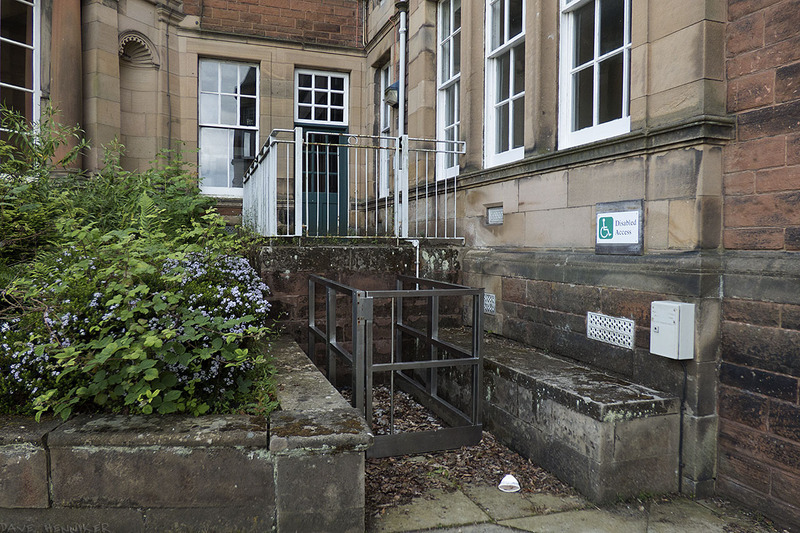 Not far away, the Disabled Access device lies unused. 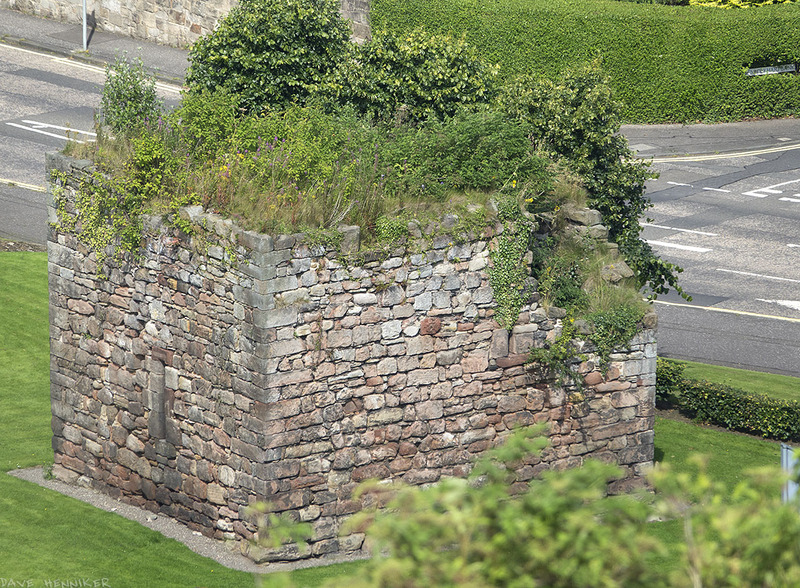 The statue of Napier has been removed and weeds sprout from its plinth. 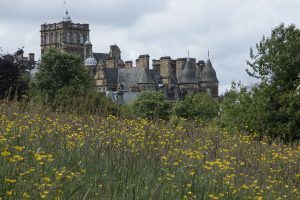 15 August 2016 better weather got me exploring Wester Craiglockhart Hill. 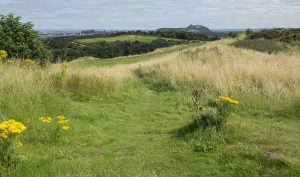 Blackford Hill is due east. 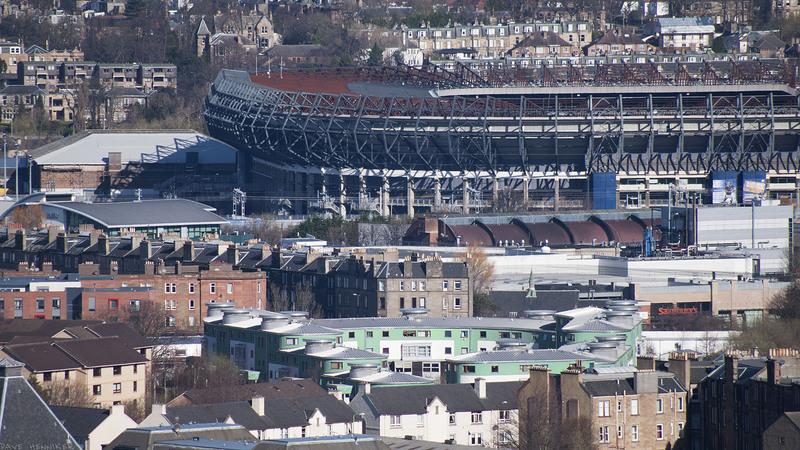 Zoomed in on Morningside. 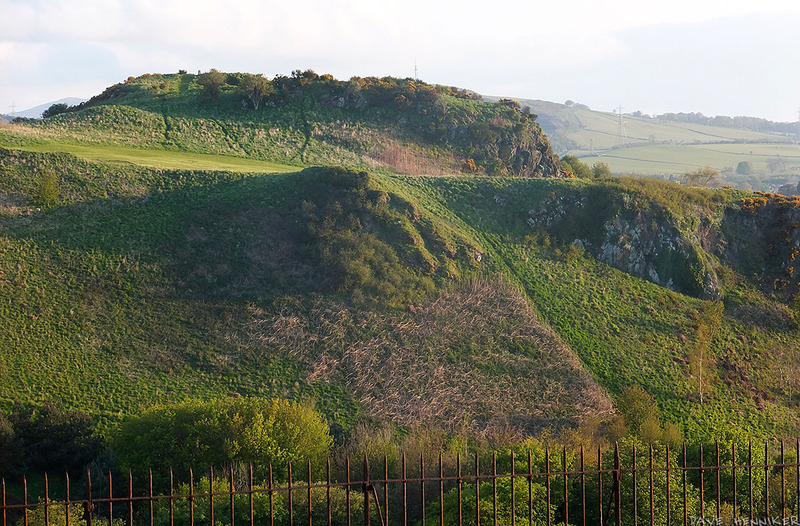 Merchants of Edinburgh Golf Club dominates the Craiglockhart Hills area and makes access here difficult. 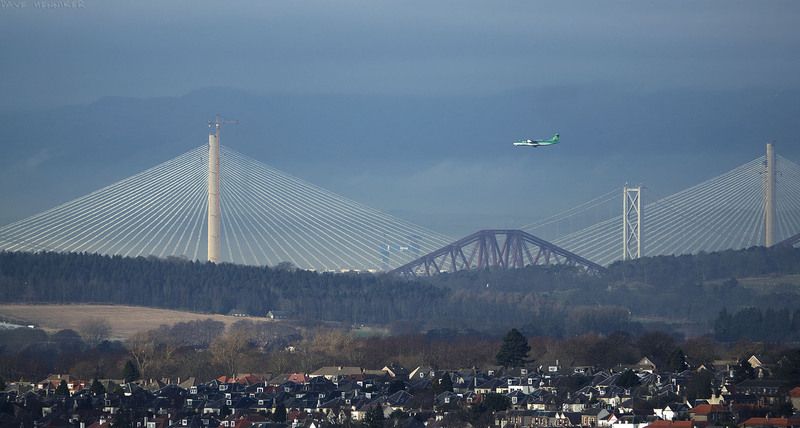 The view to the Forth Bridges. 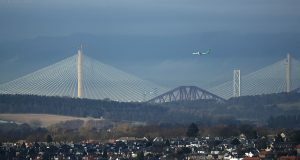 Zoomed in on the rail bridge, the original Forth Bridge. The street on the right is Comiston Drive. 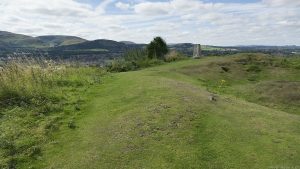 Blackford Hill lies beyond. Zoomed in on Comiston Drive. 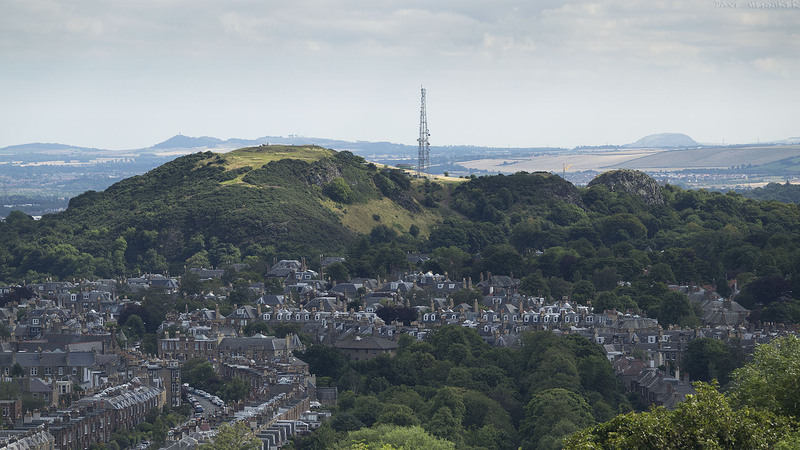 A wide view from near the summit showing Edinburgh Castle and Arthur's Seat. 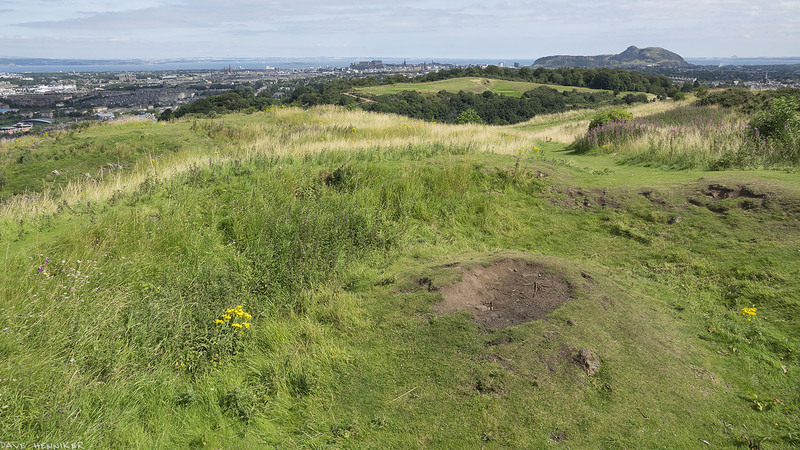 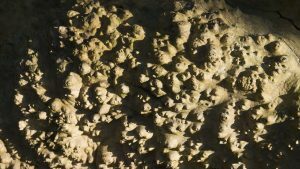 Signs of early human activity here were obscured by WW2 gun emplacements. The view to Howden Glen in the Pentland Hills. 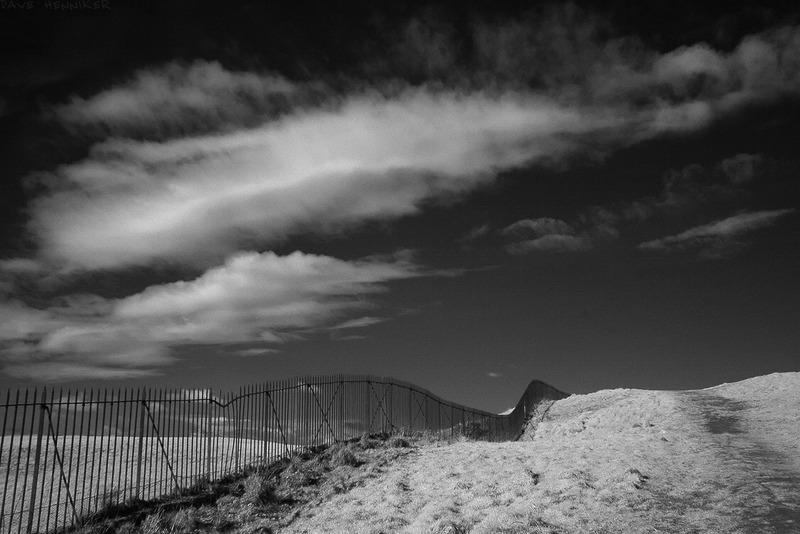 Just below the summit with the Pentland Hills behind. 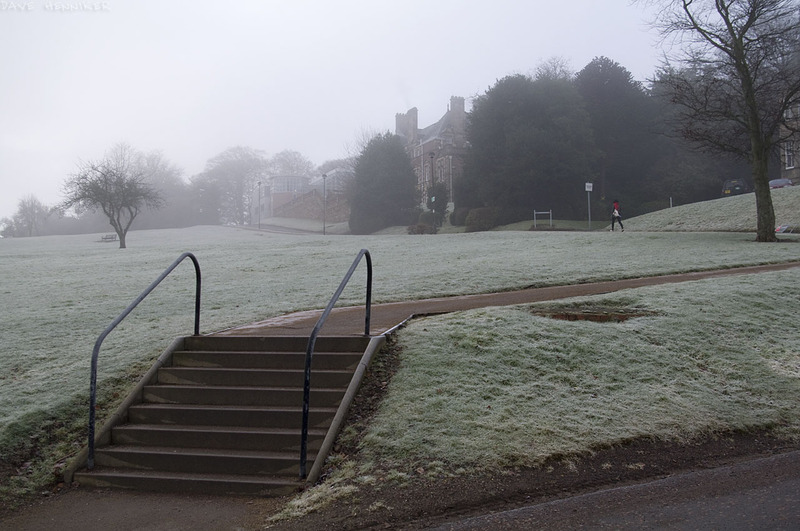 The path down to the right brought me closer to the campus but led no further. 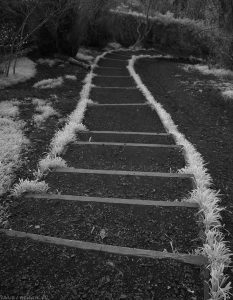 I got a closer look but had to retrace my steps. 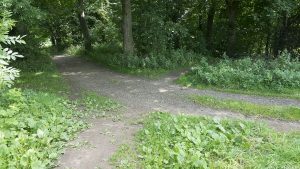 Turning left here led me downhill to the north. 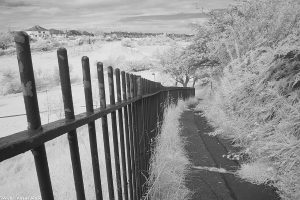 The path down to Glenlockhart Road. 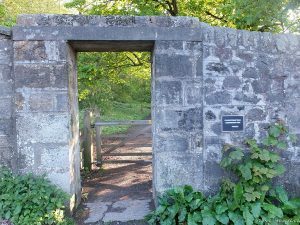 This is the best place to start and finish a walk. 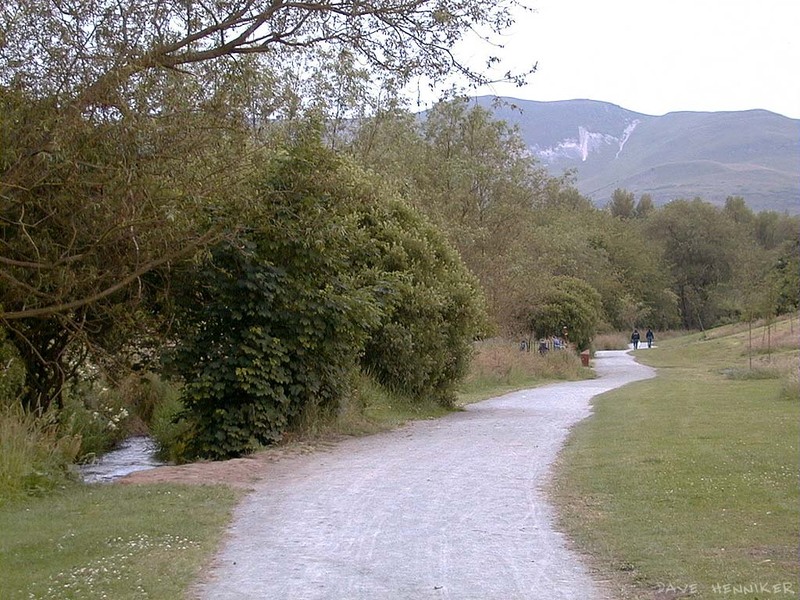 A footpath on the other side of the road leads down to the 36 bus terminus. 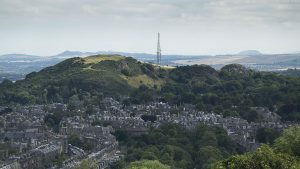 Craiglockhart Hill West photographed from Craighlockhart Hill East. The distant hill is Whitehill which overlooks Bonaly. 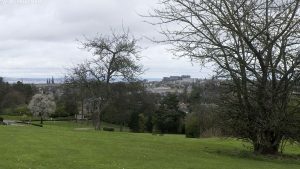 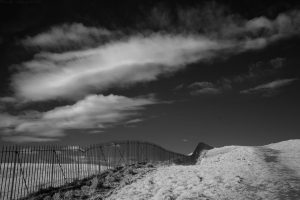 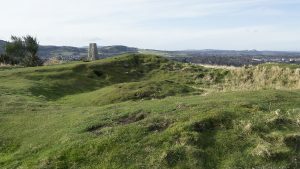 The summit of Wester Craiglockhart Hill. 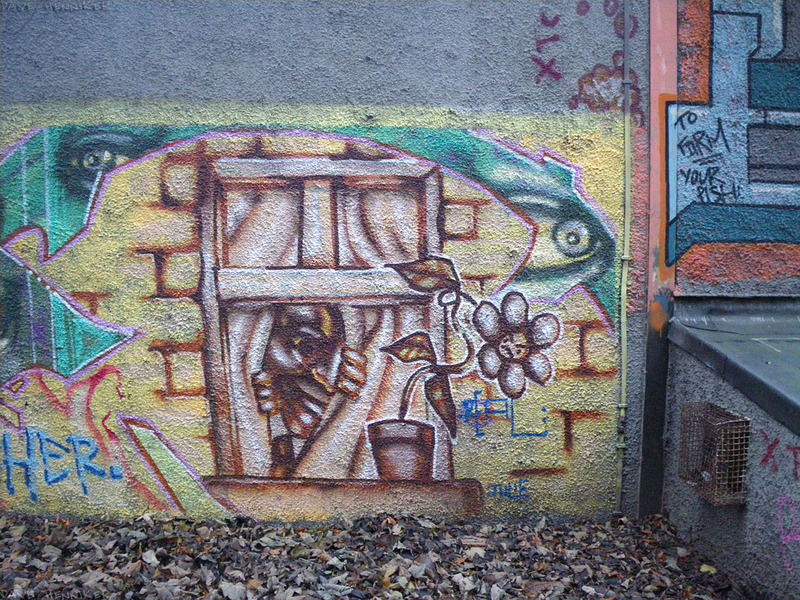 Click the download icon for the original large size 5200 x 3592 pixels. 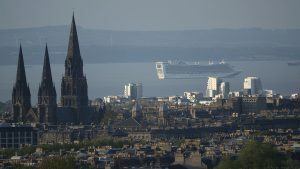 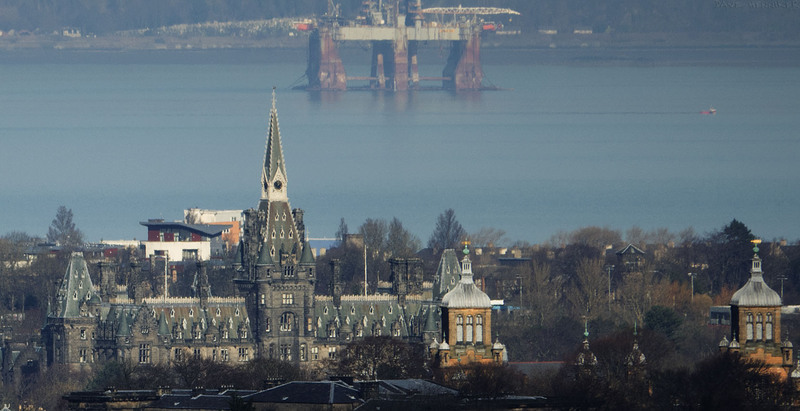 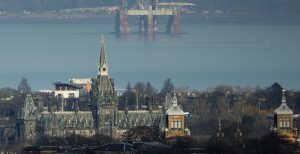 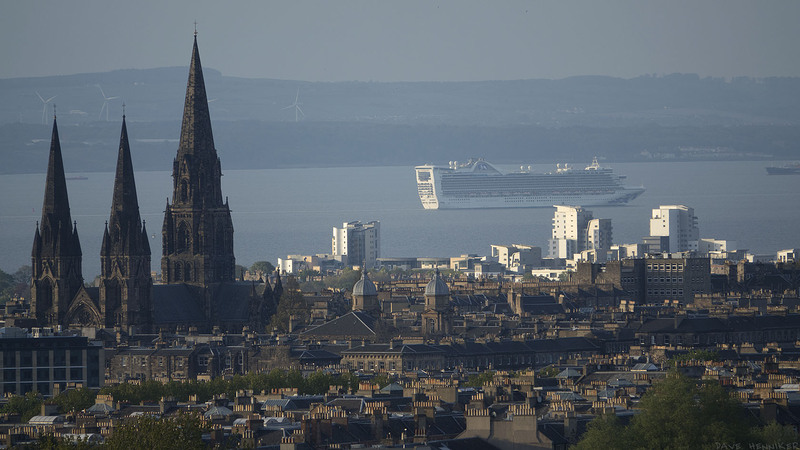 Long lens shot juxtaposes Fettes College, Daniel Stewart's College and an oil rig. Dusk over the Firth of Forth as viewed from Craiglockhart. 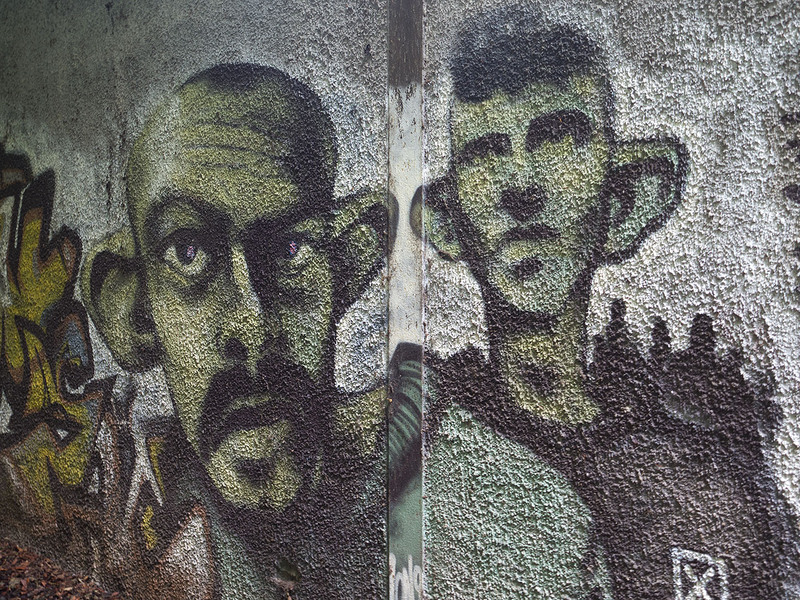 It's faded a bit since the 2005 photo near the start of this gallery (23 years).